Hi my name is Bergþóra Ólöf Björgvinsdóttir and I am 19 years old. I live on an island called Heimaey in the archipelago Vestmannaeyjar in Iceland and I´ve lived there my whole life. 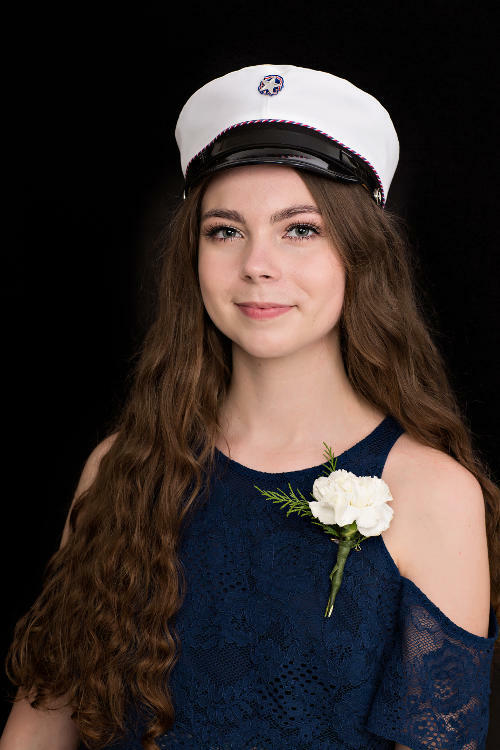 I graduated from upper secondary school (framhaldsskóli) in December 2017 but didn't quite know what I wanted to learn in university so I thought Fab Academy would be great preparation for further studies. I am interested in becoming an architect and I think Fab Academy will help me with that or whatever I choose to do. I have taken a few classes in Fab Lab throughout my education and I am excited to continue learning in Fab Lab. I think Fab Academy will give me new perspective on things and also help me to become more open minded to new ideas. When I finish Fab Academy I'm hoping I will have gotten to know a lot of new people from all over the world and that I will be able to make (almost) anything. The assignment for the 1st week was to come up with ideas for a final project. There was a lecture from Neil about principles and practices. I started working on ideas for a final project and kept on doing that for the rest of the week. Then later on in the week there was a lecture about version control (git, gitlab, github, and more) from Fiore Basile. I had the idea to make a model of an interactive house with an unusual structure. The house will be in the shape of a triangle with three walls, two of which will be like retractable folding doors. It will have temperature sensors which will control whether the house is open or not. When the temperature reaches a certain point the folding doors/ foldable walls will open up. If you don't want the foldable walls of the house opening up for example when you are not home you can disable the temperature sensors and control when it opens with either a remote or an app on your phone. The foldable walls will be airtight with rubber seal strips similar to those in doors. I am also thinking of including some other sensors like a humidity sensor that detects when it's raining and closes the foldable walls and a motion sensor that turns the lights in the house on when it senses motion. The motion sensors will be turned off when the foldable walls open because there is no need to have the lights turned on when it is open. But since it isn´t really practical to have the whole house opening up i was thinking of making a window that opens up when the temperature in the house reaches a certain point. Also including humidity sensors and some sort of sensor that can tell at what setting the radiator is on. The humidity sensors will detect rain and the window will close. The other sensor will controll the setting on the radiator. That will safe energy and lower electricity- or water bills (depending on what kind of radiator it is) by not letting unnecessary energy go out the window. The assignment for the 2nd week was to work through a git tutorial and build a personal site in the class archive describing ourselves and our final project. This week there was a lecture about version control (git, gitlab, github, and more) from Fiore Basile and from Neil Gershenfeld about project management. I created a SSH Key following these instructions from Linda Wanders which helped a lot and added it to my gitlab following these instructions. I started creating my website. I downloaded a ready made website from Start Bootstrap and used Brackets to change the HTML to fit my preferences. 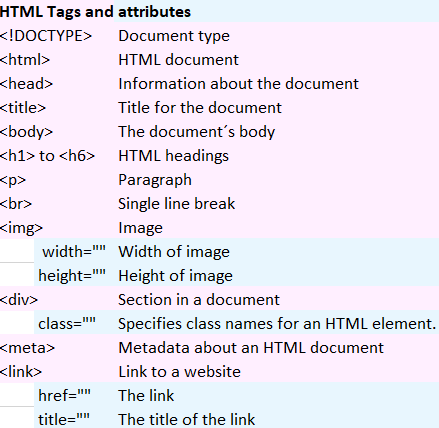 The template I used was a portfolio and I´m using the portfolio modals for the documentation of the weekly assignments. Since there were only six portfolio modals I copied them and pasted until there were 22 modals. But I ran into some problems defining the new modals. After reading some more about HTML I figured out that I just needed to change the numbers in the names of the modals both in the portfolio grid and the portfolio modals. To add images I created a new folder where I kept all the images and linked to them using html commands. To add files I did the same thing, created another folder, and linked to the files. But I had some trouble with putting images on to the site and adjusting the size and the location of the images. But after I read these and these instructions I managed to put all the images I wanted to put on to the site. To compress the images so they wouldn't take up to much room when I upload it on to the site I used Gimp. To add links into a sentence I wrote what´s written on the image below into Brackets. When I had finished doing what I wanted to do on my site for now I opened Git Bash and created a new folder where the information about the site is going to be stored still following the same instructions I used to create the SSH Key. 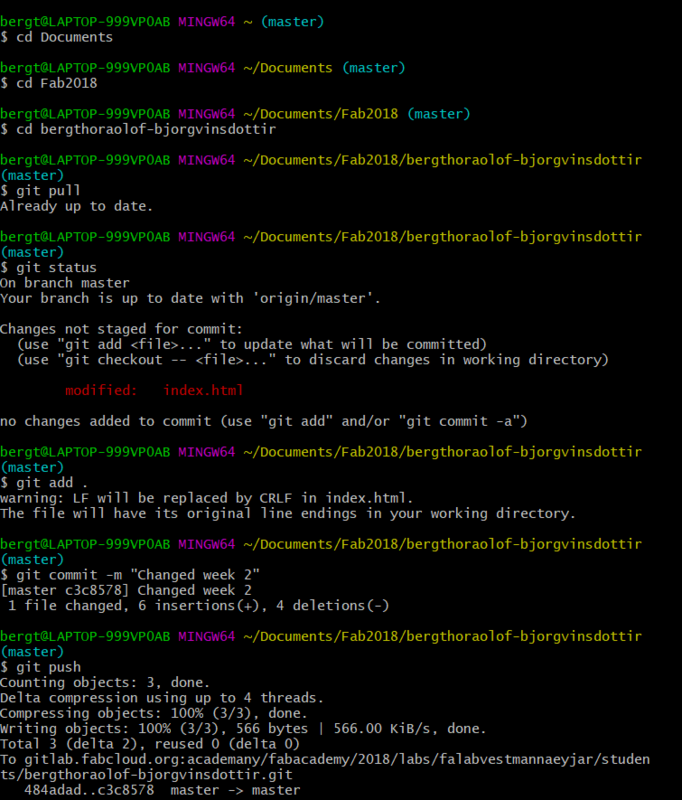 I got the link to my repository from GitLab and pasted that into Git Bash. 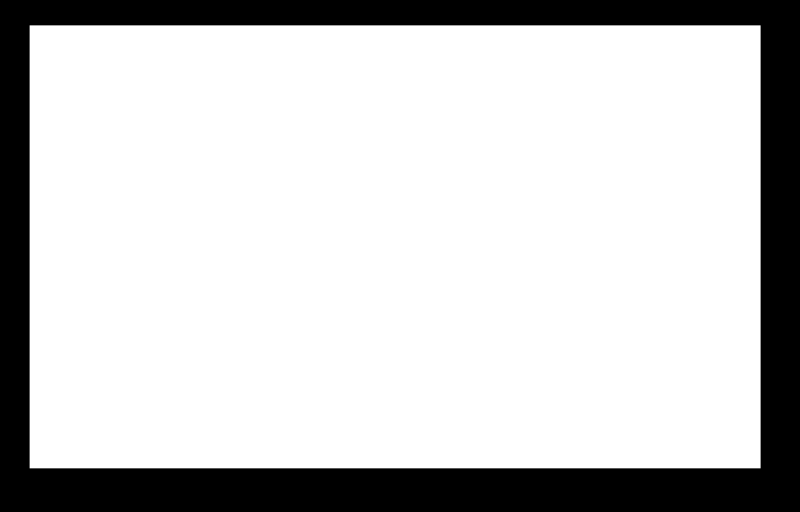 git commit -m "added web"
Now any time I make changes to the website all I need to do is to write what's on the image below. 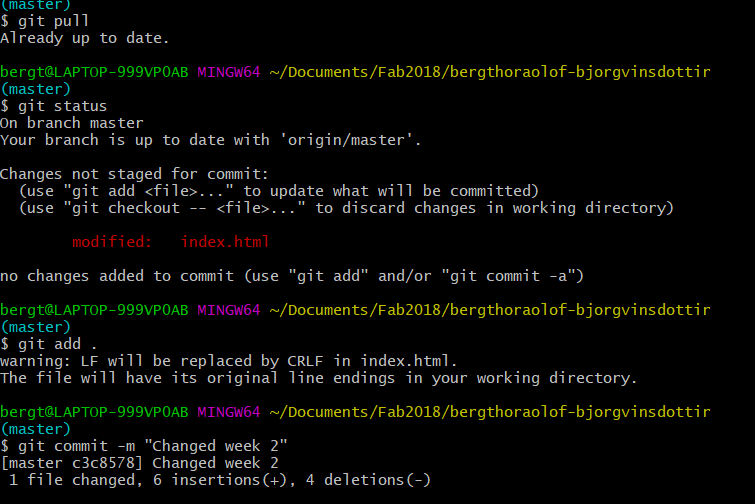 Git Bash and GitLab: Version control systems. Brackets: Editor with primary focus on web development. The assignment for the 3rd week was to model a possible final project and post it on the class page. I started with drawing the final project on a piece of paper, scanned it in and used Gimp to compress the image. 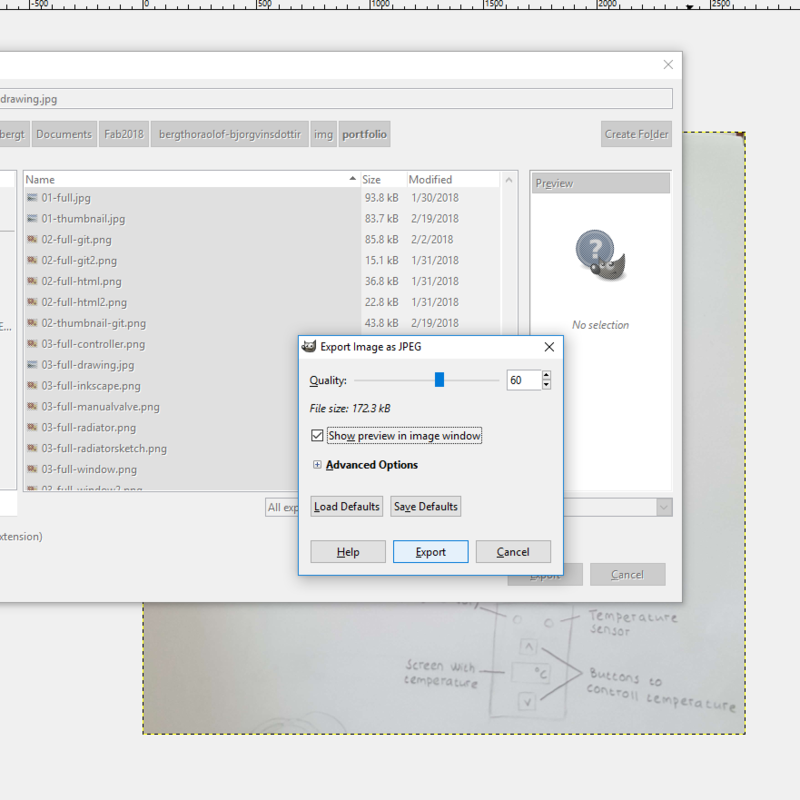 To compress an image in Gimp all you have to do is open the image in Gimp, select File - Export as, write the name of the image and select export, write in the quality you want the image to be in and press export. 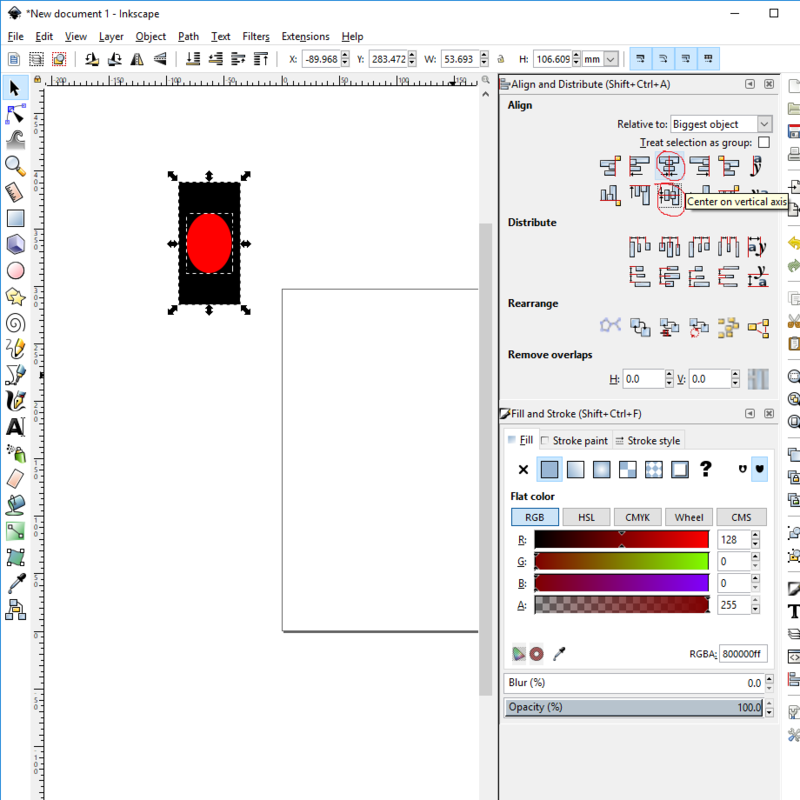 I had worked with a 2D software called Inkscape before so I drew a sketch of my final project there. Here is a photo of the sketch. 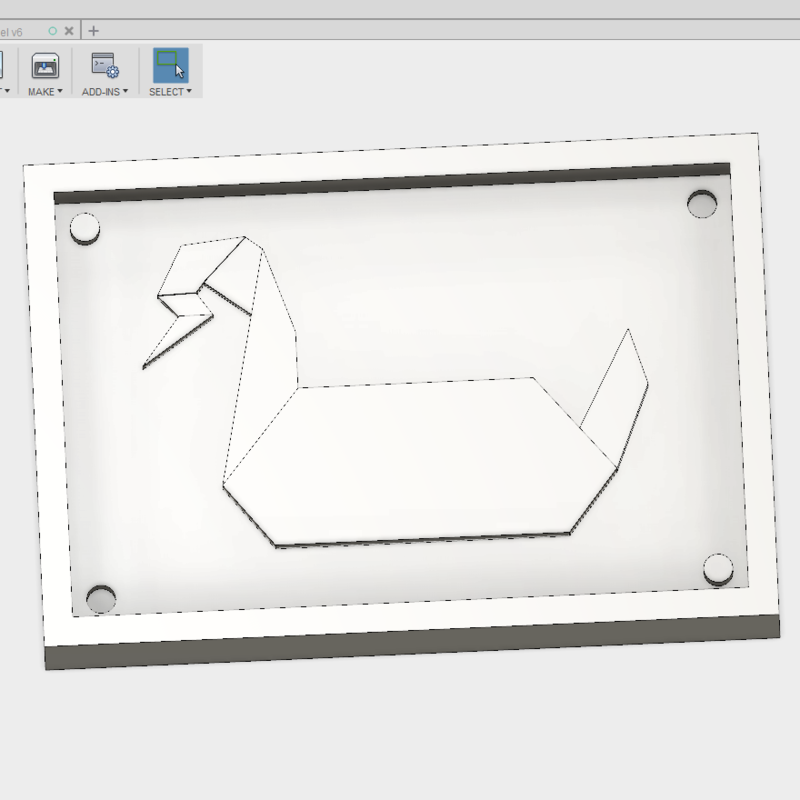 Inkscape is a pretty easy software to learn how to use and therefore it is often used to teach kids in the fablab. 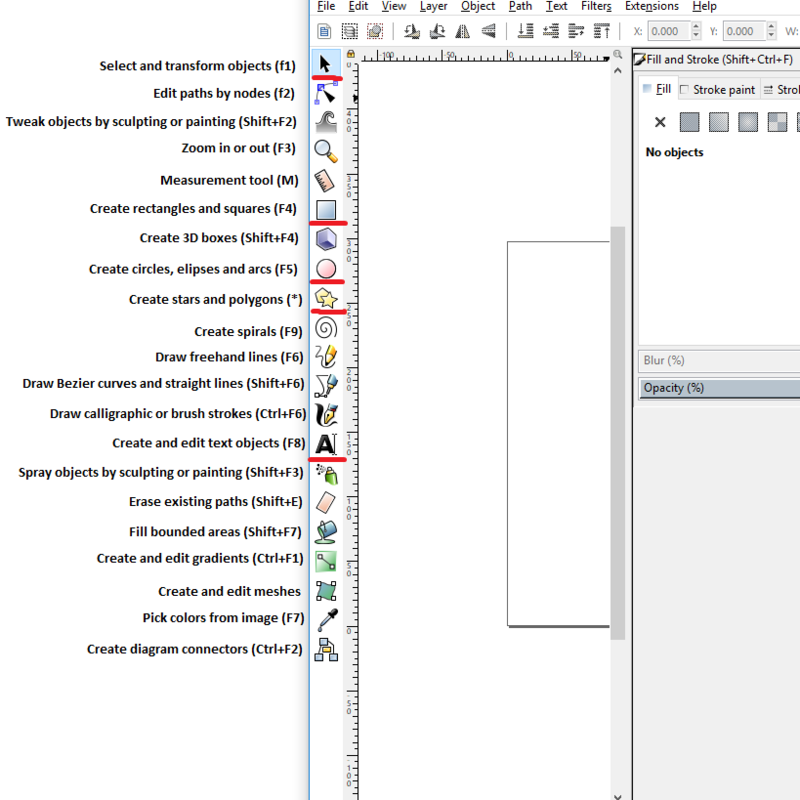 The main thing you have to have have in mind when using Inkscape is the toolbar on the left side. Here is an image explaining the tools on the toolbar and its shortcuts. I have circled the tools I have been using the most. Another thing I use quite frequently is Fill and stroke. There you can change objects and strokes colour, blur, opacity and more and set the stroke style. When you are using inkscape to make pdf files to cut in the lasercutter or the vinylcutter you have to make sure that the fill is turned off, the stroke paint is fully red (R-255, G-0, B-0, A-255) and that the width of the lines is 0,02. To align the objects I use Object-Align and Distribute. 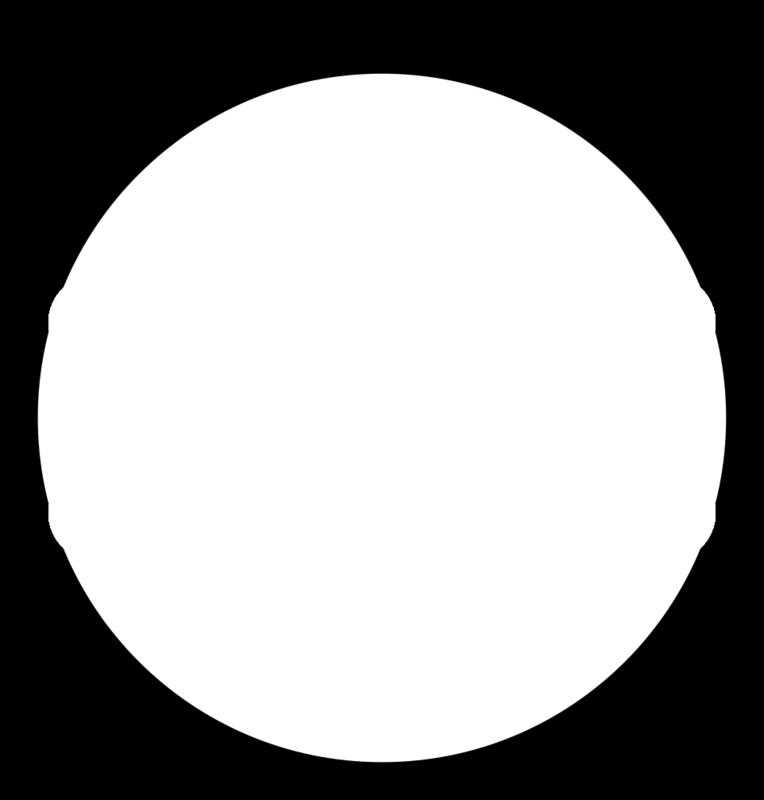 For example like on the image below where the circle is centered in the middle of the rectangle. There I used the two alignments I circled and chose to have it relative to the biggest object (the rectangle). 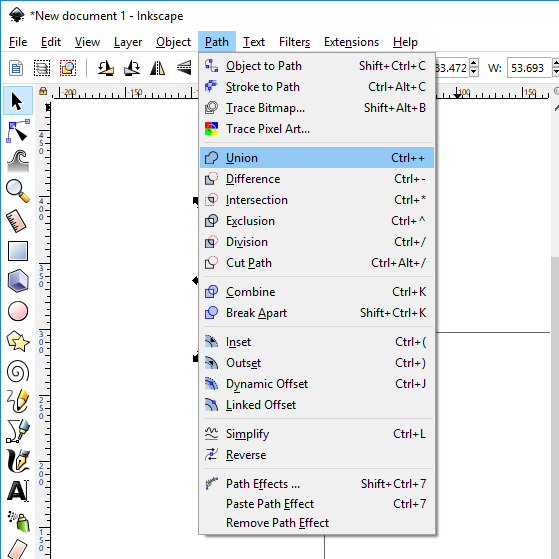 I also often use Union, Difference, Intersection, Exclusion, Division and Cut Path from the Path dropdown menu. Then I moved on to a 3D software called Fusion 360. I had never worked with Fusion before so I wached some tutorials for Fusion beginners. I watched a few videos in this playlist which has videos in icelandic, but also watched some in english including this and this video . I also recommend watching videos from Lars Christensen because he has some really nice videos on Fusion 360. When I had gotten a basic understanding on how Fusion 360 works I started creating the 3D model of my final project. 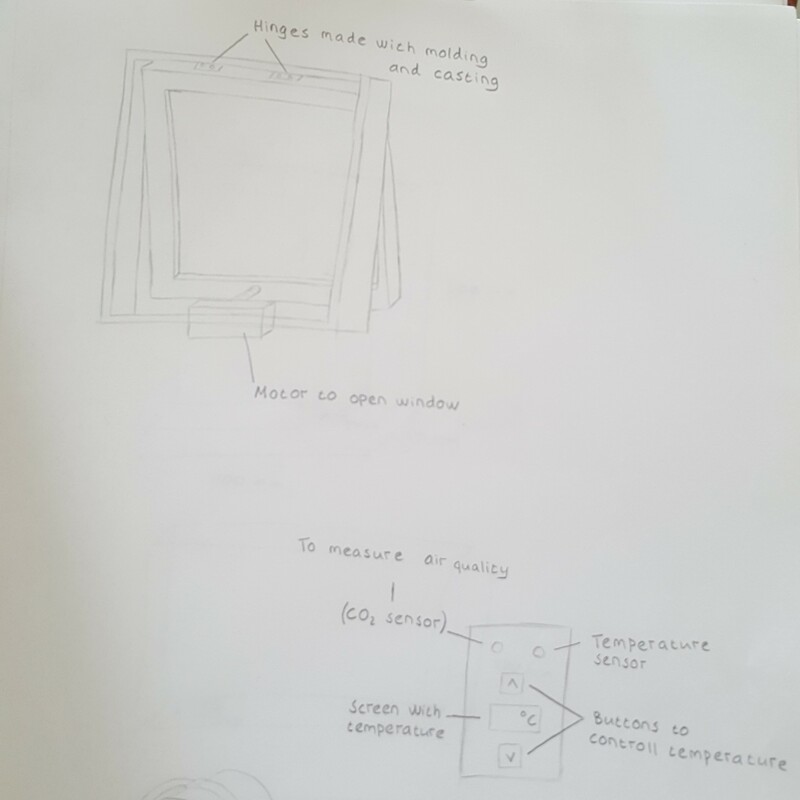 My final project consists of a window that is controlled by temperature sensors that open it with motors when the temperature in the room reaches a certain point and an object that you can fasten on the manual valve on a radiator and controlls the setting on the radiator, with motors, depending on the temperature of the room. 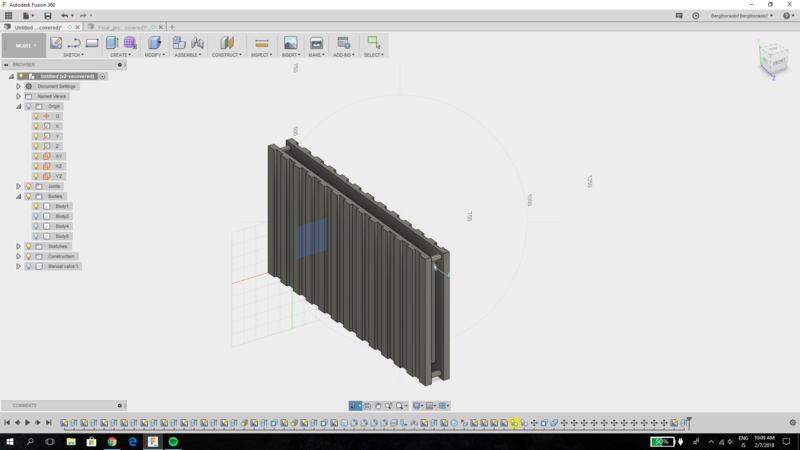 I made the radiator in Fusion by creating a 2D sketch with cutouts on the side and so that I wouldn't have to create all the cutouts myself I used mirroring. Then I created a new design for the window. I used mainly the same features, pull, push, joints and more. To make the glass on the window seethrough I went into Render and chose the material for that component in apperance. 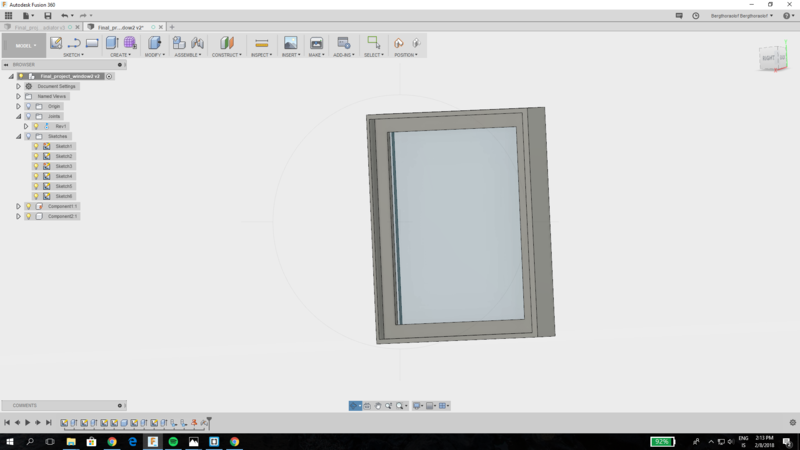 I am going to create joints on the window so you can open it, here is how the window looks now. I struggled a bit with making the joints on the window so it could open but I figured it out that joints could only be made between two components so I created components from the bodies. I locked the part of the window that I didn't want moving in place by rightclicking on that component and clicking Ground. 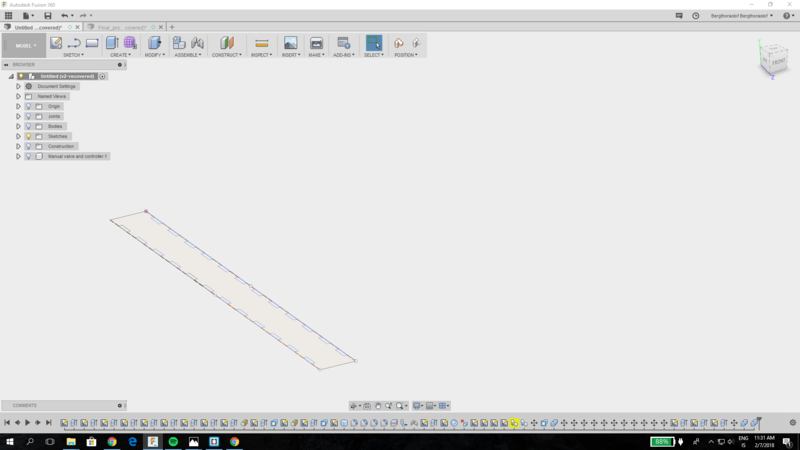 Then I created a revolute joint about the z-axis. Final project window , f3d file from Fusion 360. Final project radiator fd3 file from Fusion 360. 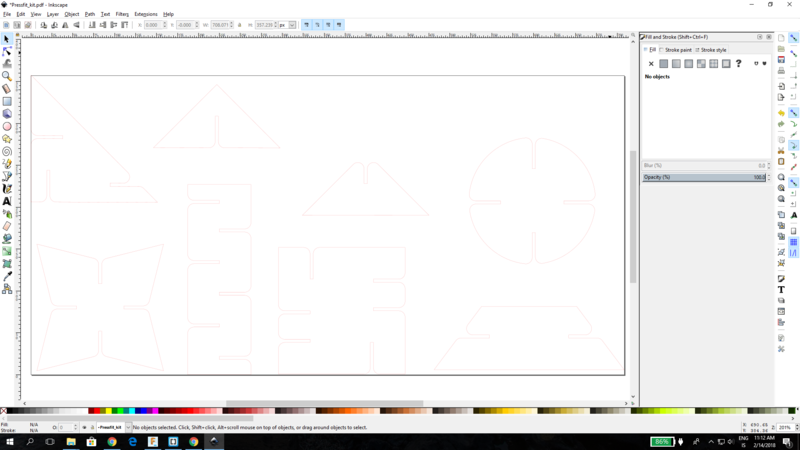 Final project inkscape svg file from Inkscape. There were two assignment for the 4th week, a group assignment and an individual assignment. 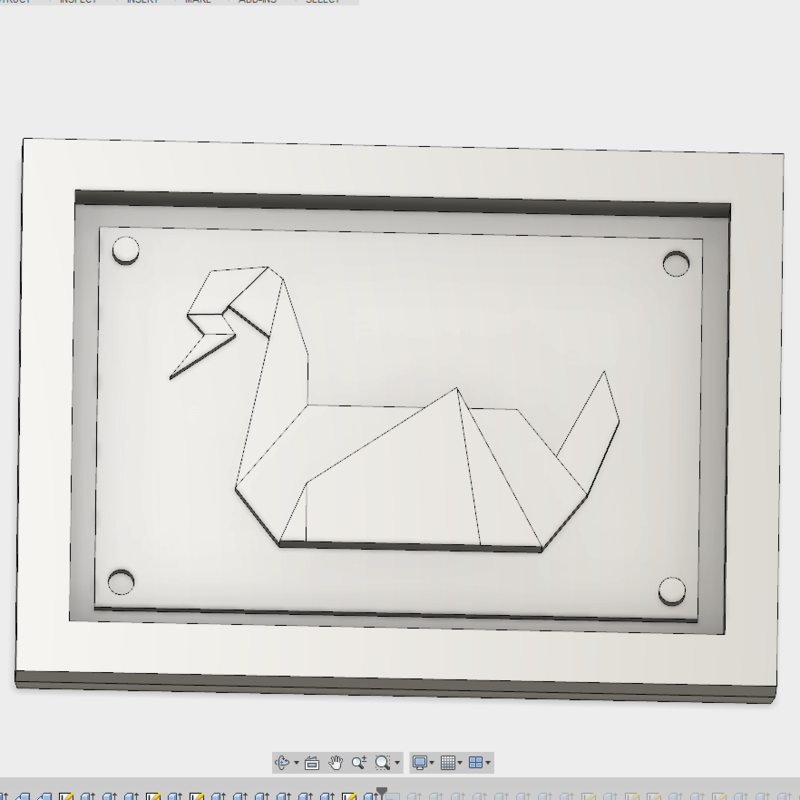 The group assignment was to characterize our lasercutter, make test part(s) that vary cutting settings and dimensions. 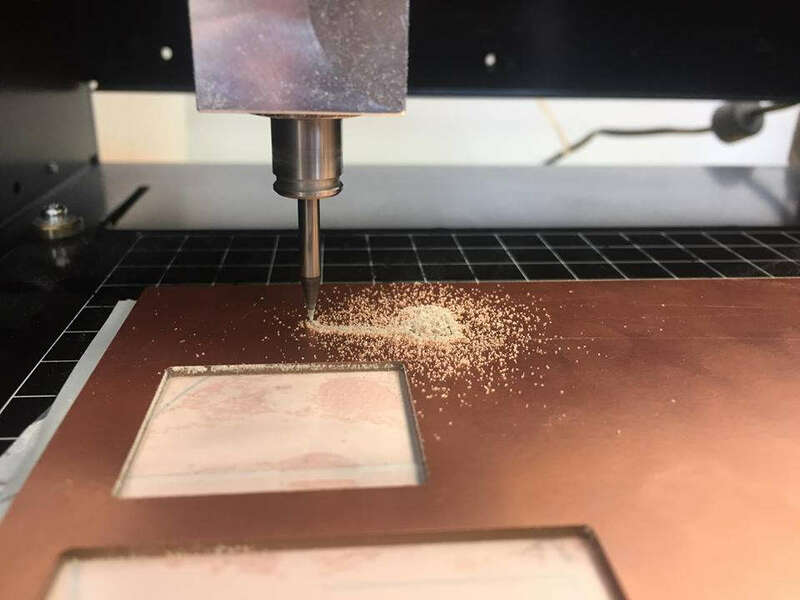 The individual assignment was to cut something on the vinylcutter, design, make, and document a parametric press-fit construction kit accounting for the lasercutter kerf, which can be assembled in multiple ways. The Press-fit test and the power and speed settings test are on the Vestmannaeyjar lab website . For this weeks assignment I wanted to create an abstract construction kit in Fusion 360. To make it parametric I created a parameter called thickness and wrote the thickness of the cardboard I was using. Then I sketched the the shapes I wanted for the kit and sketched the slots on top of that with the width of the parameter thickness. Now anytime I change the thickness of the material I am using both the thickness of the piece and the width of the slots will change. 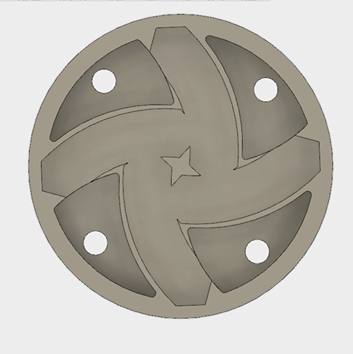 I decided to make chamfers so it would be easier to fit the slots together. To do that I put a fillet on the edges of the slots. 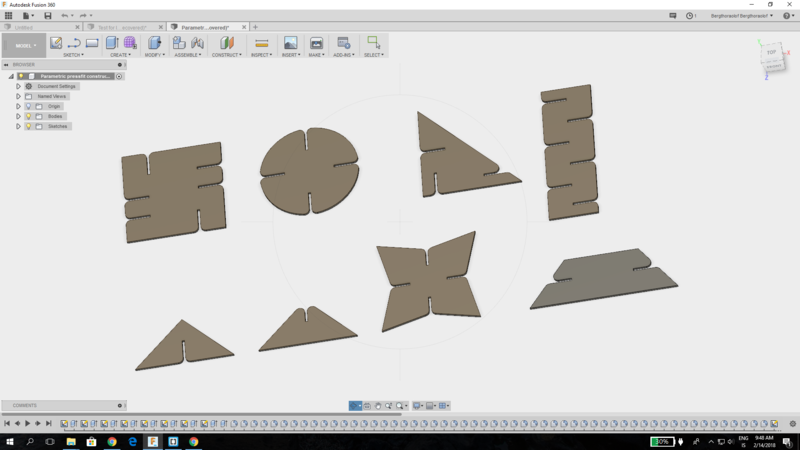 After I had finished the model in Fusion I created sketches on the planes I wanted to cut in the lasercutter and saved them as DXF. To get it ready for the lasercutter I imported all the files into Inkscape, went into fill and stroke set the stroke paint to red and the stroke style to 0.02 mm, saved it as pdf and cut it in the lasercutter. When I had made sure everything in the kit worked I cut out more of the shapes and tried assembling it in multiple ways. For the vinylcutter project I decided to cut a pattern to put on the sketchbook I use for Fab Academy because I wanted to decorate it. 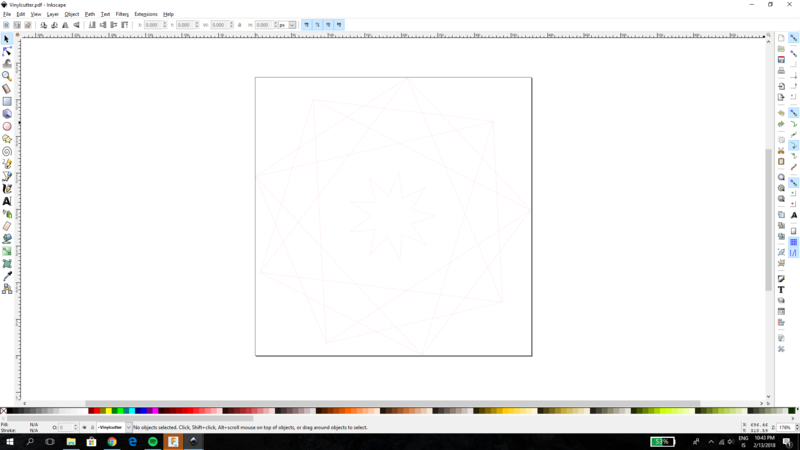 I went into Inkscape and clicked on the create stars and polygons icon. Then I just played around with the number of corners, the spoke ratio and how rounded it was. When I had figured out what settings I liked the most I dragged the corners of the star to make new shapes and then I added more stars. When I was satisfied with how the pattern looked I made the outlines red and 0.02 mm and cut it out in the vinyl cutter. Then I took the parts I wanted to come off with tweezers, put transfer tape on the sticker and used a scrape to move it on to the transfer tape. Now the sticker was on the transfer tape all I needed to do was to take the paper on the back of the sticker off and place it on the sketchbook. 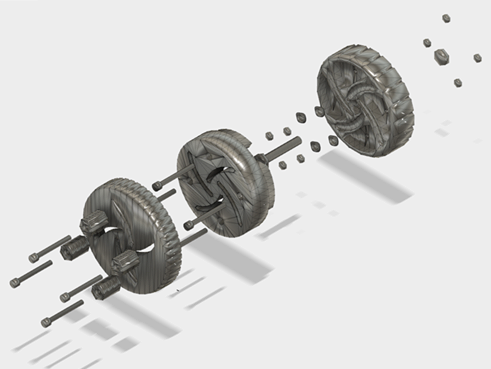 Parametric pressfit construction kit f3d Fusion 360. Pressfit kit pdf file ready to cut. Vinylcutter pattern pdf file ready to cut. The Linetest for the Modela Milling Machine is on the Vestmannaeyjar lab website . 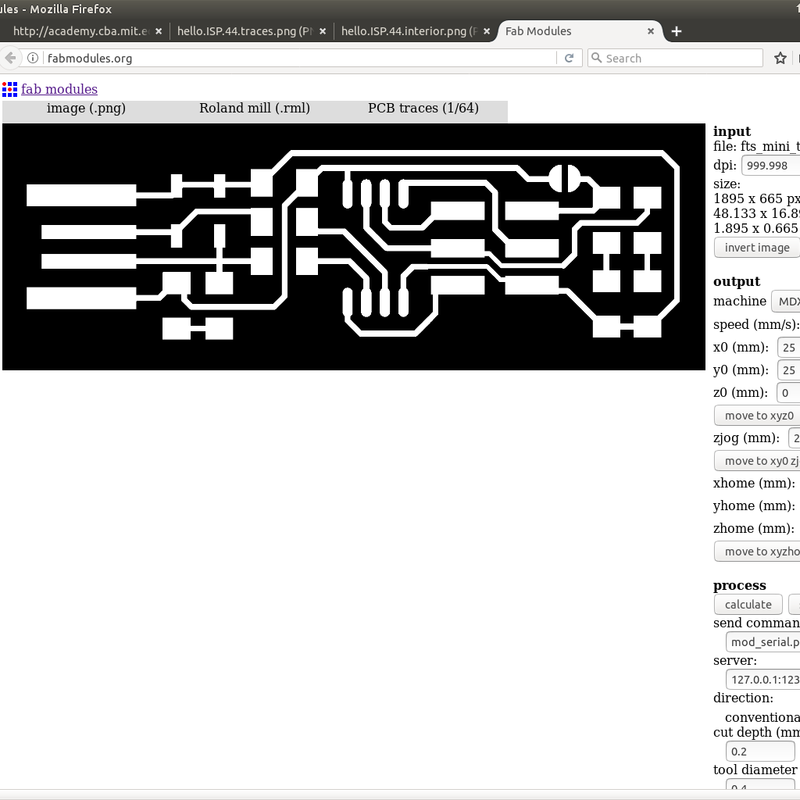 I downloaded the traces for the Fab Tiny ISP board. Then I changed the milling bit in the Modela milling machine to a 1/64” milling bit, turned the milling machine on and pressed view. 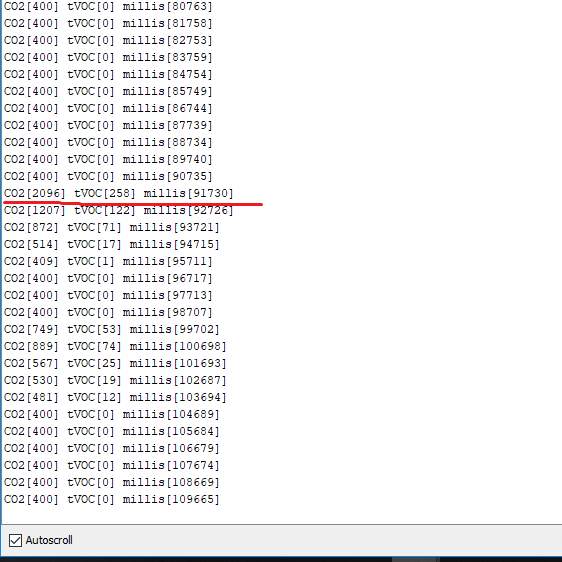 After that I opened a terminal and wrote the following commands in to it so that I could connect to the milling machine. 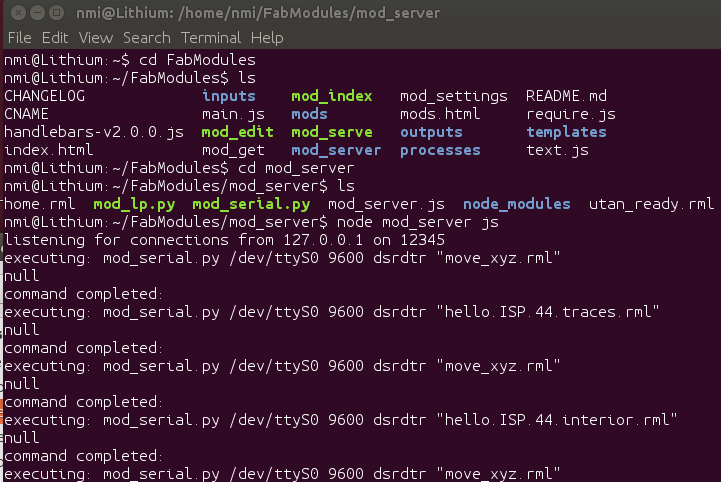 Then I opened Fabmodules.org and adjusted the settings for the milling. I set the location for the x, y, and z axes, changed the send command from USB to S because I was not connecting with a USB key and changed cut depth to 0,2. 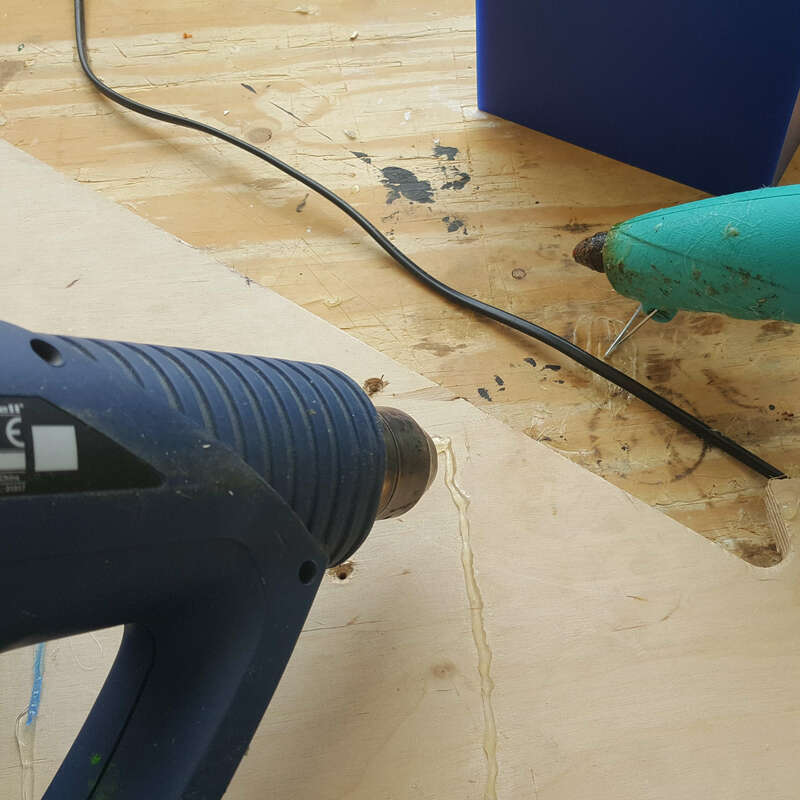 Then I loosened the milling bit and laid it carefully on the surface of the board making sure not to drop it to prevent it from shattering. I pressed calculate, made sure everything was correct and pressed send so the milling machine would start milling. I removed the shavings and followed the same procedure for the outline of the board, except changing the cut depth. 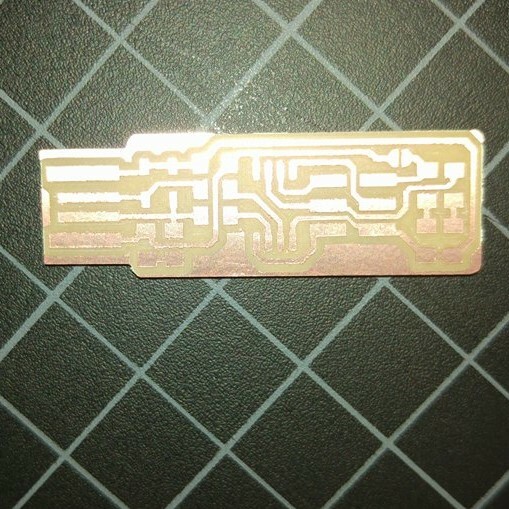 I downloaded the file, changed the milling bit to a 1/32” milling bit, changed the USB in send command to S, loosened the milling bit to make it touch the surface, pressed calculate and then send. After I had cut out the board I took it of the machine with a putty trowel and washed it with water and dish washing liquid. Then I removed the bit on the left end of the board showed on the images below. Here is a video in icelandic about how to use the milling machine. I had some problems with soldering the components on the circuit board since I had only done that once before. I couldn't get alot of the soldering to look shiny like it is supposed to but I made sure to test every connection when I had finished soldering it with a multi purpose meter. So although it doesn't look really pretty it works and I think I just need a little bit more practice in soldering. When the circuit board was ready I connected it to a computer to get power with a USB Extension because that is better than plugging it straight in to the computer. I also connected it to hello board with a ribbon cable to program with making sure the ribbon cable is correctly connected to the board (GND to GND). Then connected that board to another computer with a USB Mini like on the images below. To see whether the computer could recognize the Fab Tiny ISP I plugged it into the computer with a USB extension. When I plugged it in a window popped up saying a USB device had been plugged in. Then I opnened Device manager and could see the Fab Tiny ISP there under ports. 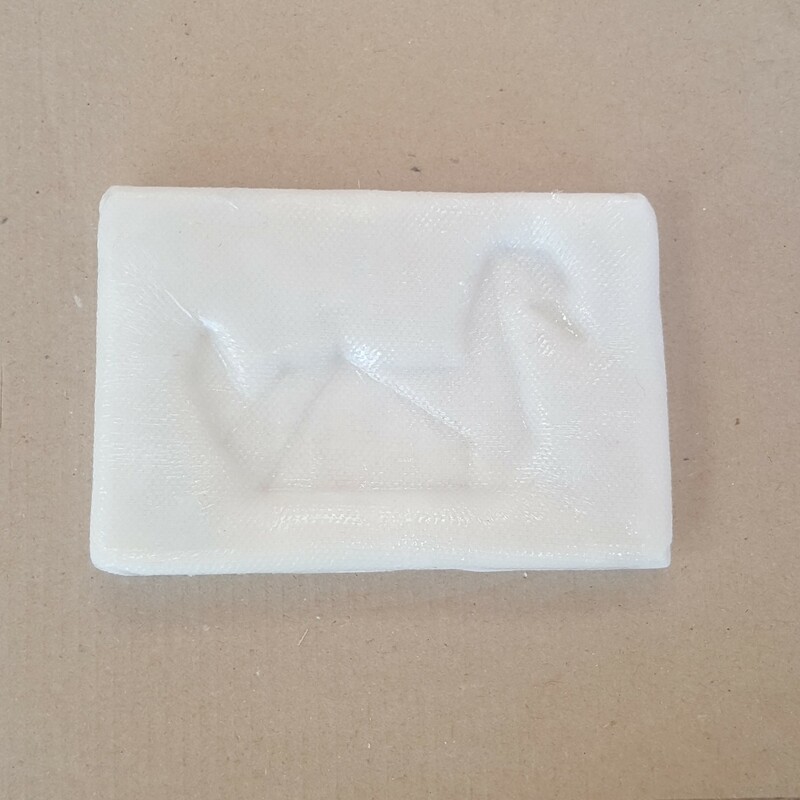 The group assingment for the 6th week was to test the design rules for our 3D printer. 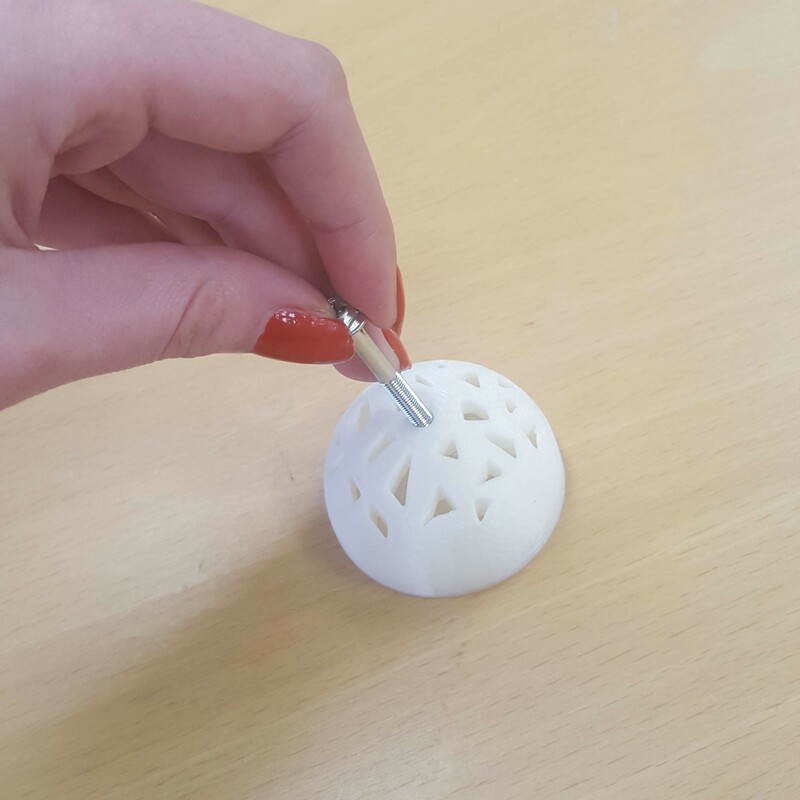 The individual assignment was to design and 3D print an object (small, few cm) that could not be made subtractively, 3D scan an object (and optionally print it). 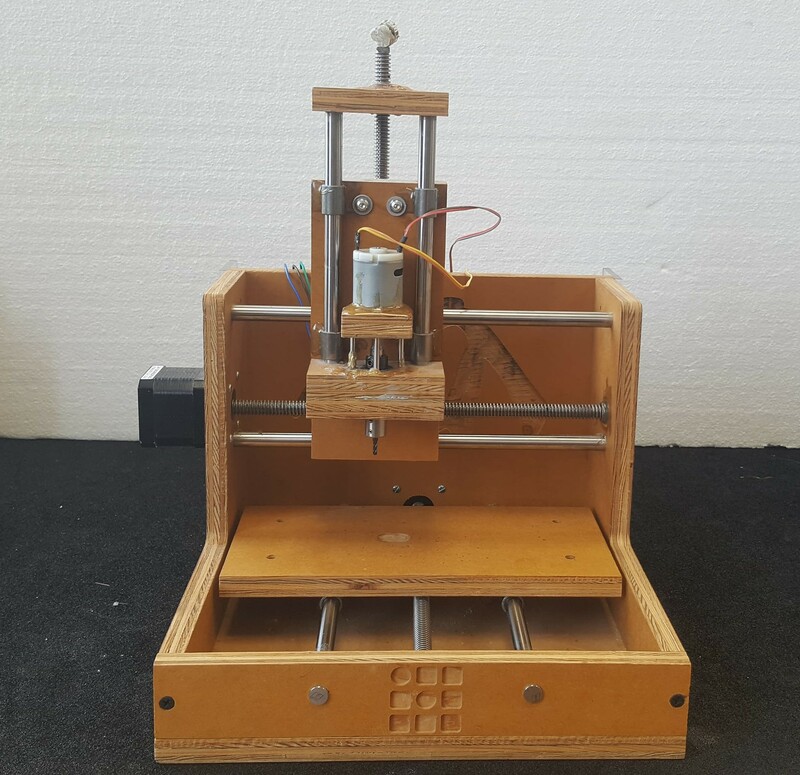 The test for the design rules for our 3D printer is on the Vestmannaeyjar lab website . 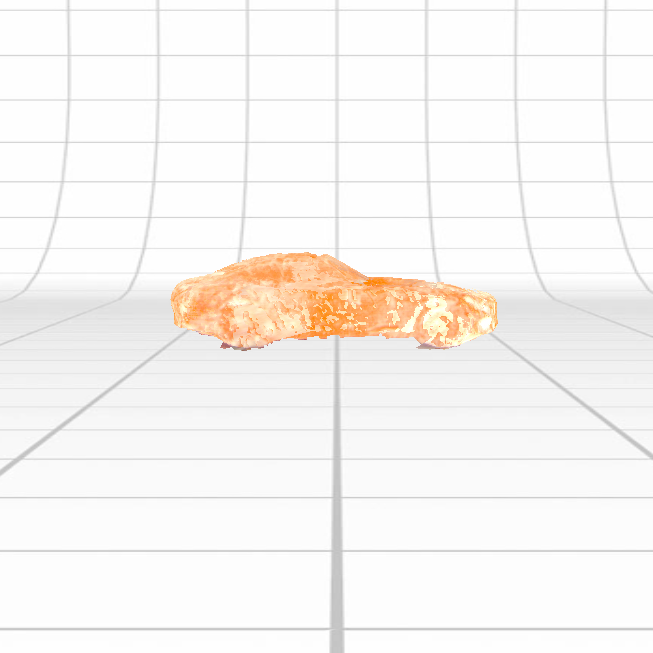 For the 3D scanning portion of the assignment I wanted to make a 3D model of my brothers favorite toy car and I chose to take pictures of the car and make a 3D model out of them. I placed the car on a table and because the 3D model is assembled using the changing surroundings between frames I placed a few small items like pencils and erasers around the car. To prevent flashback from the shining car I coated it in potato flour and made it matte. Then I took images all around the car from varying angles to get all the sides. I took out the surroundings and cleaned the model up. 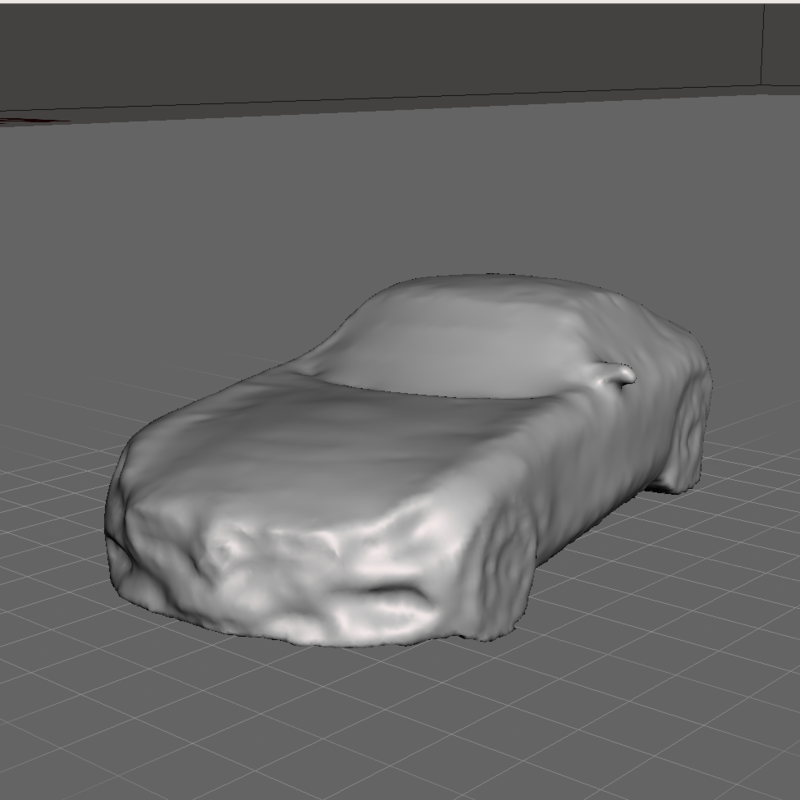 The surface of the car had gotten a little rough because of the potato flour so I used the smoothing function in surface tools to even it out. Then I exported it as obj and imported it into Autodesk Meshmixer to fill in the model since it was only a shell. When I had imported it into Meshmixer I realized that the model needed a little bit more smoothing so I went into sculpt, flatten and smoothed it out. I decided to 3D print the model of the car. I exported it as stl and imported it into Ultimaker Cura. In Cura I set the profile to fine and kept all the recommended settings for that except for two. I changed the support settings to generate support everywhere because the wheels of the car are the only things touching the plate. I also changed the build plate adhesion from brim to raft because I am used to working with that setting. 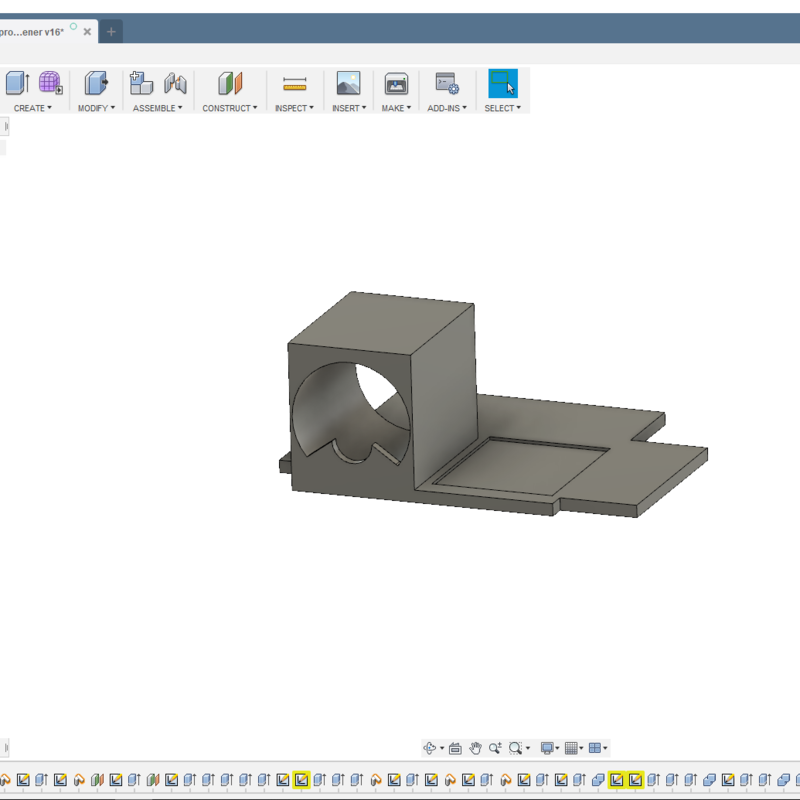 I had some trouble taking the supports of from beneath the car and I think that might have something to do with the settings for them in Cura. To take the most of the supports of I used pliers. But I felt like it was still too rough so I took some sandpaper and buffed the bottom of it. 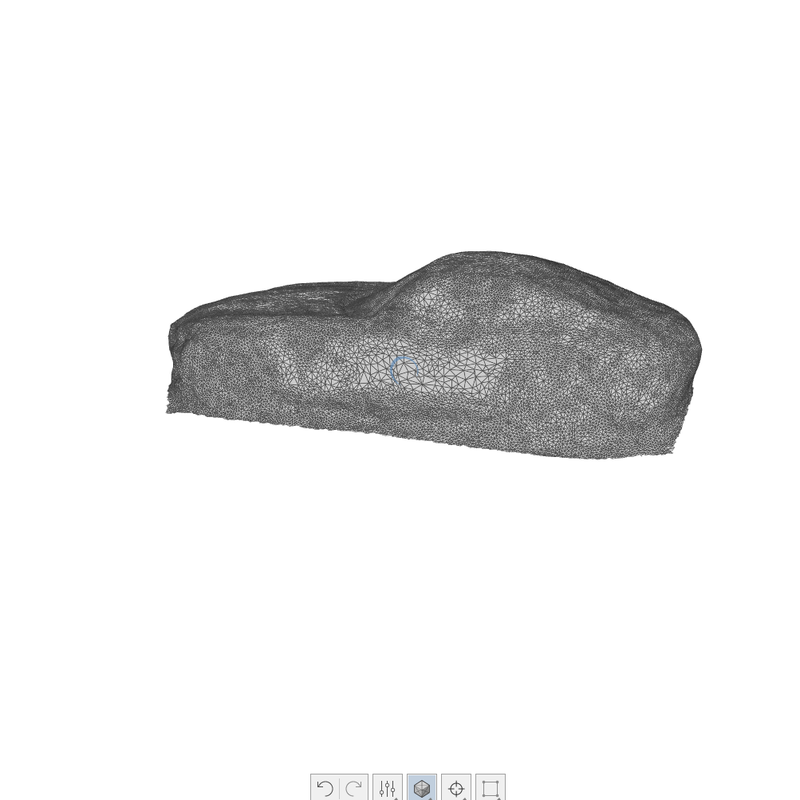 I wanted to try another 3D scanning technique so I decided to scan the 3D Printed car because then I could see how the level of error increased the more often I scanned it. I used the next next engine laser scanner to scan it and put some potato flour on it to limit the shine. The scan looked good from the sides. But when I looked at it from the top I could see that it had a lot of holes on the top and the bottom was completely missing. That happened because the scanner only scans from the side, it can't see the top well and it can't see the bottom at all. To be able to scan it properly it must be placed differently in the scanner so that most of the car is visible to the scanner. When I had finished printing the object it was pointed out to me that it could be made subtractively on a 3-axis CNC in 2 passes (top and bottom). Then I decided to make a few changes to the model so that it could only be made additively. 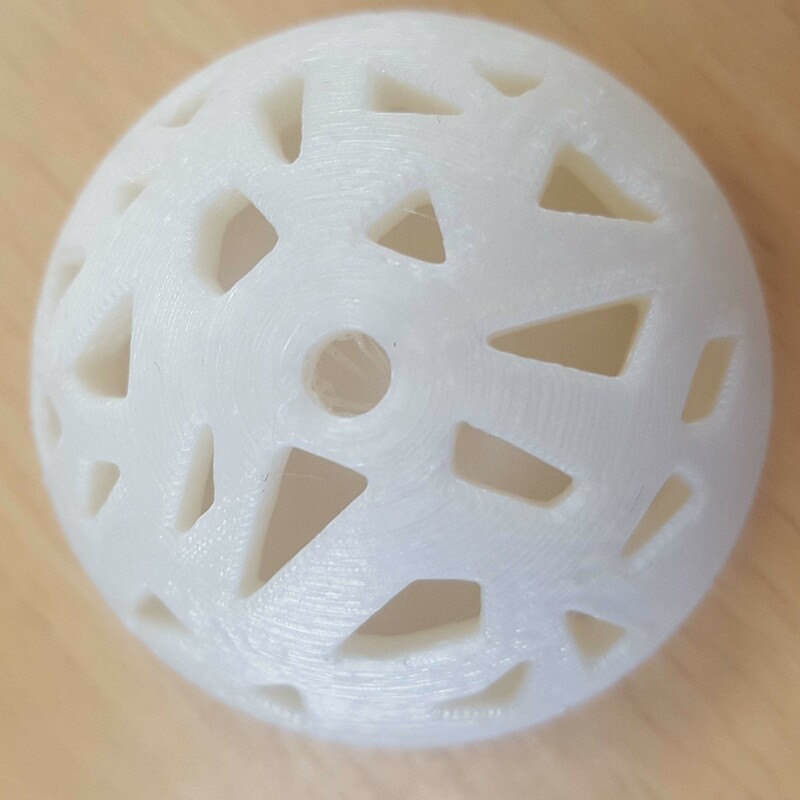 So that the bottom part (the inside of the sphere) could not be made by milling each side separately and turning the material over between passes I decided to make the bottom part flat. 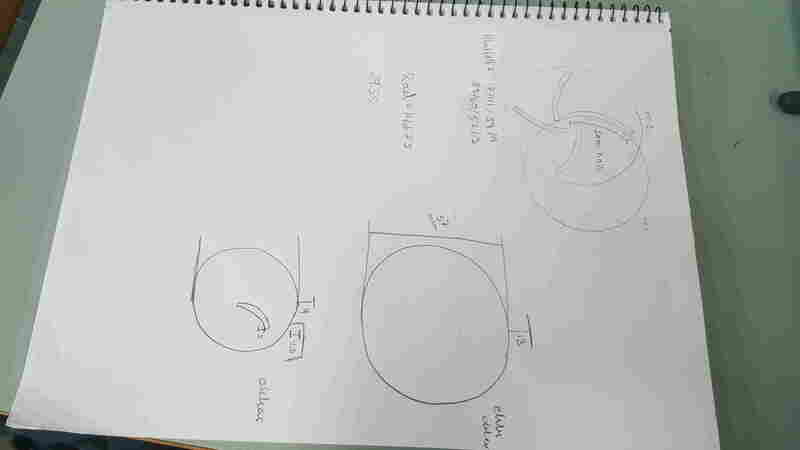 To do that I simply drew a circle the same size as the bottom part and extruded that down. The inside part would still be hollow and therefore it would not be possible to make it subtractively. I cut the part again, this time without supports and buildplate adhesion since I wouldn't be able to remove the supports from inside the model. When it was ready there was a little bit of stringy material in the center but I could remove that easilly with a screw (anything round that fits into the center would do the job). 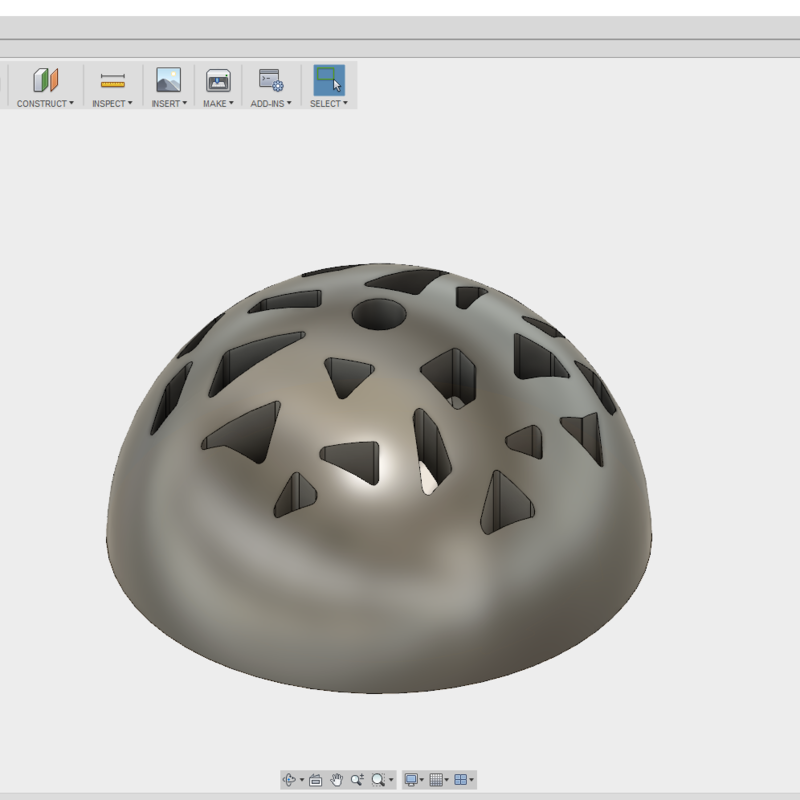 3D Design Sphere Fusion 360. 3D Design Sphere Stl file ready for the 3D Printer. The assignment for the 7th week was to redraw the echo hello-world board, add (at least) a button an LED (with current-limiting resistor), check the design rules, make it, and test it. 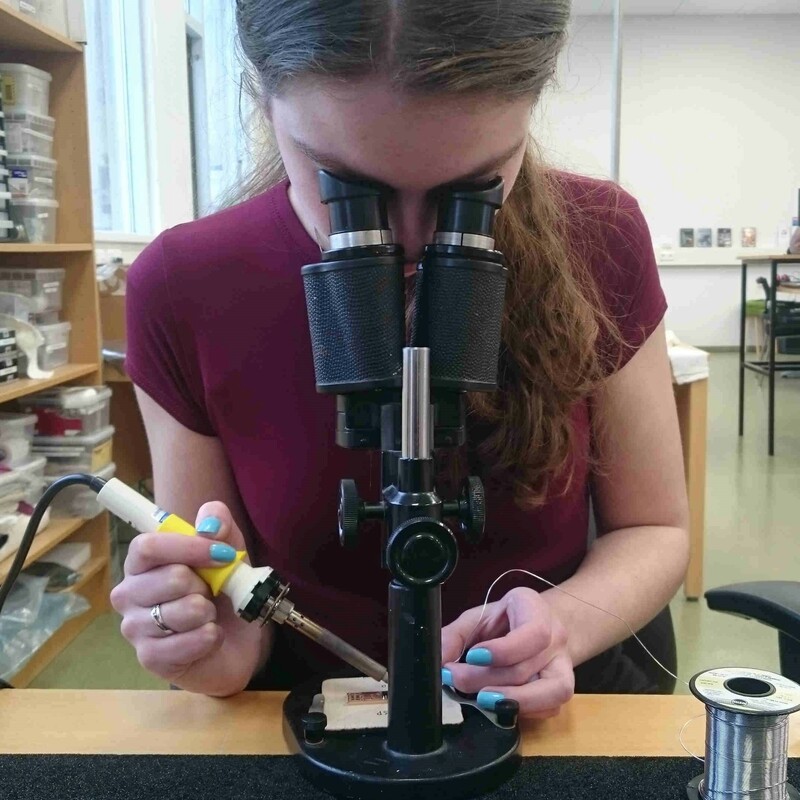 We used the oscilloscope to observe the operation of a microcontroller board and you can see that on the Vestmannaeyjar lab website . 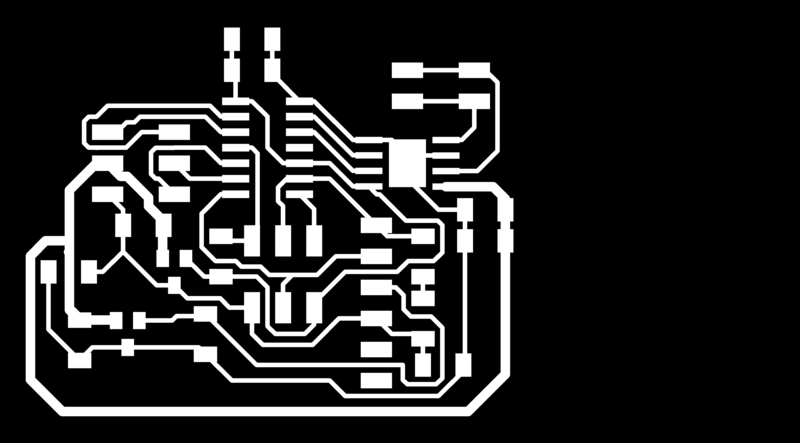 I had never worked with Eagle or drawn circuit boards before this week so it was a bit of a learning curve. Bas had a lecture on introduction to Eagle for the Icelandic Fab Academy students. The video is not open for everyone but the Fab Academy site also has a really good tutorial which you can find here . In the lecture he walked us through the basics in Eagle. How to create the schematics, connect the components with routes on the board, create the oulines and more. The first thing I did was download the fab library. You can download the Fab Library here. It is called fab.lbr and to download it you right click and save link as. Then I went into the libraries in eagle, clicked use none and then clicked the supply1.lbr and the fab.lbr to only use them. When I had done that I went into project, created a new project and a new schematic. I started putting the components in to the schematics and connecting them with lines. To see how to connect the components I used the image of the board. When I had connected all the components I wanted to check whether all of them were properly connected. To do that I could use either the show command (the eye icon) or move the component to see if the lines move with it. 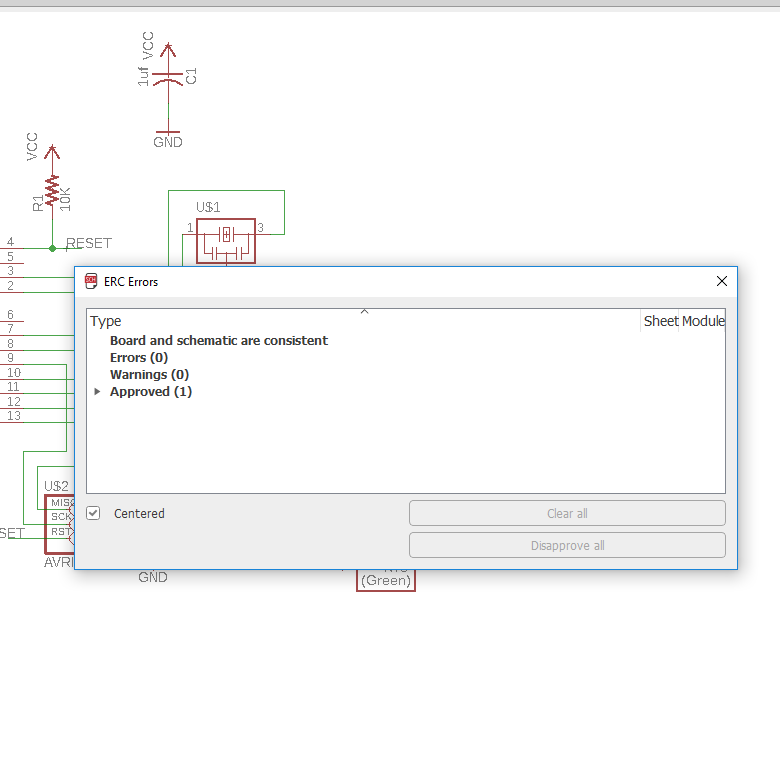 When the schematics were ready I looked at the Electrical Rule Check to see if the schematic was ok. 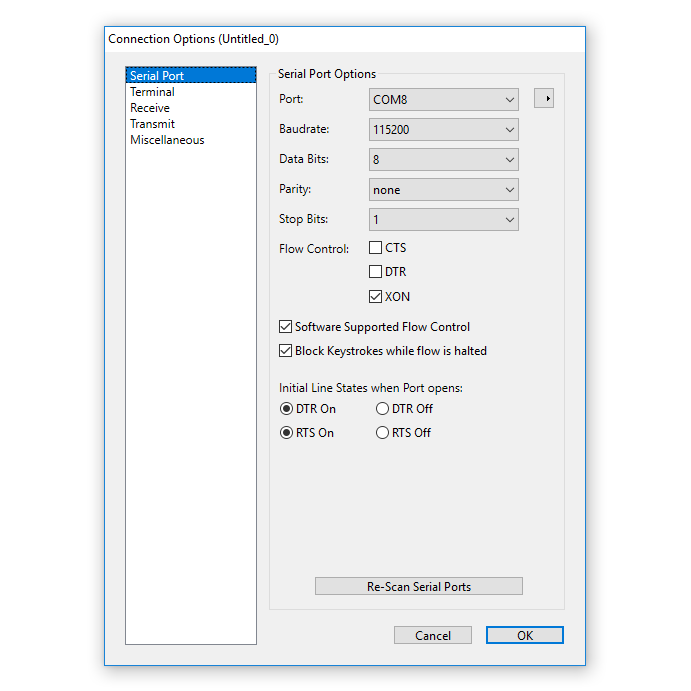 The ERC checks if if all of your nets are properly connected and labeled on your schematic, if you have any conflicting outputs or inputs on your schematic and if there are any open or overlapping pins and ports on your schematic. Then I opened up the board and changed the design rules (DRC). 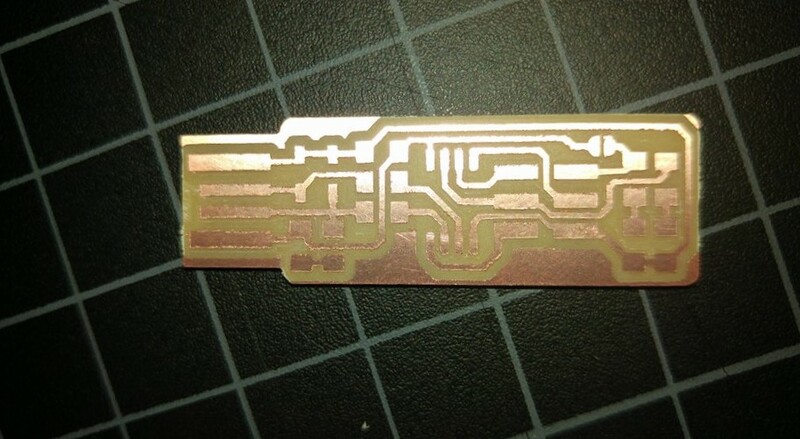 You can download the DRC we use in our lab when cutting simple circuit boards here . But to see e.g. 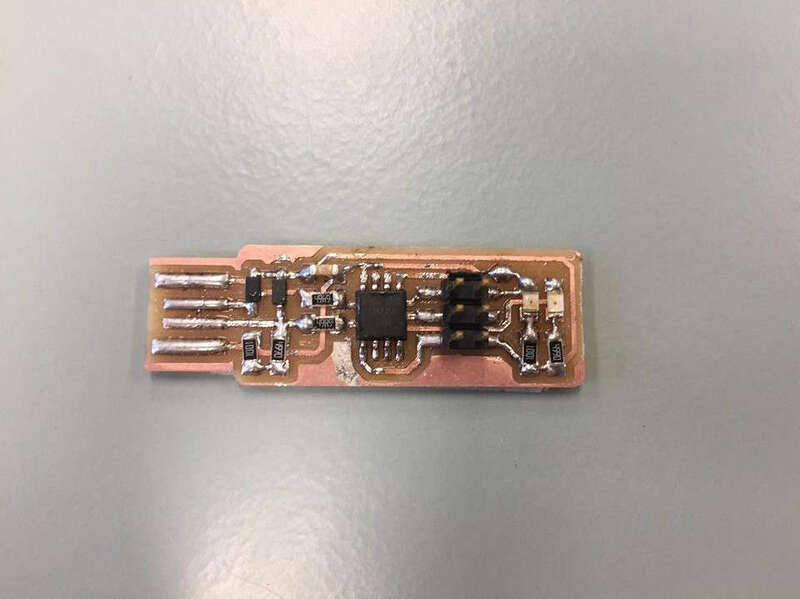 how thin your traces and what the clearance can be you can make the line test our lab made in the electronics production week. Then I started milling the board in the Modela Milling Machine. I had to mill the board twice because the first time I cut it the traces turned out really rough. 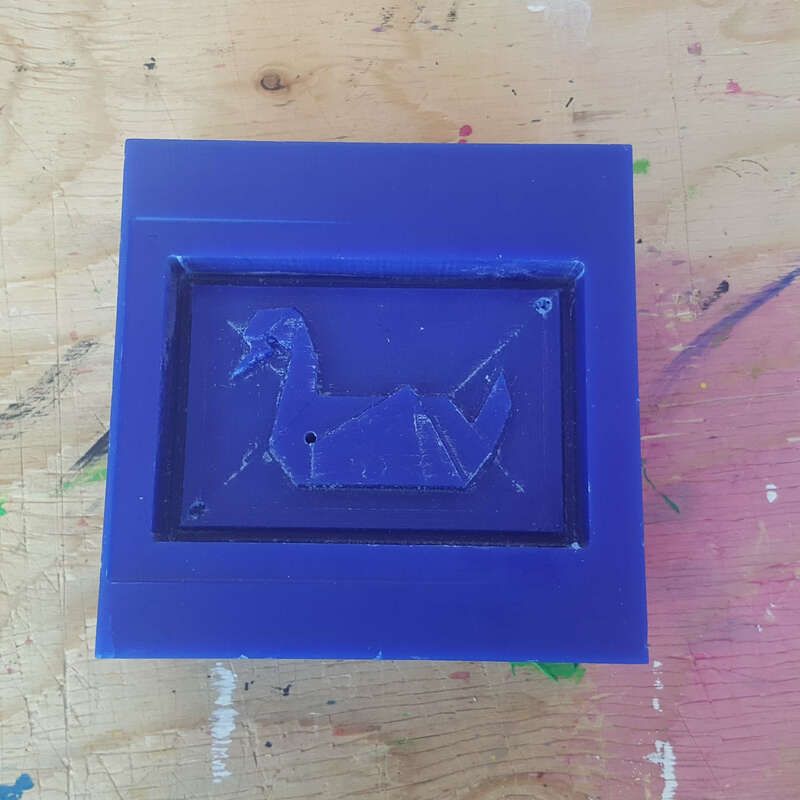 I tried changing the milling bit and it turned out much better so the milling bit I used for the first try must have been overused. Then I started soldering the components on the board which turned out much better than in the electronics production week. To program it I connected it with a 6 pin FTDI connection to a computer, a ribbon cable to a Fab ISP board and that board to the computer with a Mini USB. 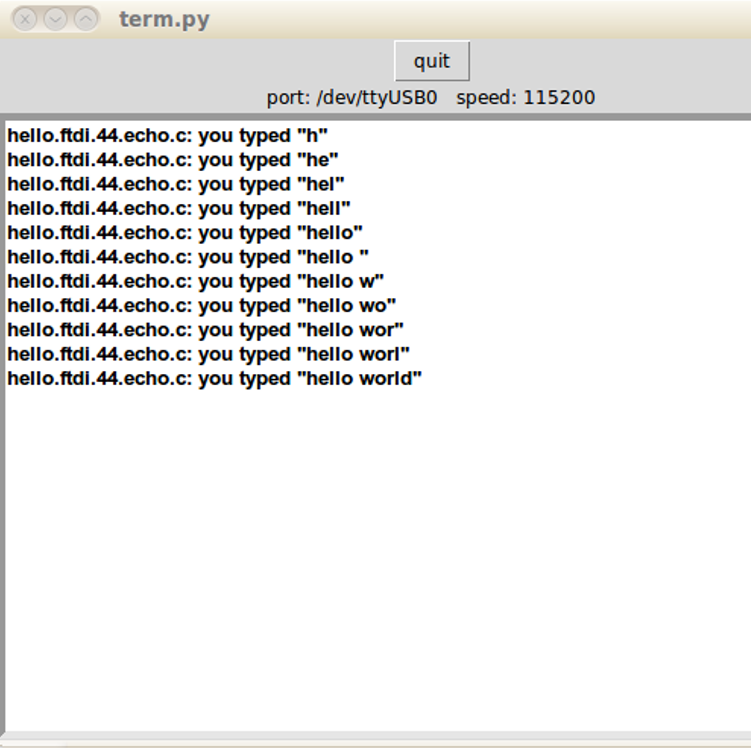 The last command opens a program where you can test whether the board was correctly programmed. 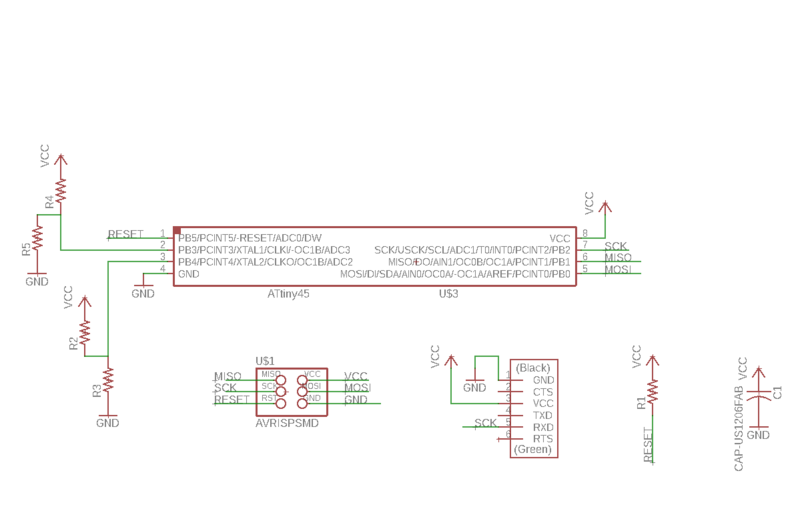 Hello board schematic Eagle sch file. Hello board Eagle brd file. Hello board outline png image ready to mill. 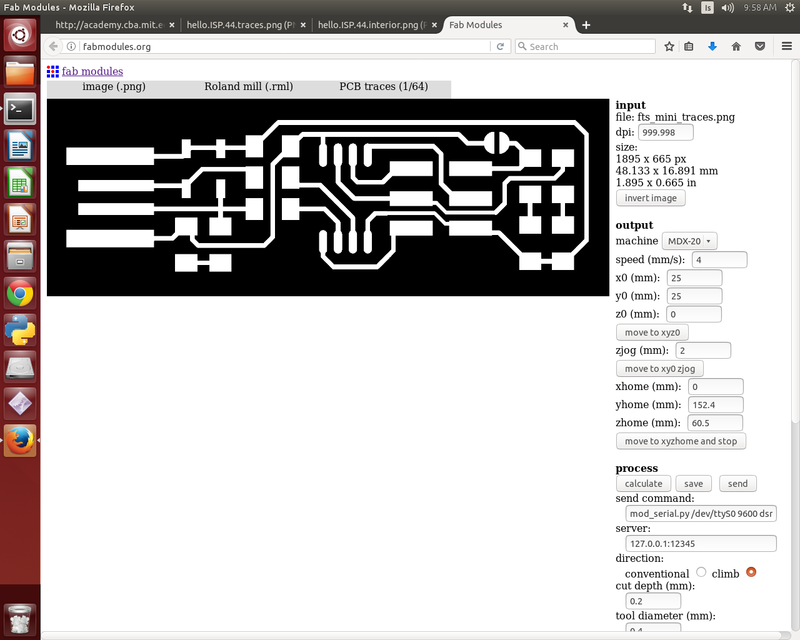 Hello board traces png image ready to mill. The assignment for the 8th week was simply to make something big. But there was also a group project and that was to test runout, alignment, speeds, feeds, and toolpaths for our machine. I used this week to cut out the window for my final project in the shopbot milling machine. 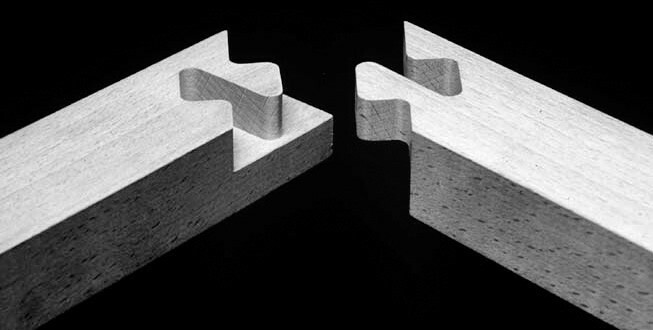 I wanted to use joints that would hold the frame of the window better together than traditional rectangular joints so I decided to use the jigsaw miter joint I found on Arch Daily like on the image below. I started by creating a sketch in Fusion 360. 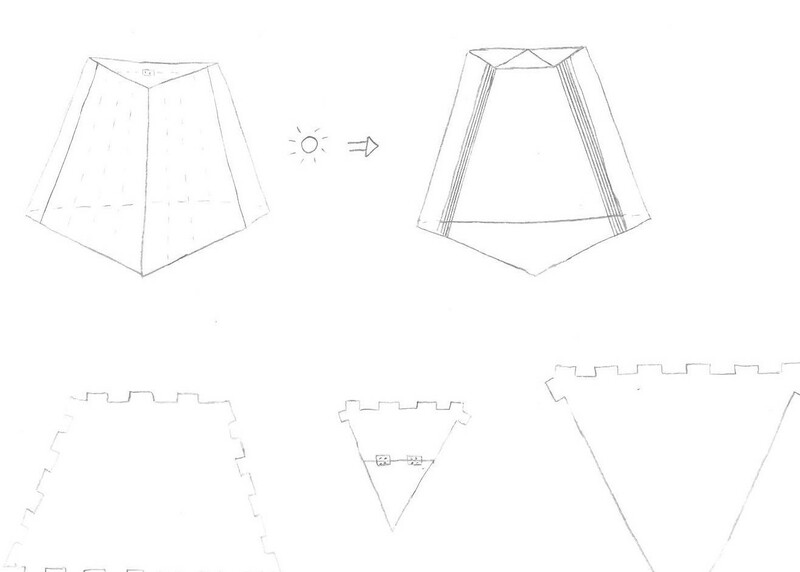 I sketched out a few construction lines to make it easier to draw the joints. 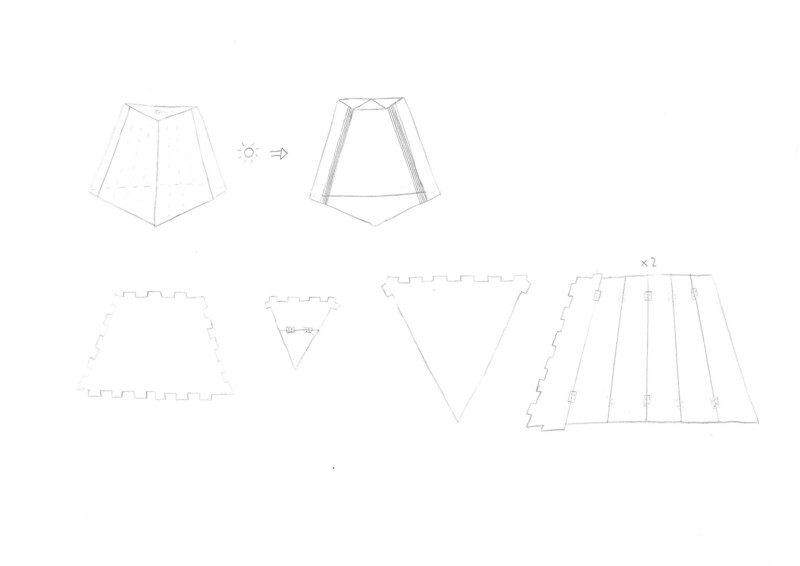 Then I sketched the basic shape of the joints and made fillets on each corner to make it more rounded. Then I extruded that sketch and created new bodies from each side of the frame. When I had done that I wanted to make a pocket for the glass to sit in so I extruded a box the size of the glass down 6 mm and a few pockets all around it down 3mm. Then I created a small frame that will hold the glass down. 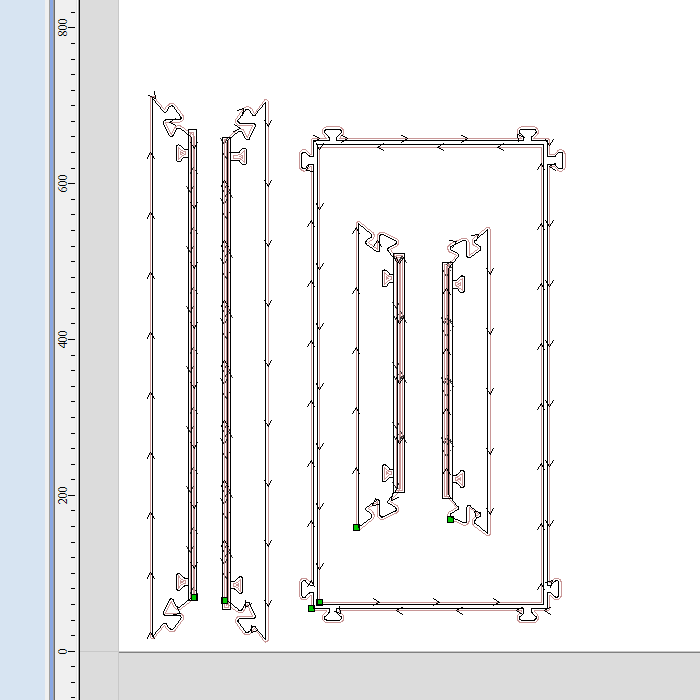 When the model in Fusion was ready I created a sketch on top of every surface I wanted to cut and saved them as DXF. Then I imported them into VCarve and created toolpaths for each thing I wanted to cut. Sometimes when I imported the sketches they were split into multiple parts. To make them one object I went to edit objects and join open vectors. 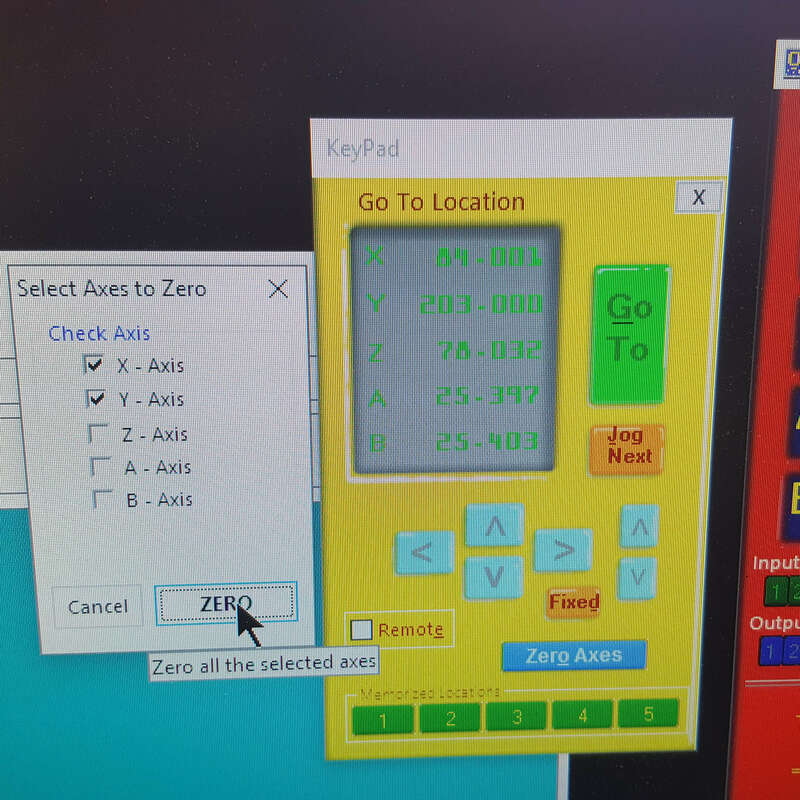 When choosing what tool I was going to use I had to set the settings for the shopbot. 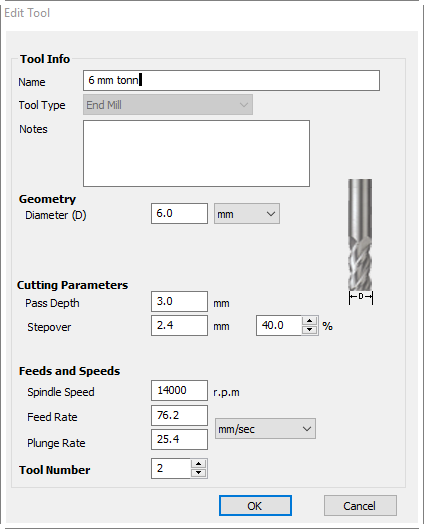 I chose the 6mm end mill milling bit and the settings I used for that can be seen on the image below. All those settings can be a bit hard to understand if you are not used to working with the shopbot so I am going to explain a little bit what they mean. The Pass Depth / Stepdown says how far down the spindle will plunge in each pass. The Stepover says how far into the adjacent material the spindle will go. The spindle speed says how many revolutions the milling bit will turn per minute (r.p.m.). The Feed Rate defines the rate at which the tool moves in the X and Y axes. And the Plunge Rate defines the rate the tool moves in the Z direction and plunges into the material. To find more explanations of the shopbot settings you can look through the Shopbot User Guide (use Ctrl+F to find things more easilly). 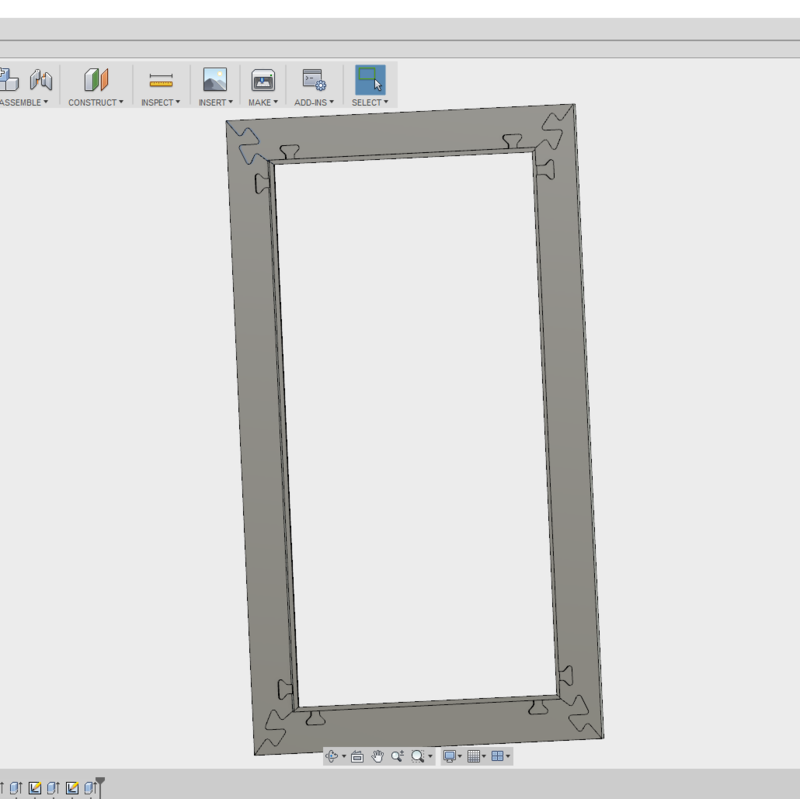 For the frame I wanted to cut all the way through the material so I chose the profile toolpath. But where I didn't want to cut all the way through I chose the pocket toolpath. I used a 6 mm milling bit but the pocket for the glass was 5 mm in width so creating that toolpath didn't work. To create the toolpath I had to draw a box that was a bit bigger than the pocket and made a toolpath out of that. To make sure the frame didn't start moving when I was cutting I created the toolpaths in order from the inside out. Then I started cutting the window. In my opinion the shopbot is one of the most complicated machines in the lab to operate especially if you haven't used it often. To turn it on I pressed on and reset, then I needed to warm the spindle up so I started increasing the heat of the spindle part by part up to 280, pressed the dspl button 5 times, selected Lo and then Run. Then I found the file and turned the spindle off before moving the x and y axes to the beginning point using k and zeroed them there. To zero the z axis I used the zeroing plate and pressed zero z axis. Then I turned the spindle on again and started cutting the part. Our shopbot often has some problems while it is cutting and stops quite frequently. That happened twice while I was cutting, the first time it happened I wasn't careful enough and it cut into the frame. That happened because I only lifted the spindle up but didn't move it close to the place I wanted to start cutting again. That resulted in the spindle starting to lower before it had gotten into the right position and cut into the frame like on the image below. When the shopbot stops I have to open the shopbot program again, press k, page up and move the shopbot to the place it was last cutting. Then I select go to line and write in ca. the line the shopbot was on when it stopped and start cutting again. Appart from that and it being a bit rough it turned out the way it was supposed to. When I had finished sanding the frames I put them together and the joints looked really good. The outer frame turned out really well, but the inner frame that was meant to keep the glass in wasn't quite the way I wanted it to be. If I have time I am going to change the design a little and cut it again. 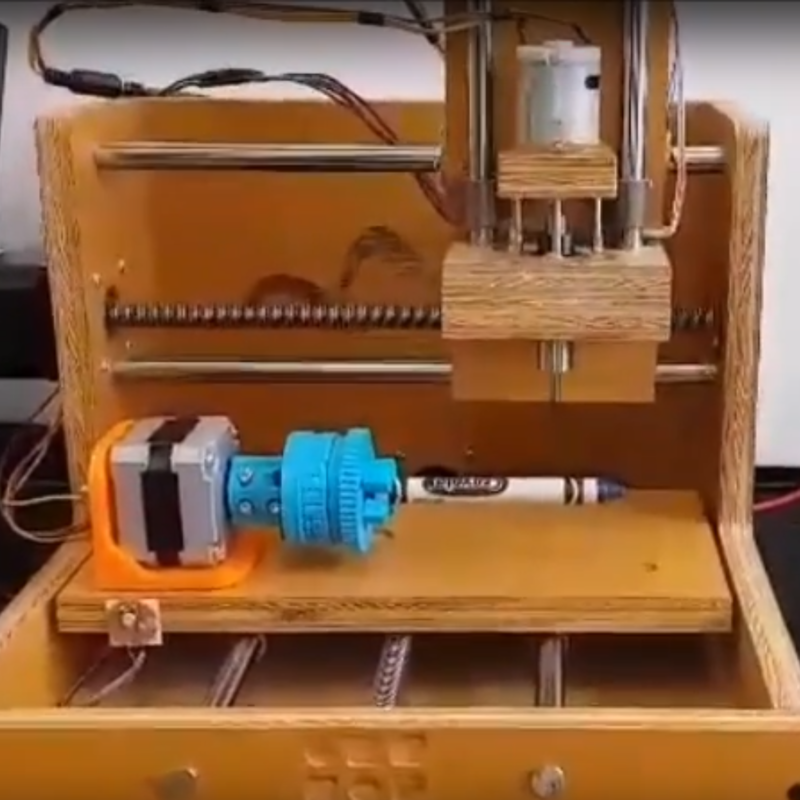 Computer Controlled Machining Fusion F3D file. Computer Controlled Machining Toolpaths sbp file ready to mill. Computer Controlled Machining crv Vcarve crv file. The assignment for the 9th week was to read a microcontroller data sheet and program our board to do something, with as many different programming languages and programming environments as possible. The group project was to compare the performance and development workflows for other architectures. 2K/4K/8K byte of In-System Programmable Flash. 12 general purpose I/O lines. 32 general purpose working registers. 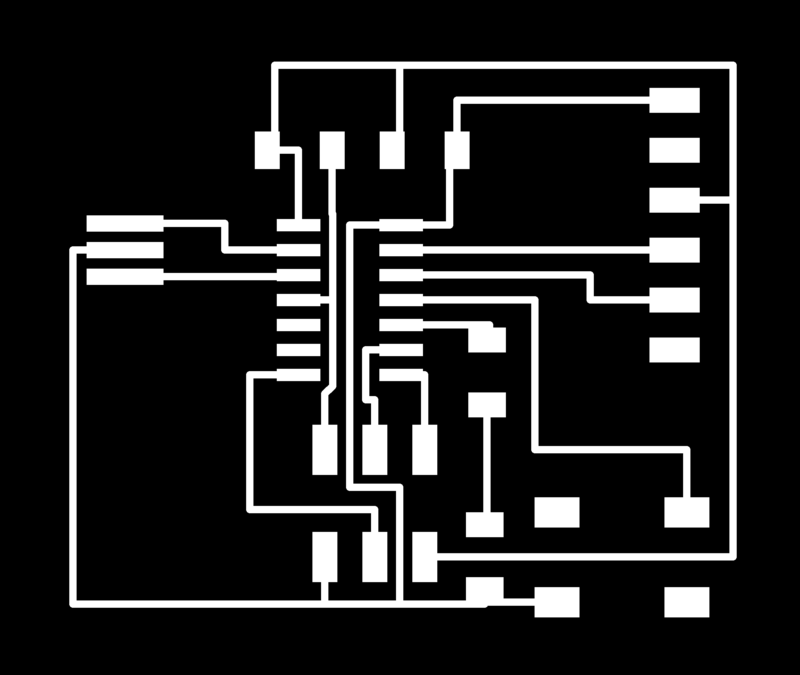 An 8-bit Timer/Counter with two PWM channels. 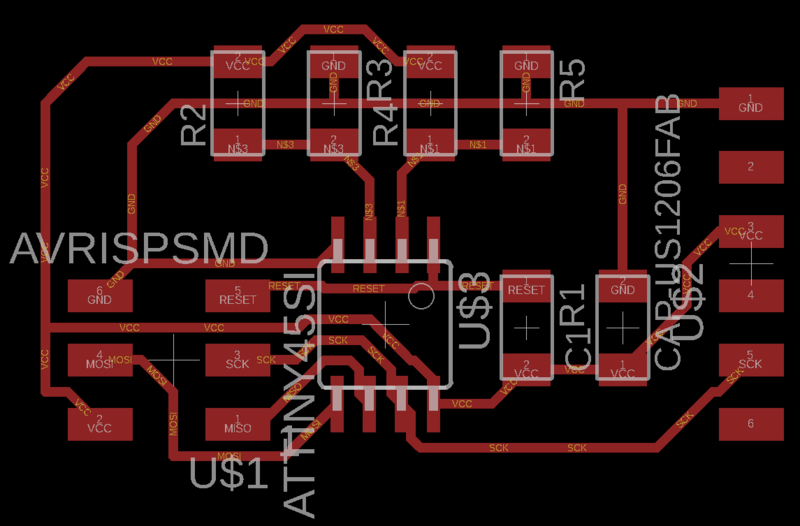 A 16-bit timer/counter with two PWM channels. 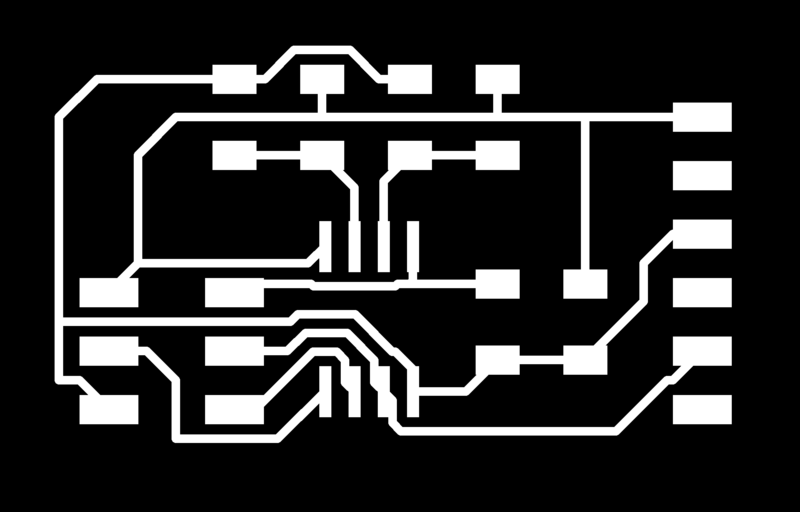 Programmable gain stage (1x, 20x) for 12 differential ADC channel pairs. A programmable Watchdog Timer with internal oscillator. Four software selectable power saving modes. First I tried the Blink example. When programming in Arduino make sure to compare the pin numbers on the attiny (which you can find in ATtiny24A/44A/84A data sheet ) to the pin numbers on the arduino since they vary between the two. 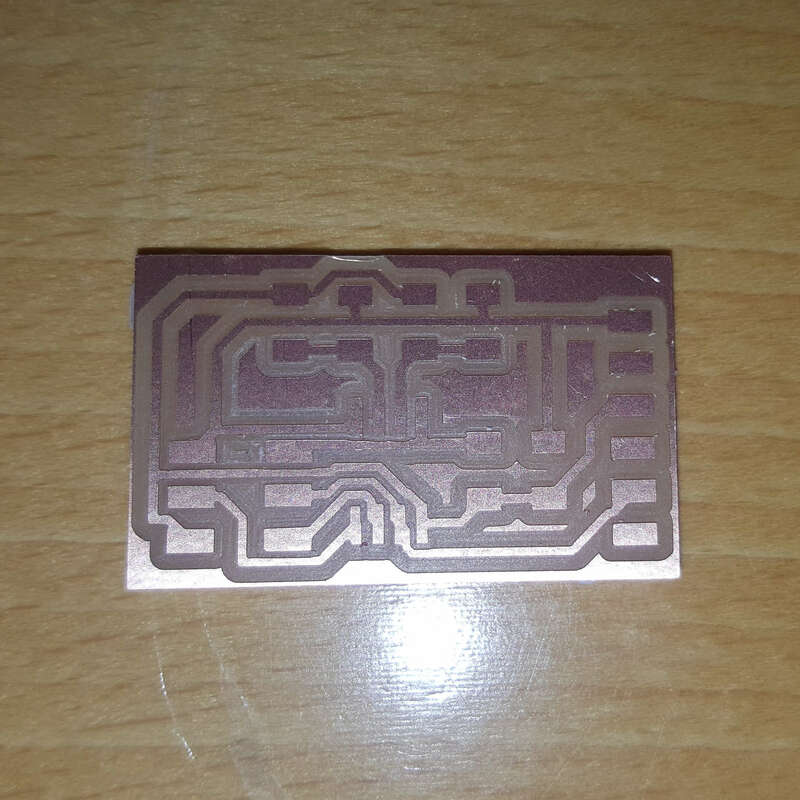 I found that in the Pin Configurations and figured out which pin was connected to the led. Now all I had to do is write 3 where it says LEDBUILTIN and click upload up in the left corner. I forgot to take a picture of the blinking light but it was very faint. The reason for that was that I had just used the same resistor in both places which was a 1KΩ resistor but I needed a smaller resistor. 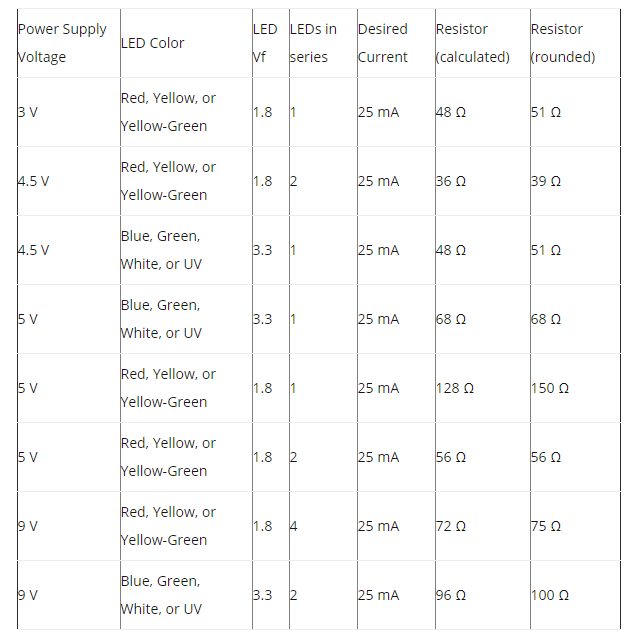 To find out which resistor to use I found the table below and used the 49.9Ω resistor because we didn't have the exact resistor that was in the table in our lab. When I tried programming it again with the 49.9Ω resistor the light was much brighter. I wanted to try using the button too so I found the button example. For the button I needed to write the numbers of two pins, the pin connected to the button and the pin connected to the led. 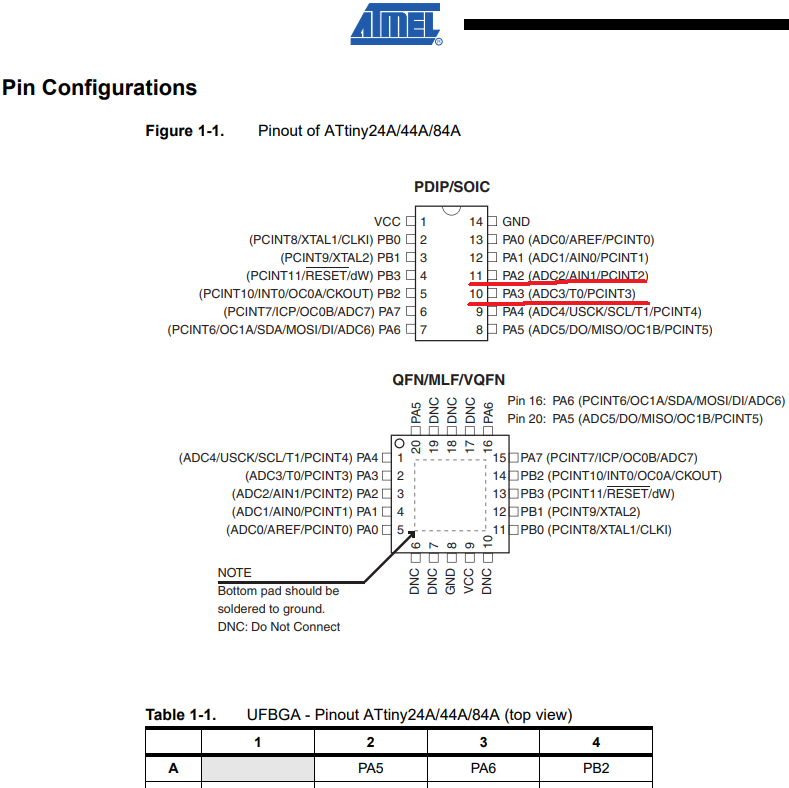 To figure out what pins were connected to the led and the button I looked at the Pin Configurations again. 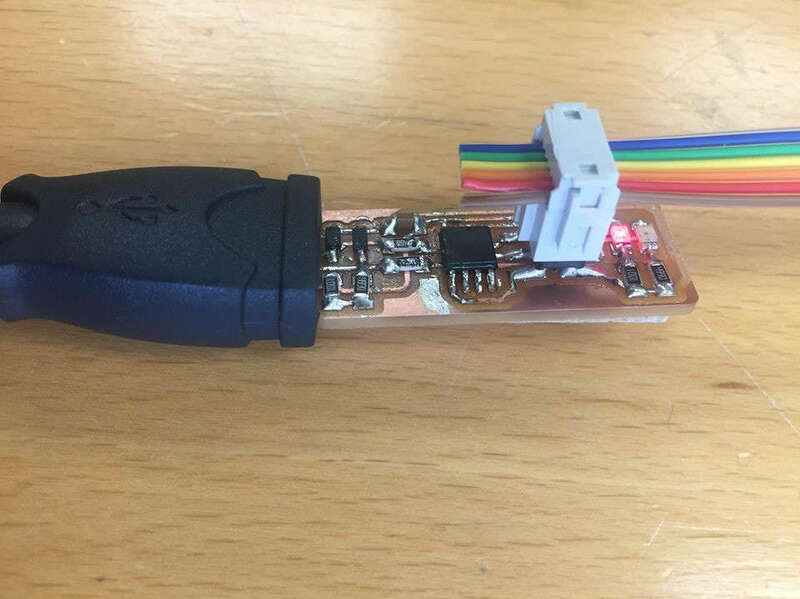 The button is connected to pin 2 and the led is connected to pin 3 as before. When I tried uploading it to the board the button didn't work. The reason for that was that I hadn't turned on the pullup resistor so I had to add the underlined command into the code. If you want to change the code so that the light is turned off to begin with and it turns on with the push of the button all you have to do is switch the HIGH and LOW in void loop. For the 10th week there were both a group assignment and an individual assignment. The group assignment was to review the safety data sheets for each of our molding and casting materials,then make and compare tests with each of them. 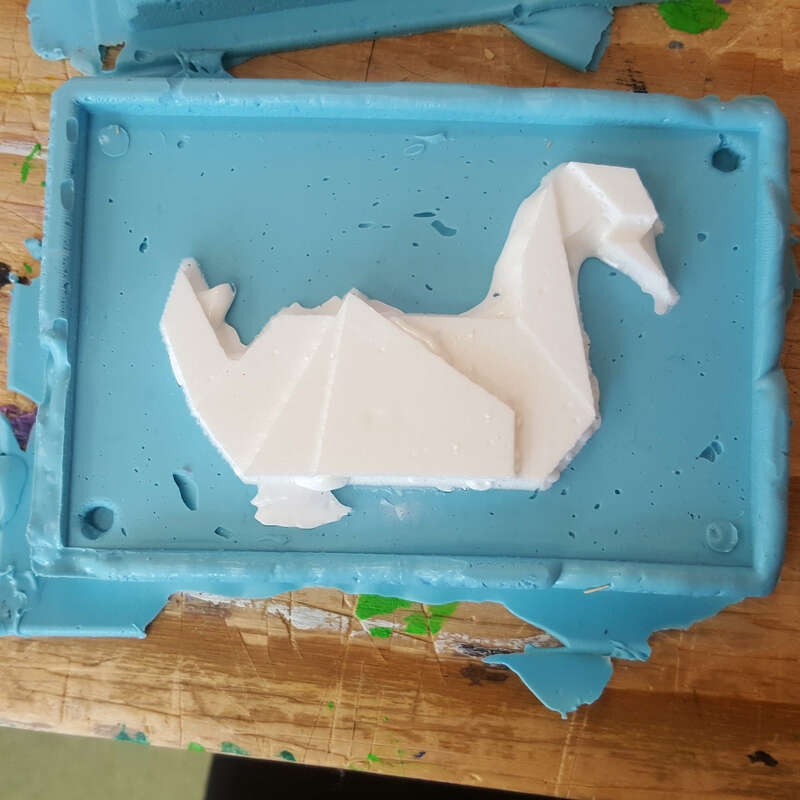 The individual assignment was to design a 3D mold around the stock and tooling that I'll be using, machine it, and use it to cast parts. But since I would be able to create the hinges with one sided molding and casting I felt like that wasn't enough to finish the assignment. 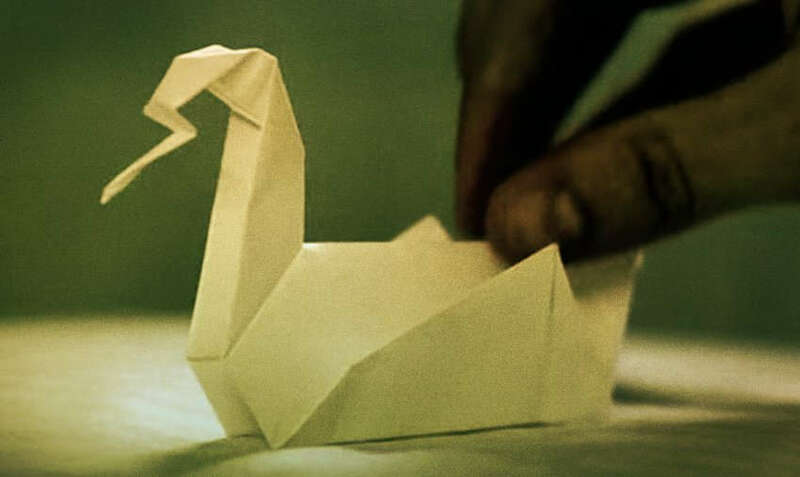 The second thing I wanted to make was a replica of an origami swan like on the image below. 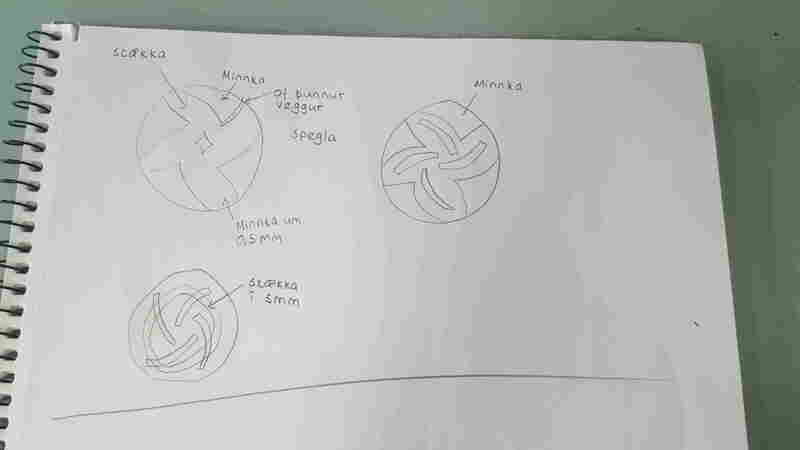 I started drawing that in fusion but since it is quite a complicated shape I didn't know how I could make the mold for it. 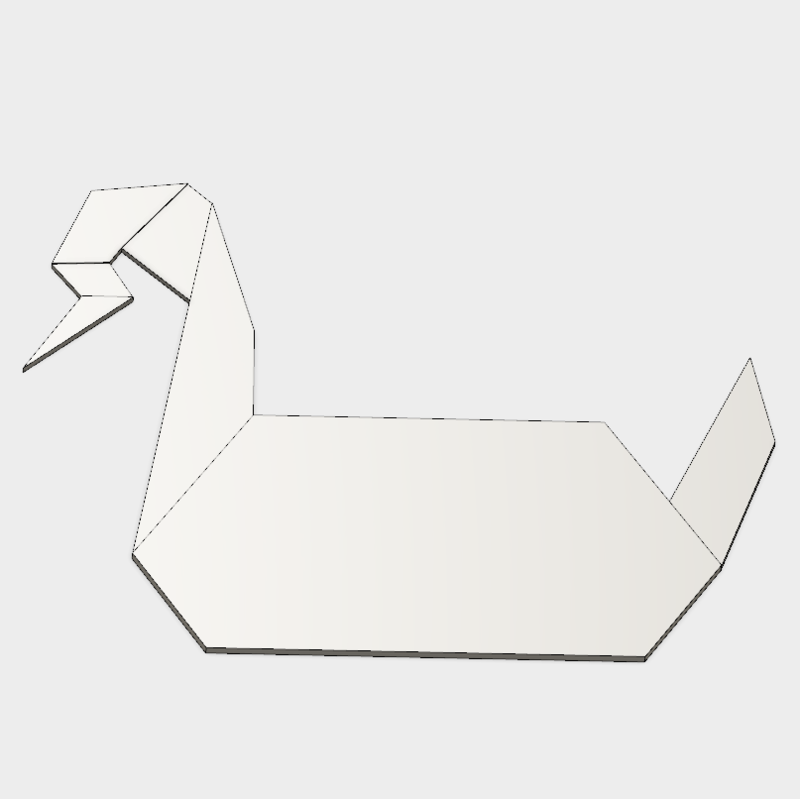 I scrapped that idea and decided that insted of making an exact model of an origami swan I wanted to just take inspiration from it and make a 2,5D model. Then I created a box around it and some tabs to keep the mold together. I didn't feel like the mold would be held well enough together with the tabs on their own so I wanted to make the molds fit into each other. I also changed the design a bit by adding wings. 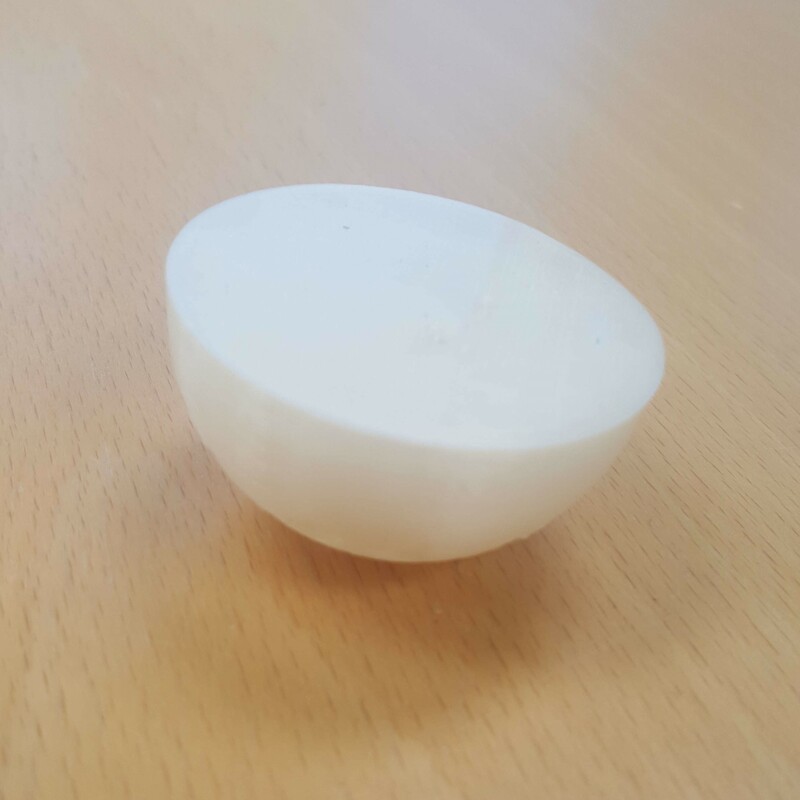 I relized that the design was a bit too big to fit on the machinable wax we have in the lab so I needed to resize it. To do that I went into modify - scale. 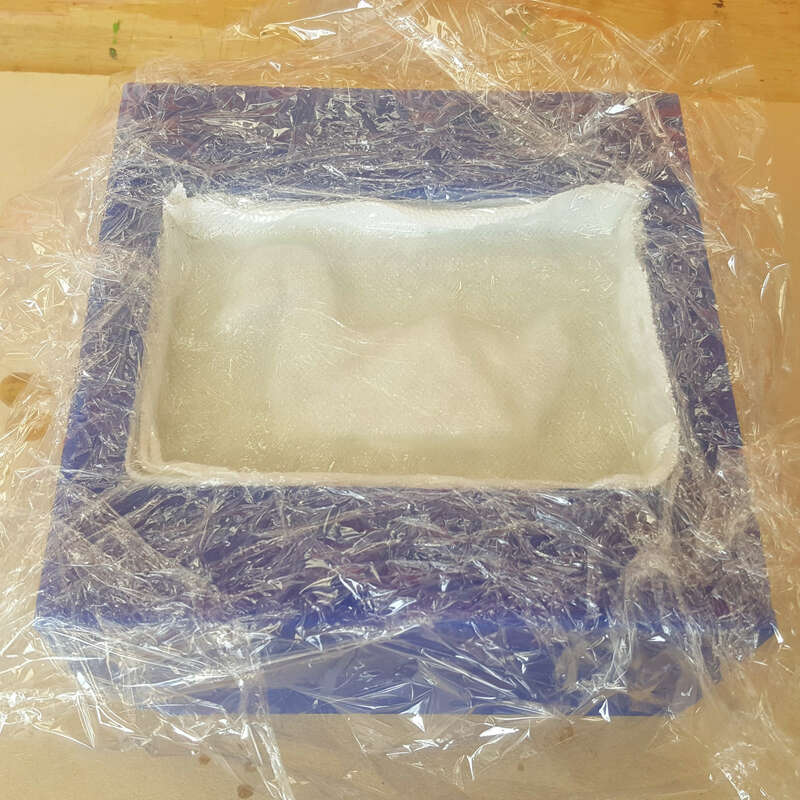 Now I needed to make air holes and holes to inject the material into the mold. Then I mirrored the body and removed the air and material holes. To make the molds fit together I swithed the tabs, extruded the lowest part of the model up to the same height as the top of the model and took the outside frame off. Now the files were ready and I needed to make them ready to cut. For that I decided to use Vcarve since that is the software most commonly used for the shopbot. 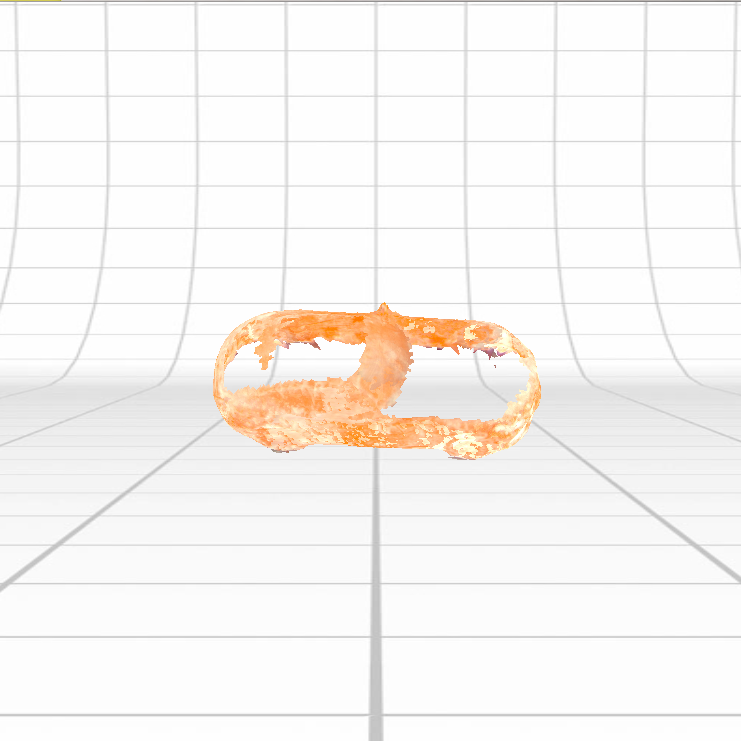 I hadn´t used Vcarve with 3D models much before so I watched this video on importing and exporting 3D data. The first half of the video talks about Vcarve and it is a bit long, but I could just skip over the parts I already knew and it was very useful. When I had imported the model into Vcarve following the tutorial it was time to create the toolpaths. I created two toolpaths for each side, the rough machining toolpath and the finish machining tooplpath. 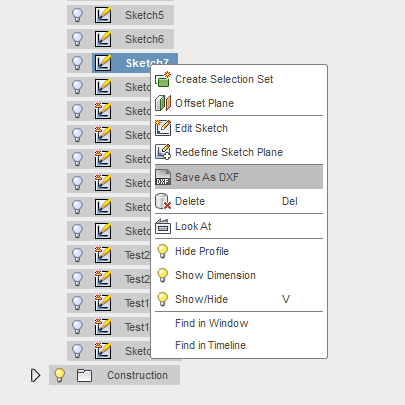 These are the settings I used for the material setup and the toolpath. Since I couldn't fasten the machinable wax directly on to the base of the shopbot I decided to glue it on a small piece of wood and then screw that to the base. To do that I first put down glue with a hot glue gun roughly in the shape of the wax, then heated the glue up with a hot air gun and put down the wax. Lastly I screwed down the wooden plate. Then I cut it in the shopbot. I used a 1/8" ballnose milling bit to cut the part and made sure to be very careful when changing the milling bit. I opened up Shopbot 3 and zeroed the x, y, and z axes (I zeroed the z axes in the middle of the material because I had done so in Vcarve). Then I heated up the machine little by little up to 280 and cut the part. You can find more information on how to use the shopbot in the computer controlled machining week. 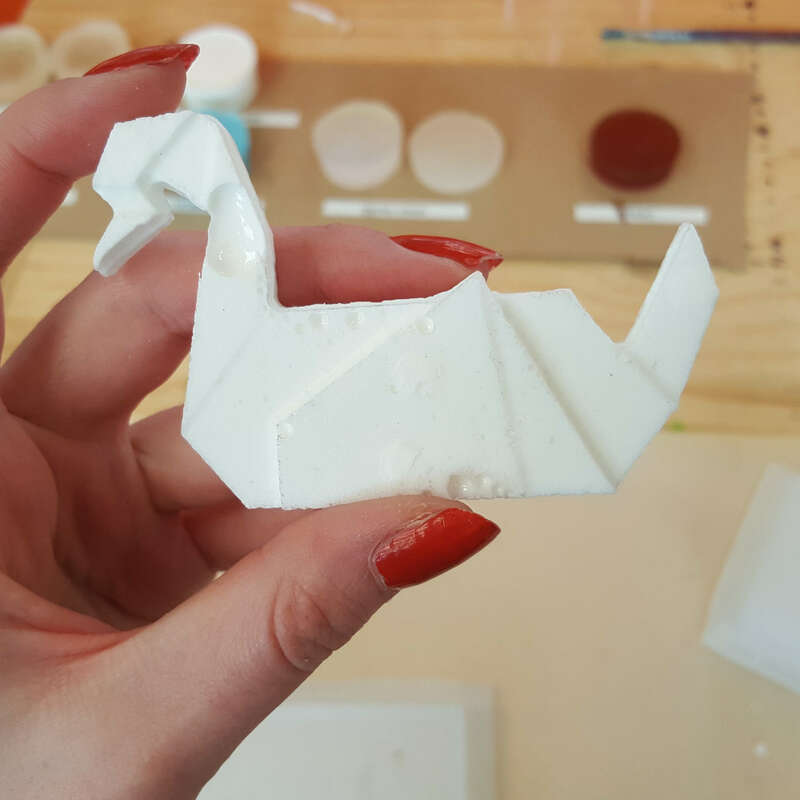 Oomoo is a silicone material ideal for making molds to cast into because of it's rubbery feel when it dries down. It is relatively safe to use compared to other materials. The pot life is 15 minutes and the curing time is 75 minutes. It is split into part A and B which are supposed to be mixed by volume in equal proportions. 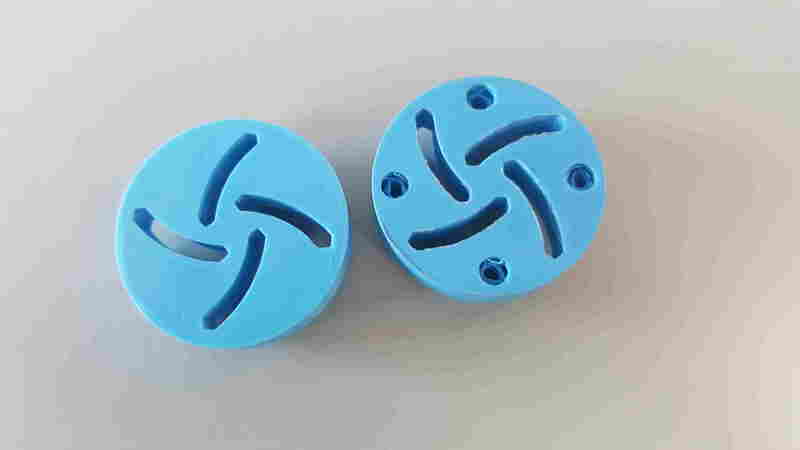 Sorta Clear is also a silicone material with a rubber texture and is often used for making molds. Some of the Sorta clear materials are food safe (Sorta Clear 37 and 40) and therefor it is not very dangerous to work with them. It is still good to be always careful when working with molding and casting materials regardless of how safe they are supposed to be. I will be using Sorta Clear 37. The Pot life of that is 25 minutes and the Cure time is 4 hours. 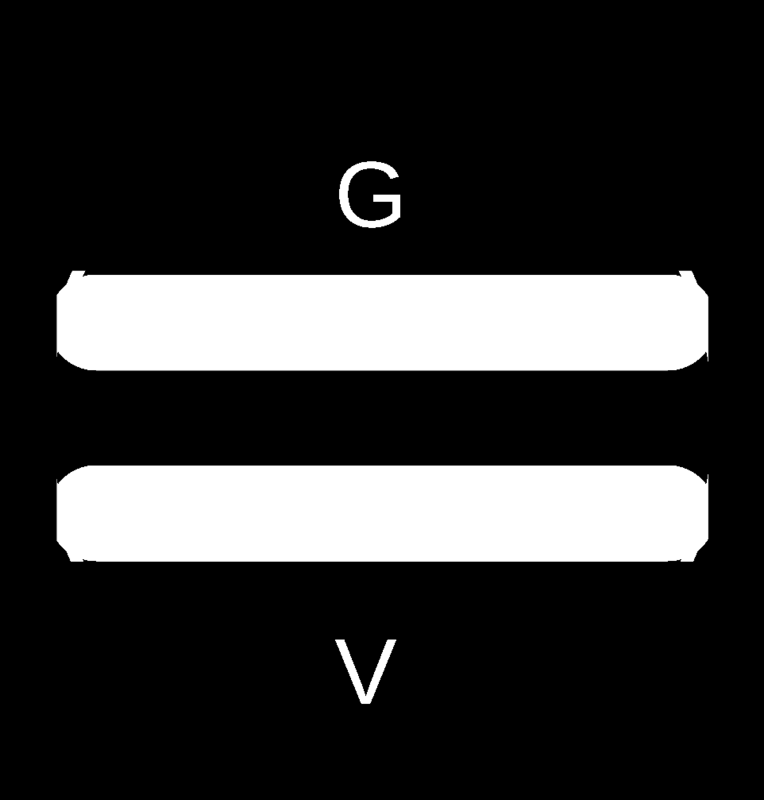 Like with the Oomoo the proportions of parts A and B are supposed to be 50/50 by volume. The Smooth Cast 300 Series of liquid plastics are ultra low viscosity casting resins that make virtually bubble free casts. The Pot life of the Smooth Cast 305 is 7 minutes and the Cure time is 3-4 hours. It is mixed by volume 1 part A and 1 part B. 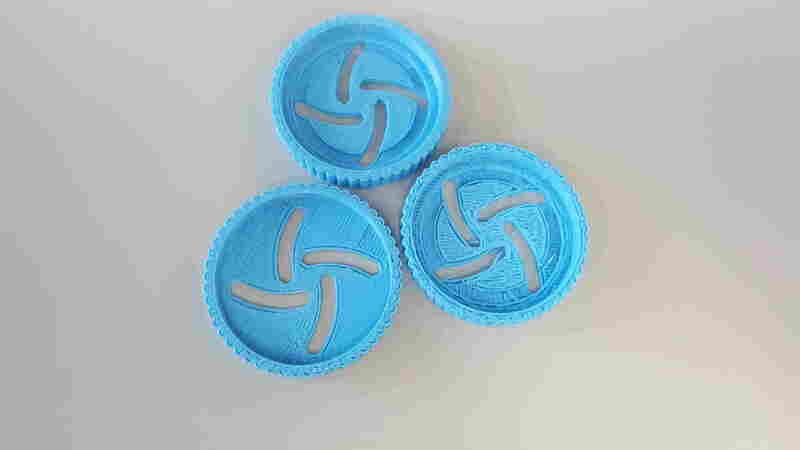 When I had milled the positive wax mold I started making the negative mold. I wanted to make that in Oomoo and the part in Smooth Cast 305. You can find more information about the molding and casting materials on the Vestmannaeyjar lab website where we reviewed safety data sheets and more. Then I started mixing the oomoo. Like most of the other molding and casting materials it is split into parts A and part B. We had made tests with almost all the materials including oomoo so I had worked with that before. That is why I was really surprised how thick the consistensy of part A was. It was much thicker than when we had made the tests. I think the reason for that might have been how it was stored. The room where most of the molding and casting materials are kept is sometimes really hot and sometimes cold and that might influence the materials. I decided to still try to use the oomoo. 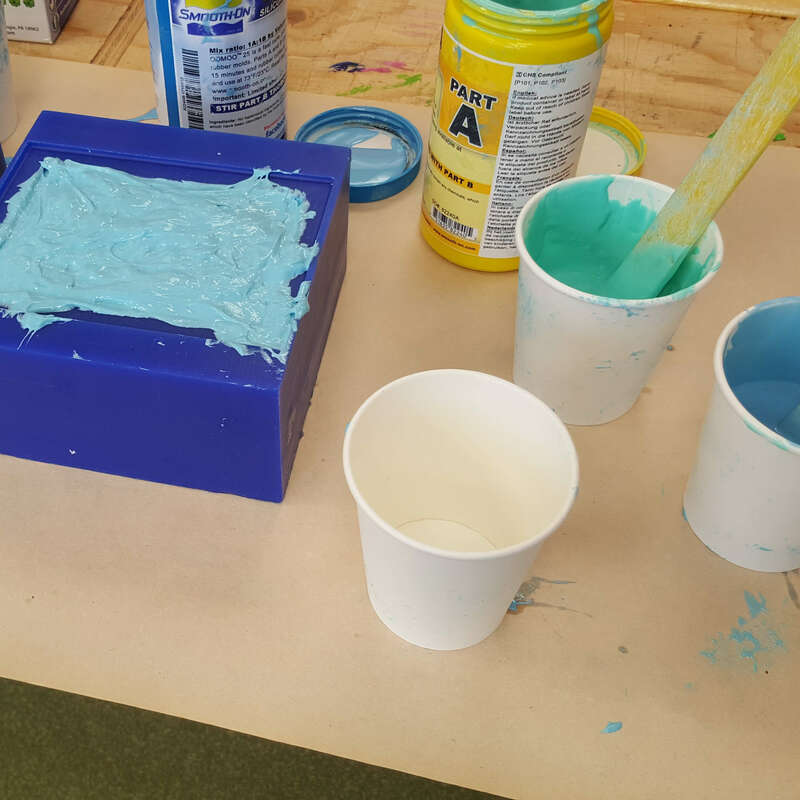 I started by stiring each part separately (both in the container and the plastic cups I am using, then I poured part A into the cup with part B and mixed them together. To be absolutely sure that the two parts would be properly mixed together I poured the mixture in to another cup and stired some more. Before pouring it into the mold I sprayed on some universal mold release on the wax and let it dry for 5 minutes. The mixture was still thicker than what it was when we made the tests and there were some bubbles I just couldn't get rid of. While doing a little research on how I migt get the bubbles out I found a video on How To Make A Vacuum Chamber . A Vacuum Chamber would pull all the air out of the mold and remove the bubbles. We don't have any vacuum agitation chambers in our lab so it would be really fun to make one one day. But since I couldn't do that I decided to use a vacuum bag and see if that would make any difference. I don't think the vacuum bag made much difference since it does not look great but I wanted to try to use the mold anyway. I think that if I had used oomoo that had been stored in proper conditions in the right temperature would have helped alot because the oomoo wouldn't have been as thick and hard to work with. It is much easier to work with thinner materials and when it is really thick it is more likely to produce bubbles. I mixed some more Smooth cast and injected it into the mold. This is how it looked. One side has some bubbles but overall I think it lookes really good. 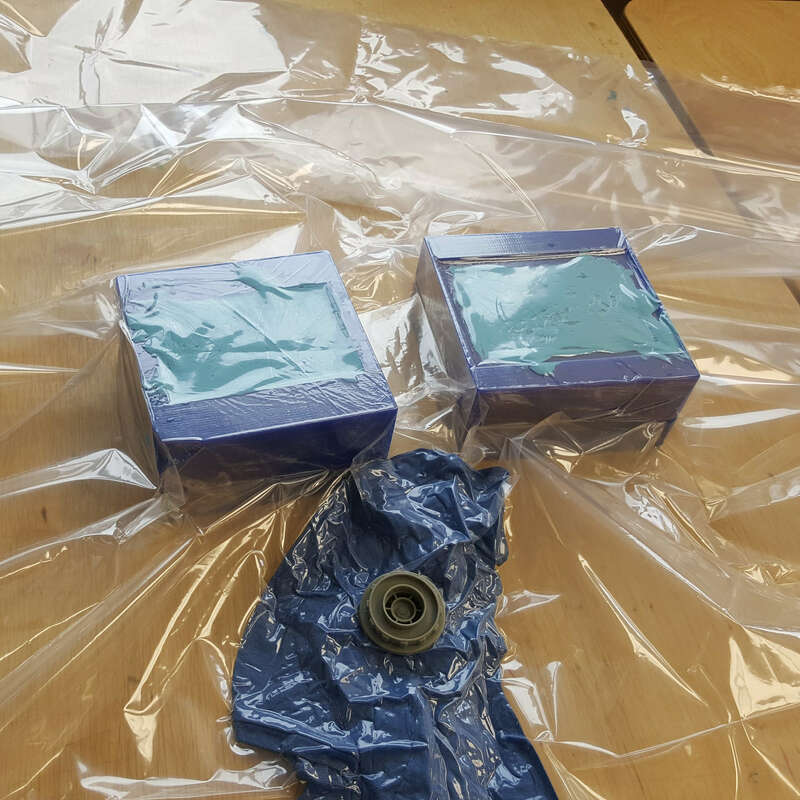 The resin mixture did not have bubbles when I injected it into the mold so I think the reason for them might have been that there were'nt enough airholes. 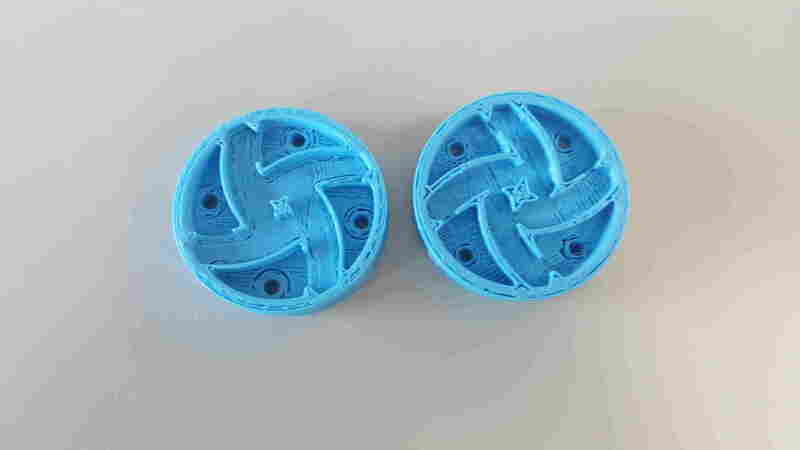 That can be fixed by changing the design a little bit and cutting it again,or just poking some holes in the mold but I think those airholes wouldn't be as good as if you milled the mold again. I have also seen people paint a little bit of resin on the mold before injecting the resin into it, especially in the corners and that might help preventing bubbles aswell. 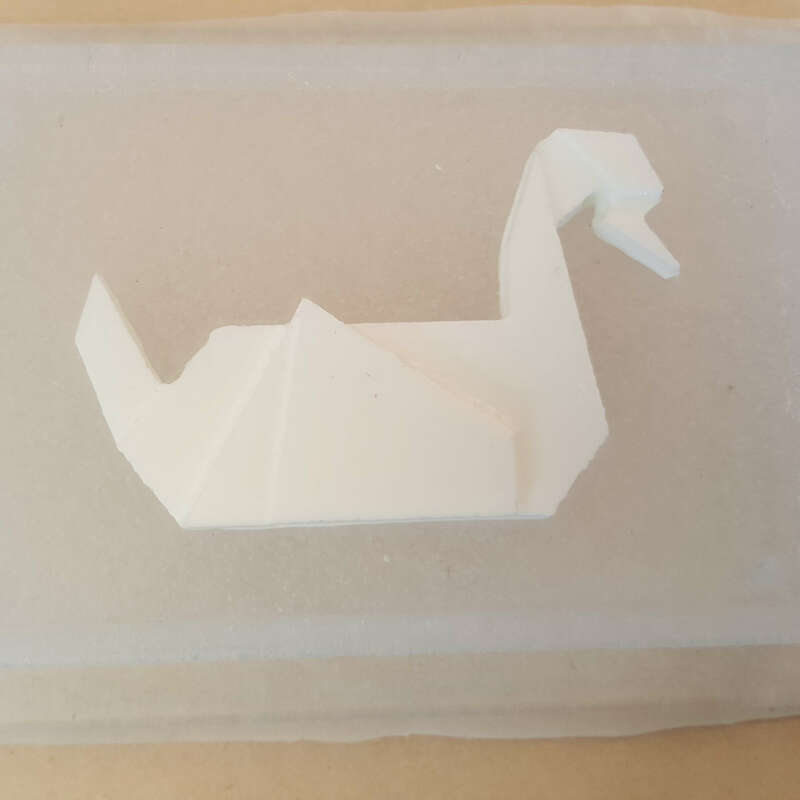 Origami Swan Fusion f3d file. Origami Swan side A stl file. 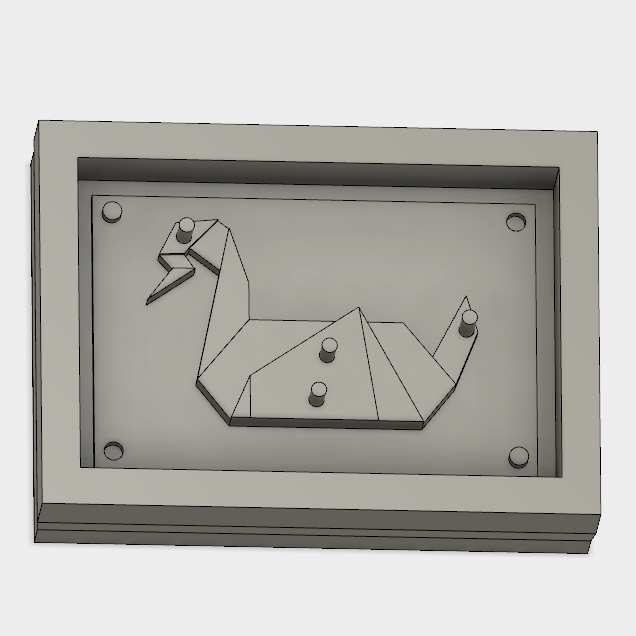 Origami Swan side B stl file. Origami Swan side A sbp file ready to mill. Origami Swan side B sbp file ready to mill. We went to a bootcamp in Sauðárkrókur where we among other things tried out the Haas lathes, and blacksmithing. 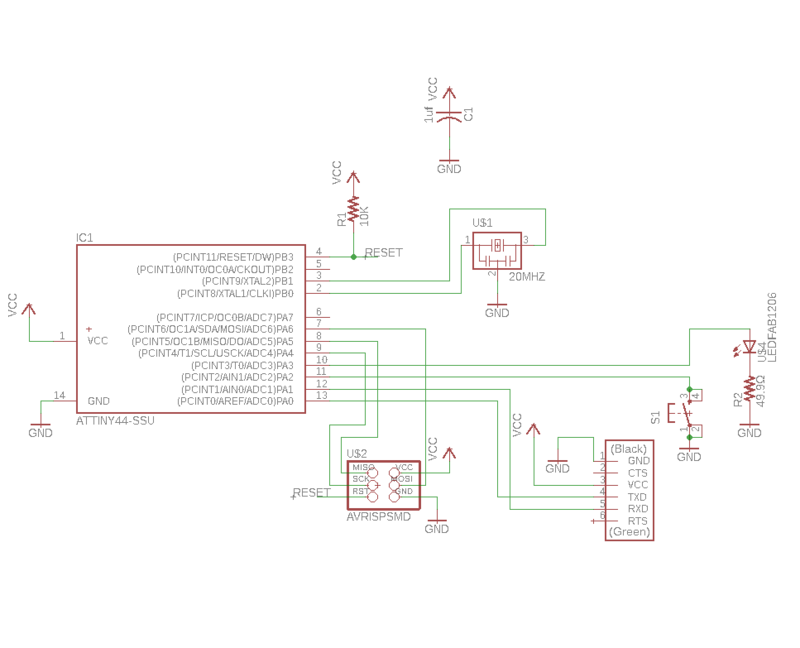 The assignment for the 12th week was to add a sensor to a microcontroller board that I have designed and read it. I wanted to use this week to make the sensors for my final project. 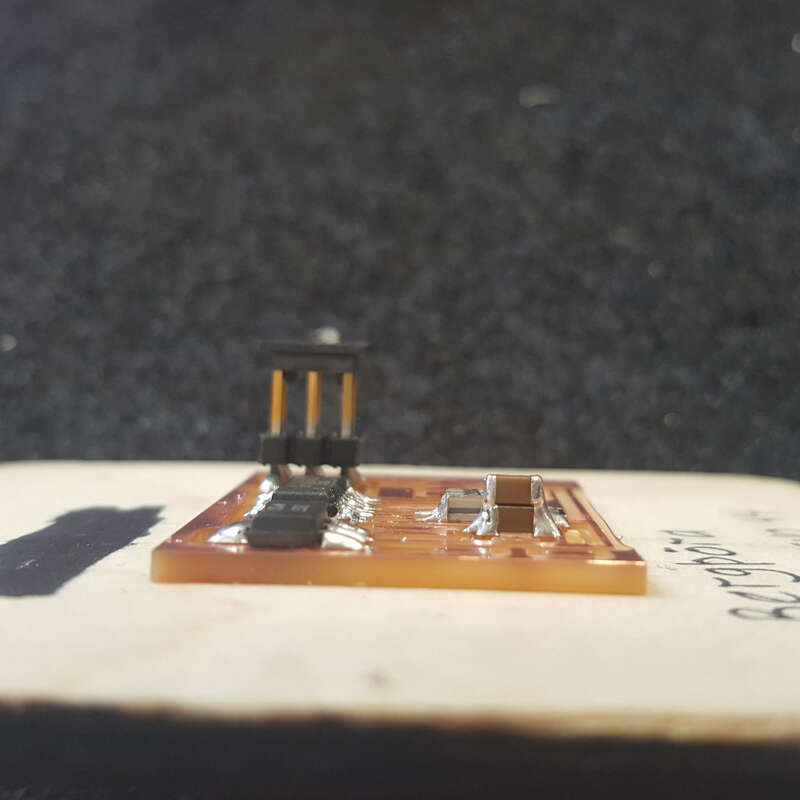 In my final project I will use both a temperature sensor and an air quality sensor solution which can sense multiple Total Volatile Organic Compounds (TVOCs) including equivalent carbon dioxide (eCO2) and metal oxide (MOX) levels. Here is a link to the Air Quality sensor. To measure the temperature I made the hello temp 45 board in Eagle. You can find information about that board in the Fab Academy Class Schedule under temperature. I was going to switch the ATtiny 45 out for an ATtiny 44 so I would have more pins to connect the air quality sensor. But since I could reuse the pins I used for programming after I had finished that I didn't think that would be necessary. When I was drawing the board I pretty much followed the layout on Neil's board but I wanted to have 45 degree corners instead of 90 degree corners. For more information about drawing in eagle go to the electronics design week (week 7). Then I cut out the board in the Modela milling machine and soldered on the components. Then I connected the board to my FabTinyISP and to a computer like on the image below. To program it I downloaded the c and makefile to a folder and went into that folder in a terminal with the cd command. Then I wrote the following commands in to the terminal. Then this window opened up and I could see the temperature changing. 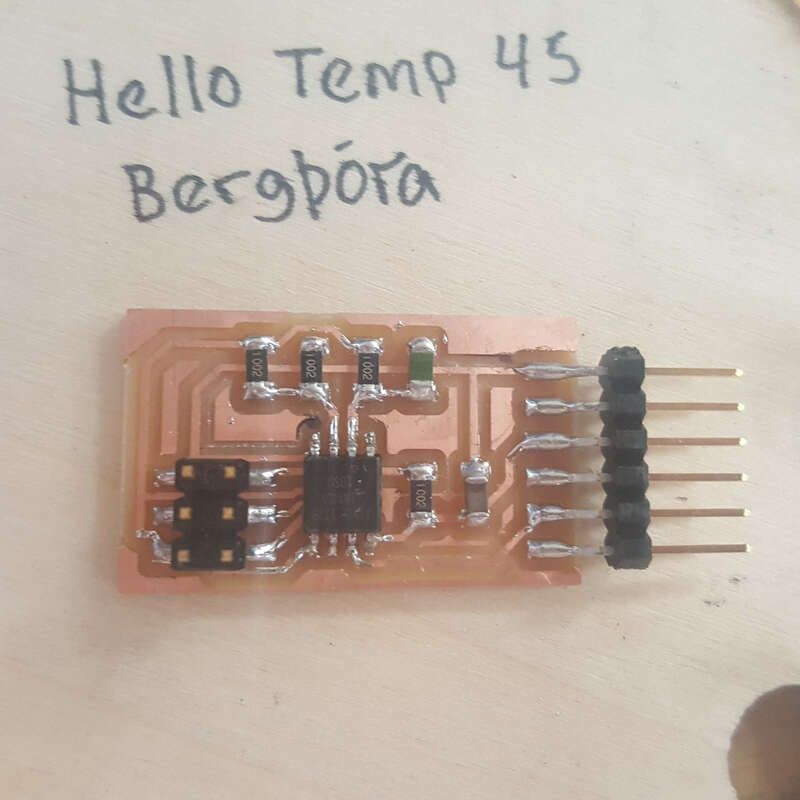 Now that I had made the temperature sensor board Neil made I wanted to incorporate that into my final project board and add the air quality sensor, a potentiometer and a dc motor controll to that as well. 2x 0,1uf Capacitor - 1 above to the microcontroller and 1 next to the H Bridge. Getting all of the components on to the board and routing the traces in Eagle was a bit of a hazzle and quite time consuming but I had a lot of help from Carl both creating the schematics and routing the traces. 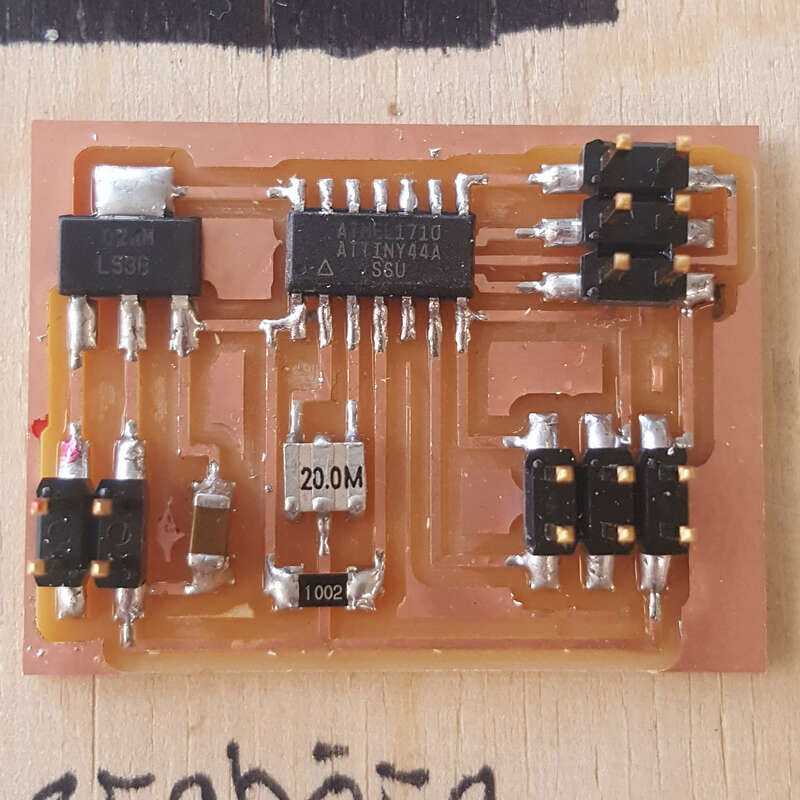 I was going to use the Atmega 328P but after spending a lot of time trying to create the traces I decided to use the Attiny 44 instead after Bas had told me the Attiny 44 would be enough to connect everything I needed for my board. The input device is not on this board but I am connecting an air quality sensor with a temperature sensor to the board. I am also connecting a potentiometer to the board which counts as an input as well. Now I needed to program it and to do that I decided to use Arduino. I have programmed it to both read the input and to create an output but I will talk more about the output in the output devices week. The air quality sensor from sparkfun has an arduino code you can copy and paste into arduino and change to fit your preferences. 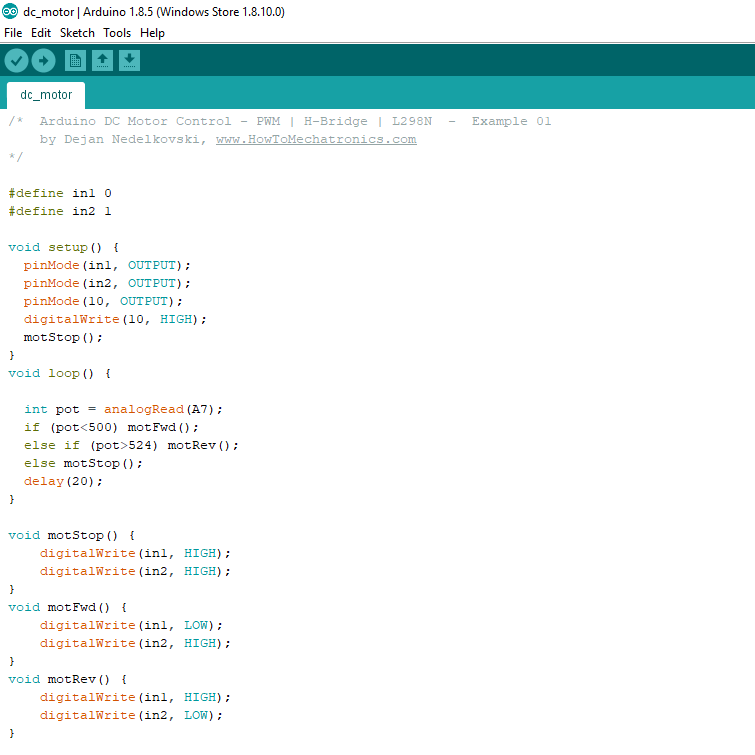 I downloaded one of those codes that is called Core and put it into arduino. 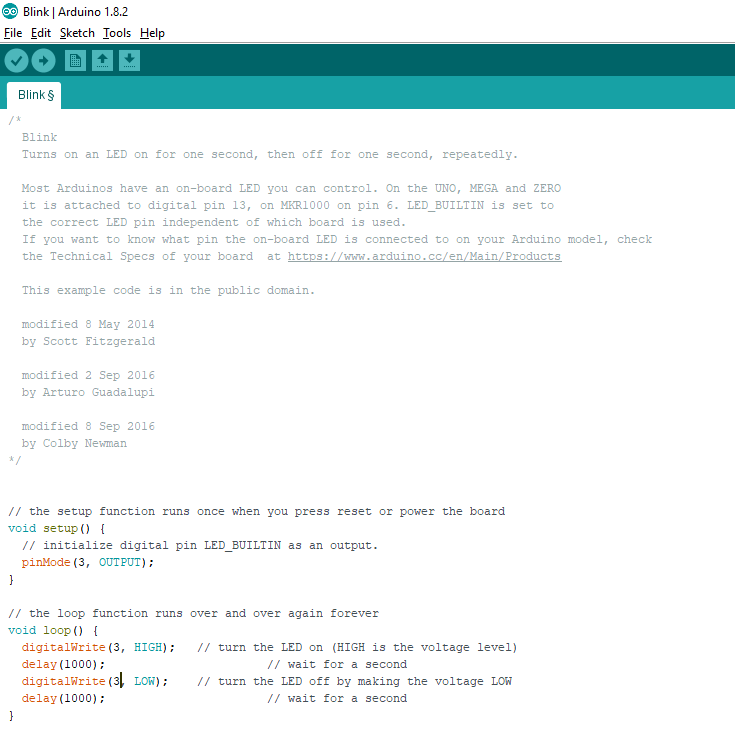 But before I started using the code I needed to download the Sparkfun CCS811 Arduino Library. There are instructions on how to download a library here . 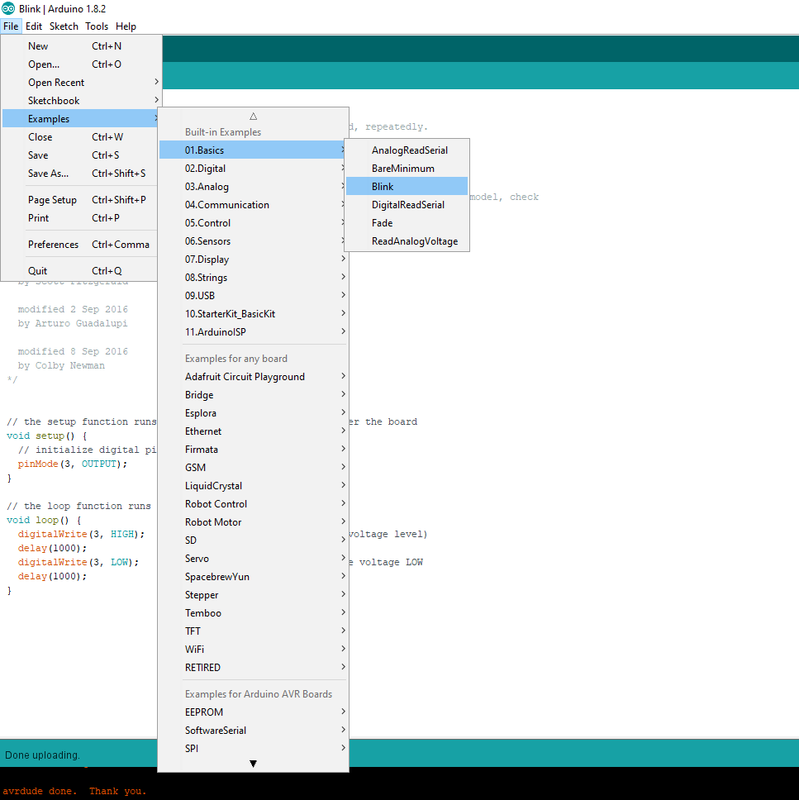 The library shown in the tutorial is for another sensor but you can just follow the tutorial but use the link to download the CCS811 library in the arduino library and usage section. When I had downloaded the library and included it in arduino I started adapting the code to the things I wanted it to do. When the code was ready I wanted to see whether I could get information from the sensor. To do that I opened the Serial Monitor but I could not get any readings. I tried unplugging the programmer and opening the serial monitor again and then I could get readings. The reason it didn't work before was that the programmer was connected to the same line as the sensor and blocking out the sensor. In the tutorial on how to use the sensor from sparkfun it said that the sensor needed 20 minutes to warm up so I left it running while I did some other things. After 20 minutes I came back to the sensor and tried blowing on it since exhalation contains CO2 and VOC and I could see the values changing in the serial monitor. The underlined values are the values at the point I blew on the sensor and you can see it changing back to the original values as it starts reading the air in the room again. The assignment for the 13th week was to add an output device to a microcontroller board I've designed and program it to do something. I wanted to use this week to create the circuit board controlling the motors in my final project. 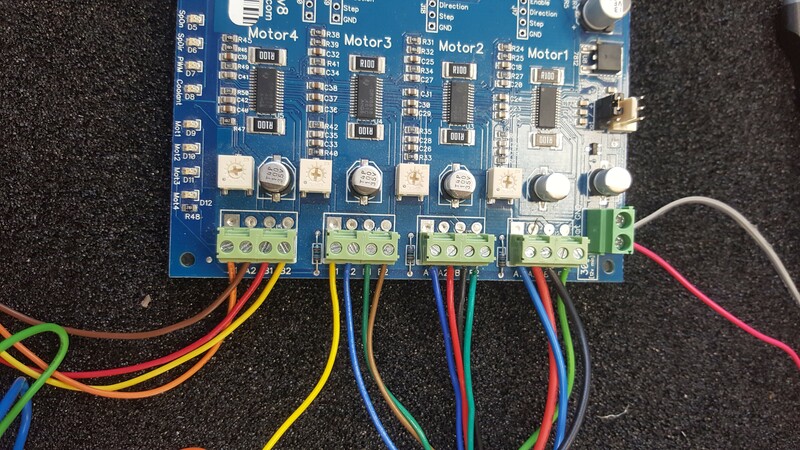 Neil has created a board that can controll either one or two servo motors that is called Hello Servo 44 and I think that would be great for my final project. 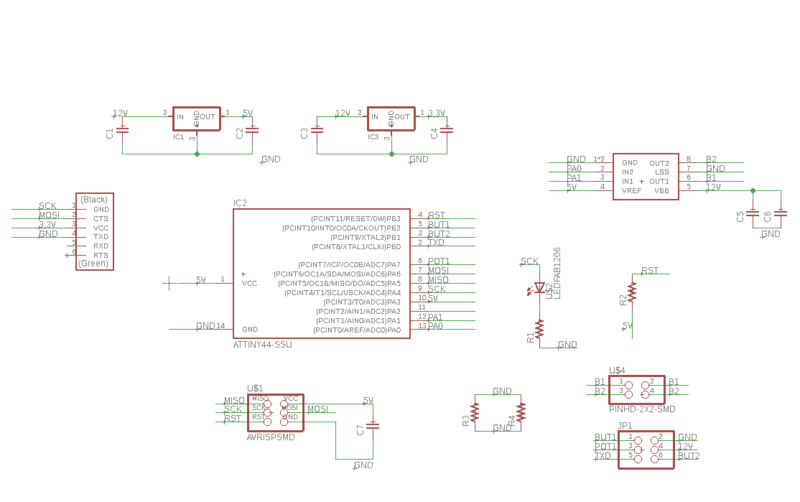 For a more in depth description on how to use eagle go to the electronics design week (week 7). When the board was ready I milled it out in the Modela Milling Machine but the first try didn't turn out well. I think the reason for that might have been that the milling bit was a little old and overused because when I tried cutting it again with other milling bit it turned out much better. Then I started soldering on the components which is always getting easier as I make more boards. But since we didn't have the same capacitor as on the drawing (22 uF) in our lab Frosti (my instructor) recommended just soldrering two 10 uF on top of each other. Then I started programming the board but I ran into some problems doing that. 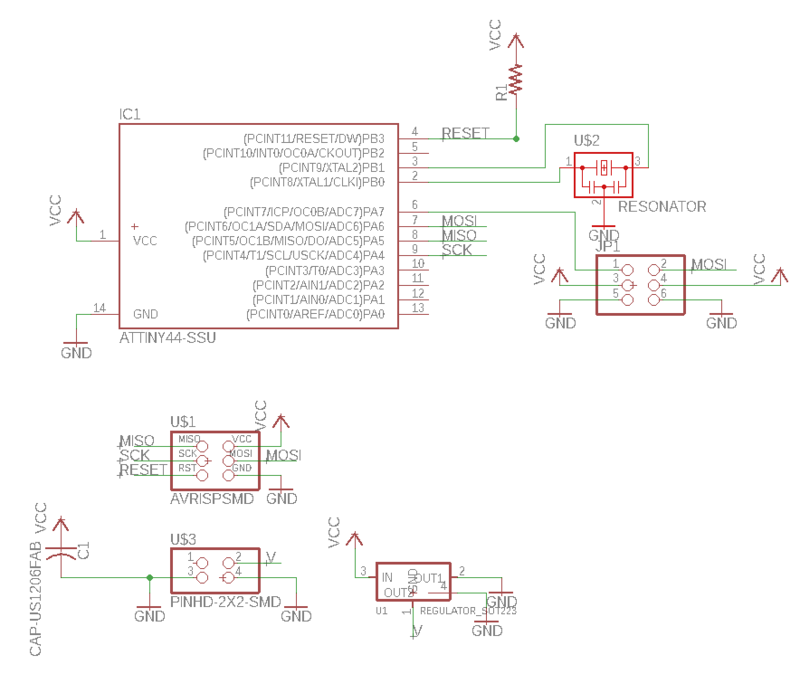 I connected the board to my FabTinyISP and to a computer like on the image below, making sure GND is connected to GND. The underlined text is the name of the makefile controlling two motors. When I had programmed it I wanted to see wheter it had worked so I connected a 9 Volt battery to the board with a battery snap and a 6 pin header. The motors are supposed to rotate 90 degrees in one direction and then rotate 90 degrees in the opposite direction ending up in the same place it started (at least that's what happened in Neil's video). But the motors didn't rotate as they were supposed to. When I connected the battery to the board it started rotating in one direction but when it had reached as far as the motor could rotate it tried to rotate even further instead of turning the other way. Since programming in the terminal wasn't working I decided to try doing it in Arduino. I had never used arduino in the computer I was using before so I started by installing the attiny to boards Here are instructions from highlowtech on how to do that. 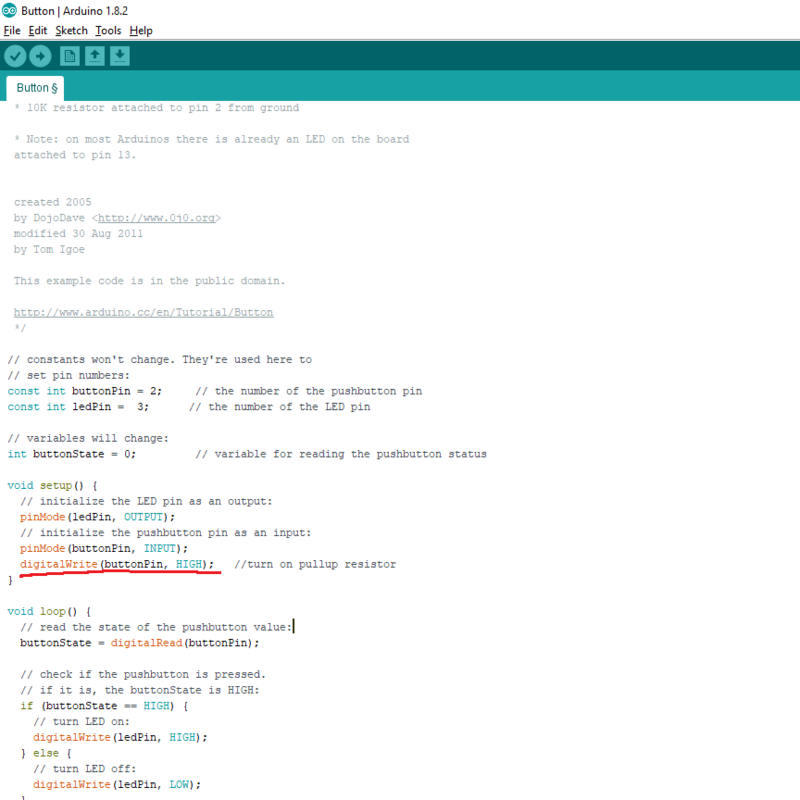 When I had the attiny installed I went into examples and found the servo sweep function in the arduino library. To see which pin to write into the code I compared the drawing of the board. I tried programming the board with that but it didn't work. I did some research and found out that the The Attiny doesn't support the Servo library for the Arduino. Since the Hello Servo 44 board wasn't working I decided to use the output design week to write about the output portion of my final project board. Since I created the Hello Servo 44 board I have changed my final project idea a little bit and I am going to use a dc motor with gears insted of a servo motor. I talked a little bit about the board I made for my final project in the input device week and later on I will write a more indepth description about it on my final project page but here I will write about the output portion of the board. One thing I had to have in mind when designing the board was that the traces had to be a bit thicker where the motor got its power. That is because if they are the same thickness as the other traces they can't handle the current the motor needs. I connected the motor to the 4 pin header on the final project board, a ribbon cable between the Fab Tiny ISP programmer and the board and a power supply to the board. Then I connected the programmer to the computer and started programming in Arduino. The board will control a jameco dc motor with a gear head (part no. 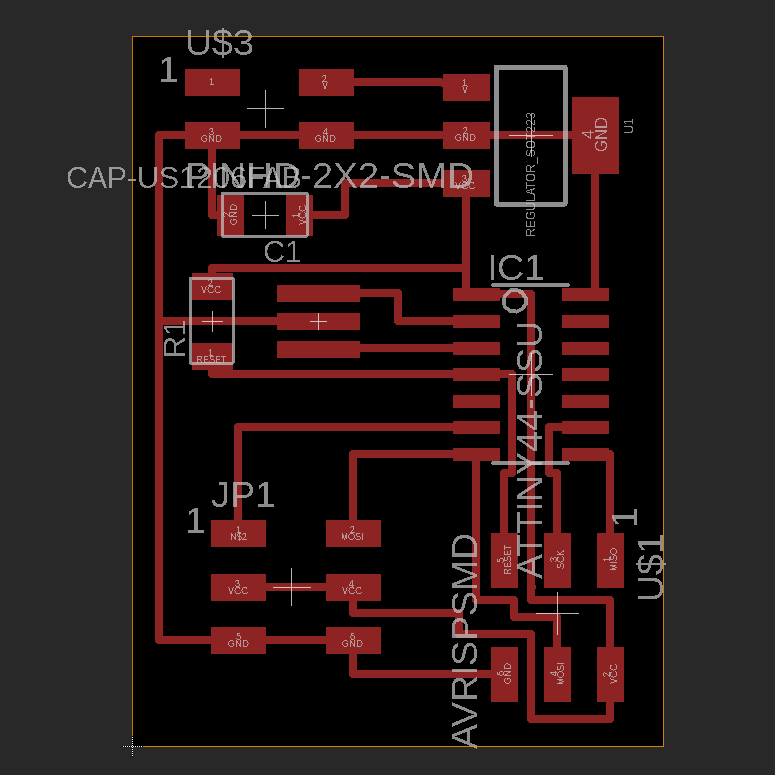 253471) and I want it to turn according to the input the board gets from an air quality sensor. But before making the that code I first wanted to see if I could get the motor running with the board and use a potentiometer to control the spin direction. I made the mechanism for the window opener and integrated the motor and the board into that design. Now when I turn the potentiometer counterclockwise the window opens and when I turn it clockwise it closes. 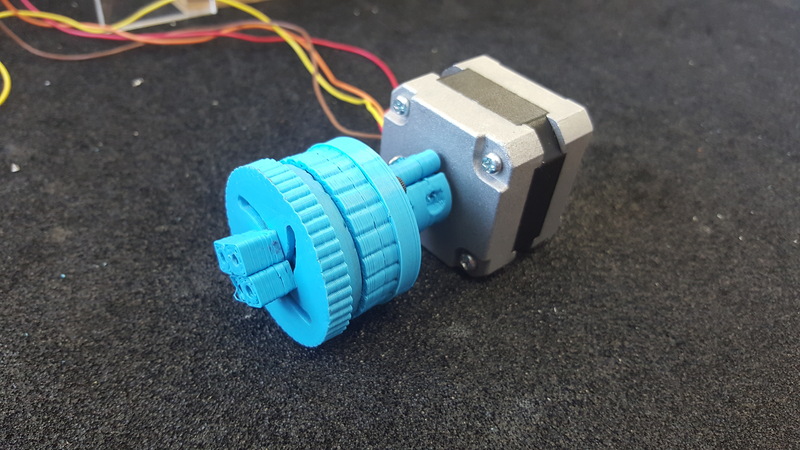 When the value of the potentiometer is between certain points the motor does not turn and the window stays in its current state. The assignment for the 14th week was to write an application that interfaces with an input and/or output device that I made, comparing as many tool options as possible. For this week there were many options too choose from as always but I decided to try App Inventor. 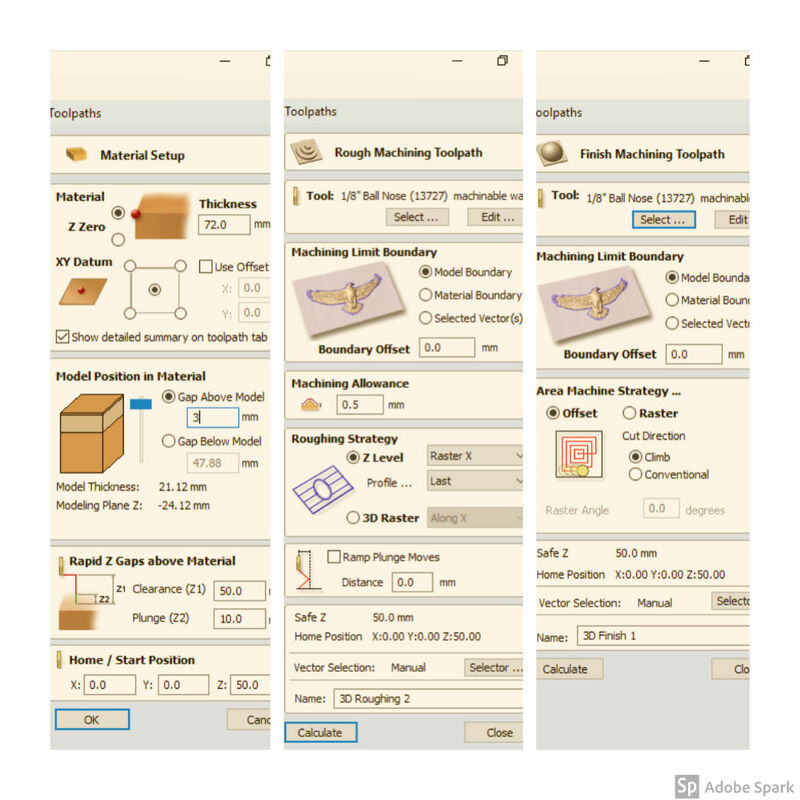 App Inventor has two workmodes, Designer and Blocks. 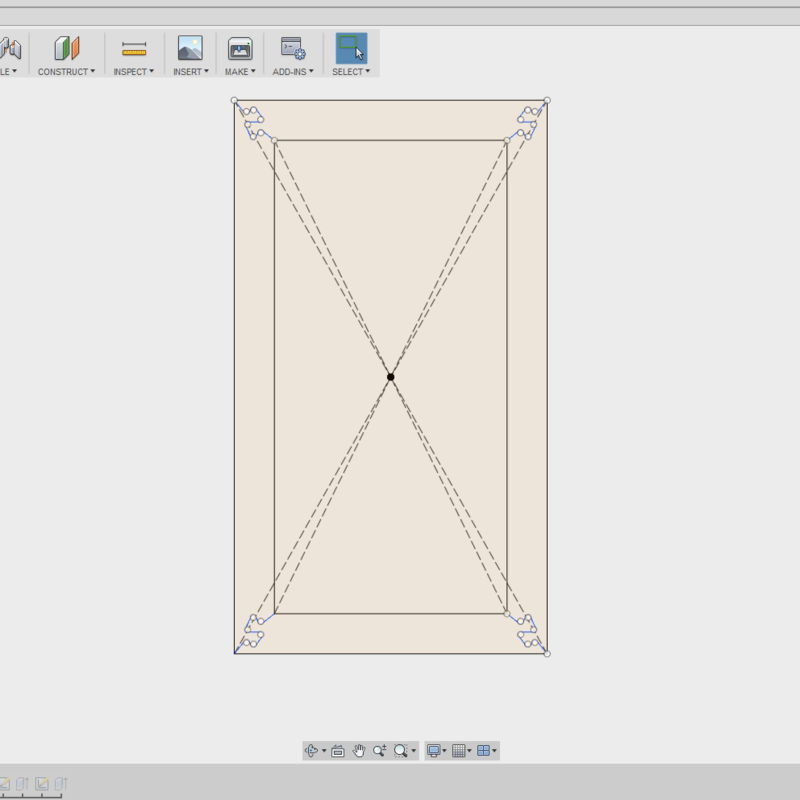 You start of in the Designer workmode and drag all the components you need to the table in the centre of the screen. When you have all the components you can start arranging them and deciding what they will do in the Blocks workmode But you can always go back, add more components or change anything in the Designer mode and that will automaticly update in the Blocks mode. There are a bunch of tutorials on The App Inventor Page . The tutorials have three difficulty levels, Basic, Intermediate and Advanced. Because I have never tried App Inventor before I wanted to try some easy projects (ranked Basic and Intermediate) first before starting my own project. I started making a really easy game that was called Mole Mash. In that game a picture of a Mole appears, if you click it within a certain amount of time you get a point and then it appears in another place. Here is the tutorial for the Mole Mash. I also made a minigolf game but I didn't completely finish it because it was such a long process. Here is the tutorial for the Minigolf Game. 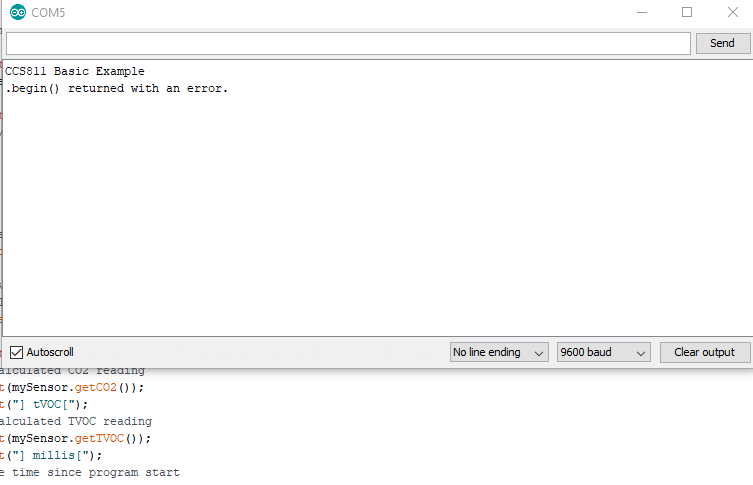 Now that I had tried App Inventor out a little bit I started with my own project. I wanted to make an app that displayed the readings from the temperature sensor board I made in the input design week and use that for my final project. I found a really good tutorial on how to create the app in App Inventor. But since the turorial on how to program it was for arduino I couldn't really use that. We tried making bluetooth boards to communicate with the app but the bluetooth always overheated and got ruined for some reason so I decided to leave that for now. that idea. Since App Inventor didn't work I wanted to make a program that turned a dc motor based on an input from the computer. For example if I would write a letter on the keyboard that would control the spin direction of the motor. I used the same board I had used in previous weeks for my final project and connected that to the computer. To program it I used Arduino because I have been using that recently and understand that better than most other programming techniques. I started with the same code as in the output devices week where I controlled a motor with a potentiometer. I read a little bit about how people have made interfaces between motors and computers before. Most people who have used arduino programming to do that have used an arduino to read the signals. Since I was using my own board to do that I had to do some things differently. The assignment for the 15th week was to design and build a wired and/or wireless network connecting at least two processors. 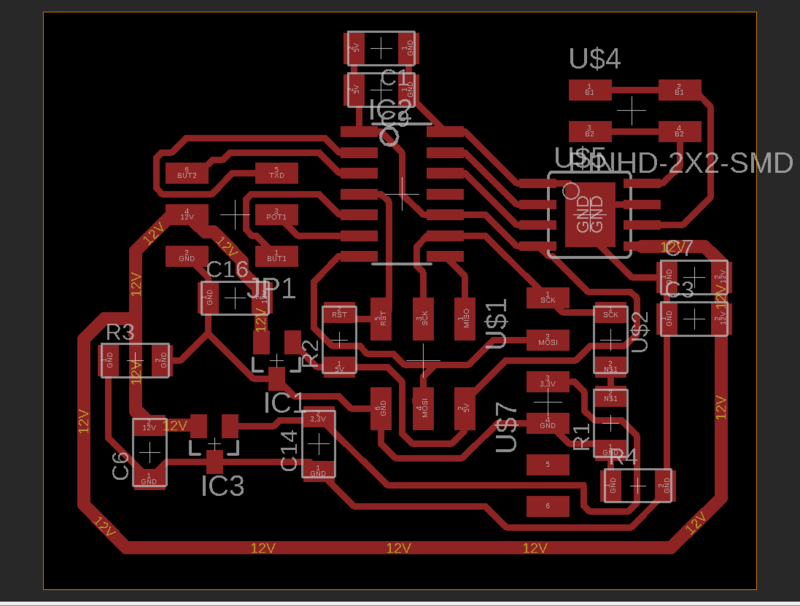 For this week I wanted to try to make the sensor I have for my final project talk to the final project board. 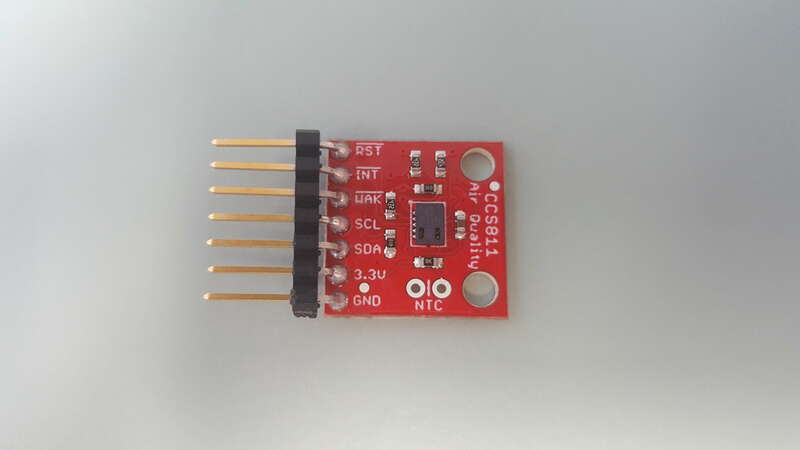 The sensor is a CCS811 Air Quality Breakout from Sparkfun that senses CO2 (Carbon Dioxide), VOC (Volatile Organic Compounds) and it is possible to solder on a temperature sensor. It uses I²C (Inter-Integrated Circuit) to communicate with the board. I²C is a multi-master, multi-slave serial bus that can be used both to communicate between components on the same circuit board or to connect components that are connected with a cable. 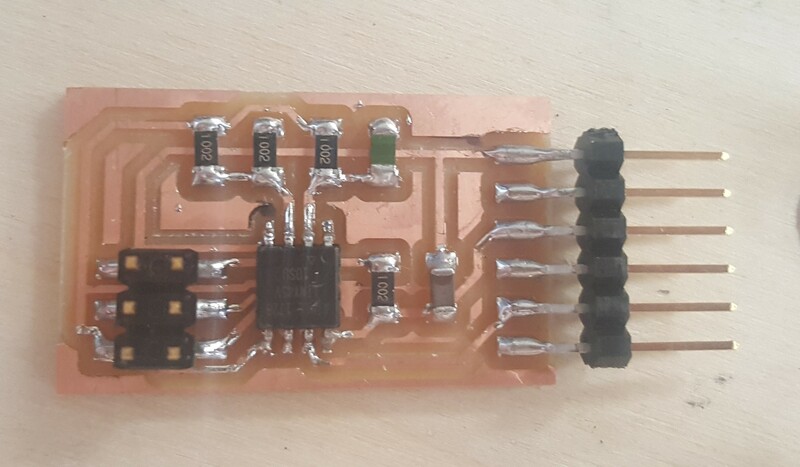 It is often used to interface between a microcontroller (that controls the clock for the bus) and devices such as temperature sensors, accelerometers and EEPROMs. I²C connects two types of devices, masters and slaves. Usually an I²C Bus only has one master and can have either one or multiple slaves. 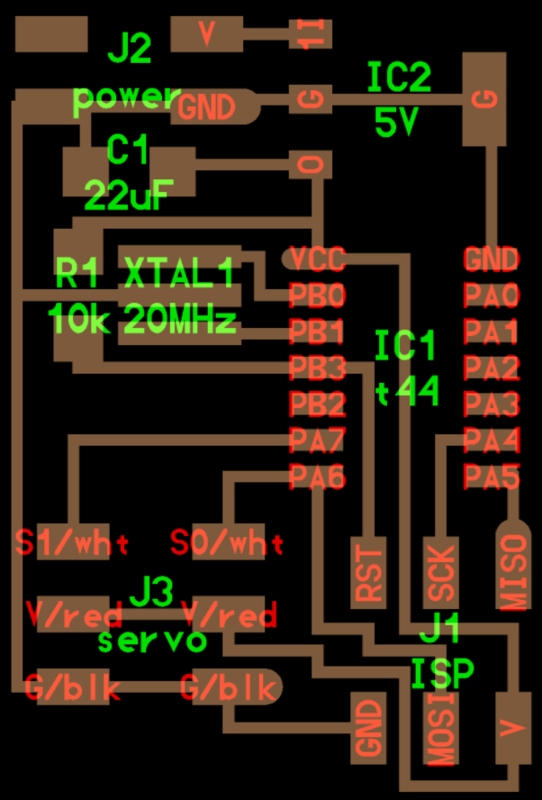 The master controls the I²C and sends commands to the slave devices. Both masters and slaves can transmit and receive data but only the master can initiate a communication event. The master is often a microcontroller, mine is the final project board, and the slaves are often sensors in my case I have one slave that is an air quality sensor. 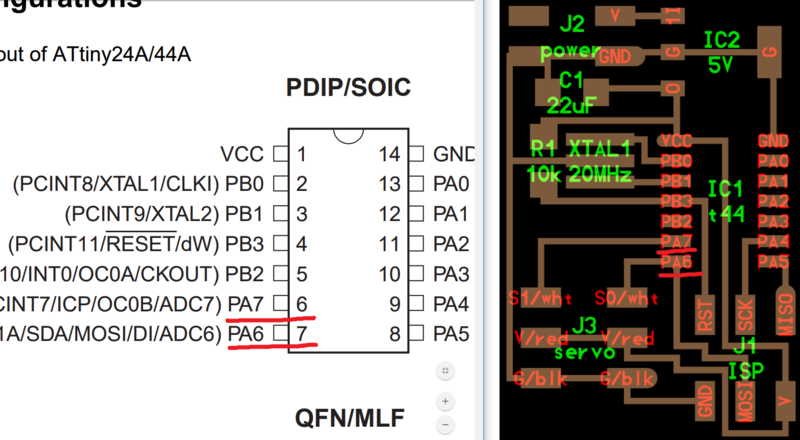 I²C is often know for its simplicity because it only uses two communication wires, SCL and SDA. The SCL and the SDA lines use open drain outputs which means that each device (master or slave) can pull the line low or allow it to float. Open drain outputs prevent two devices from trying to force the line to both VCC and GND at the same time, which would cause a short citcuit. When the I²C master starts a communication event the SDA pulls low and shortly afterwards the SCL pulls Low. The opposite happens when the communication is complete. Then the SCL pulls high first and the SDA does so also shortly after. To be able to get data from the sensor I only needed to use the four bottom connections, SCL, SDA, 3,3V and GND. To connect the board to the air quality sensor I soldered a female ftdi connector to the sensor. I connected GND to GND, 3,3V to 3,3V, SDA to MOSI and SCL to SCK with male-female connectors. To program the board I connected it with a 6 pin header cable to a FabTinyISP Programmer and that to the computer. To get power I used a FTDI Basic from Sparkfun. 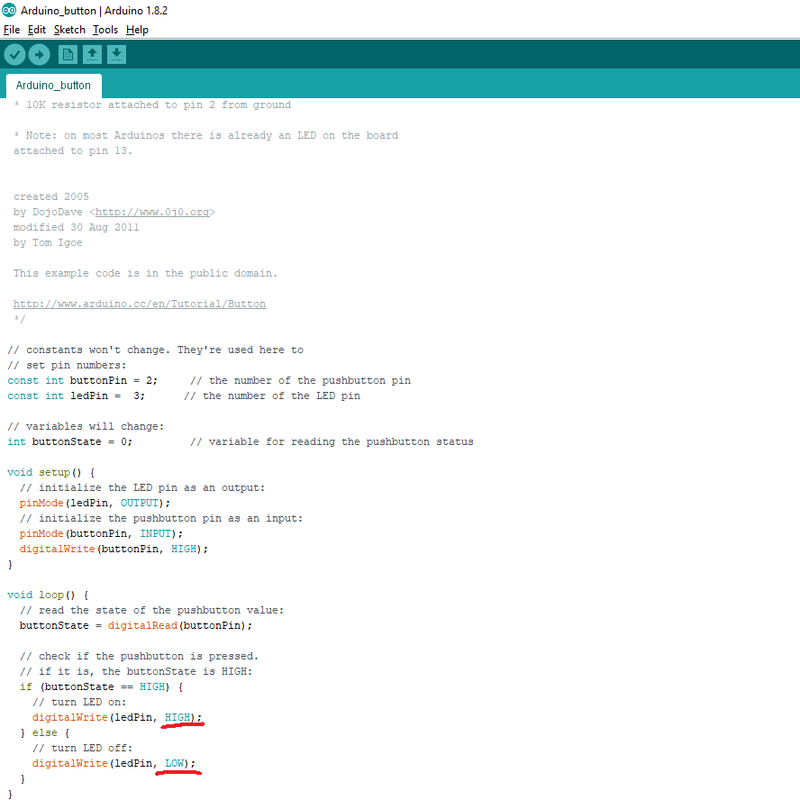 As with most of the programming I have done I did it in Arduino because I think that is a really comfortable and user friendly programming software. 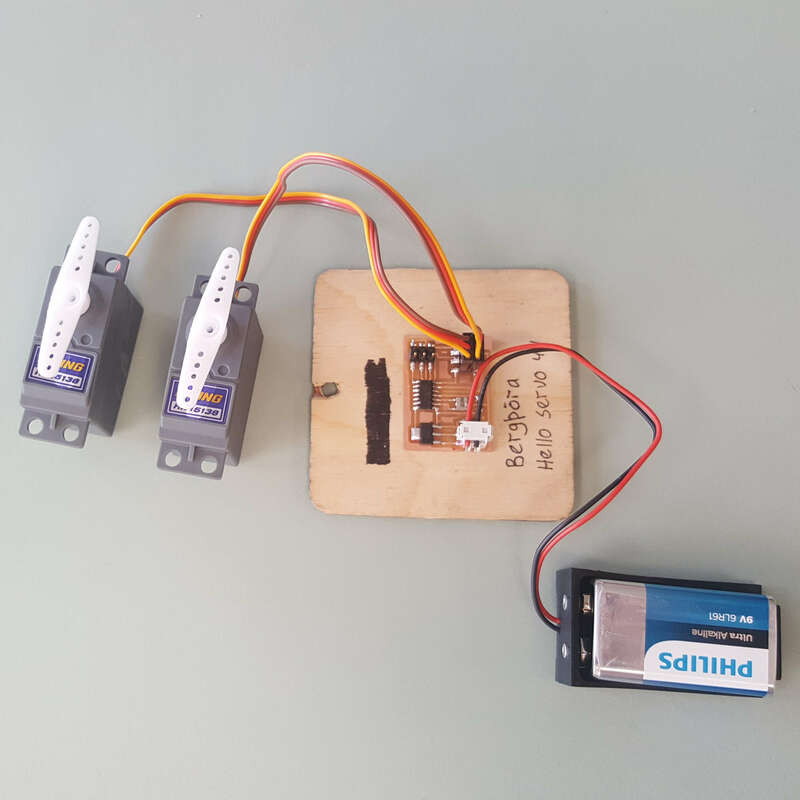 I have already programmed all the boards separately but I am going to use this assignment to connect all of them together. 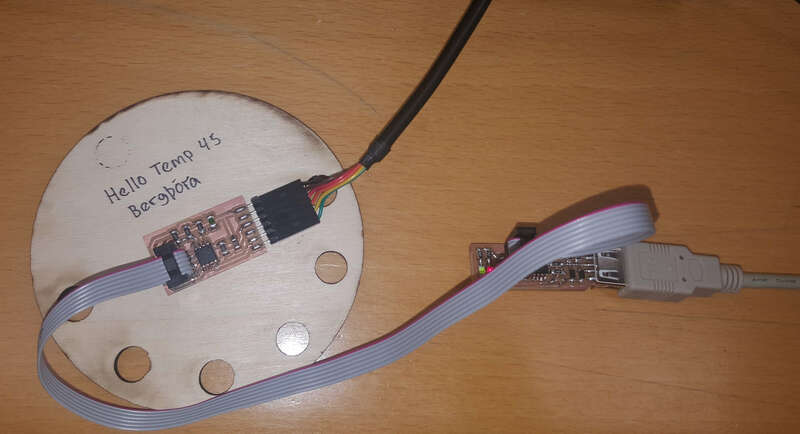 I started with the code I had already made for the dc motor controlled with a potentiometer and the code I had for reading the input from the sensor. I needed to mix those to codes together so that instead of being controlled by the input from the potentiometer it would read the input from the sensor and respond to that. The assignment for the 16th week was a group assignment to design a machine (that includes mechanism, actuation and automation), build the mechanical parts and operate it manually. In our lab in Vestmannaeyjar we had a cnc milling machine that had been made a couple of years ago but didn't work anymore. For this weeks assignment we wanted to add an attatchment to that to change it into a lathe. The first thing we needed to do was to figure out how the milling machine worked and get that to work. We tried to do most of the project as a group but since everybody has different schedules we divided the task between us. Me and Bára worked on creating a four jaw chuck to hold the material we would be milling. I also worked with Carl in debugging the current TinyG and ChilliPeppr setup. 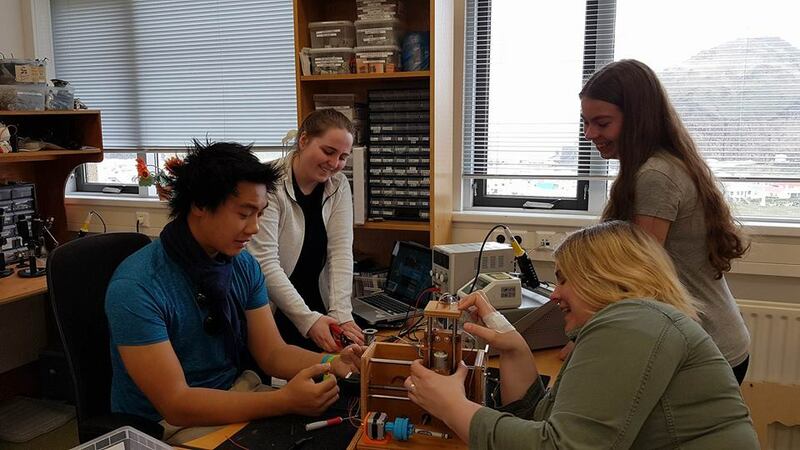 Then all of us worked together in manual control of servo motors. We also did some tests on the with TinyG with Coolterm and connected the TinyG to the motors. The milling machine has 3 stepper motors connected to a TinyG v8, one for each axis and a dc motor used to turn the spindle. We connected the TinyG to a power supply and to a computer with a USB B. Then we used Universal G-code to controll the milling machine. The dc motor wasn't connected to the TinyG since that is only for the servo motors so we connected it to a 12v power supply to get that running. 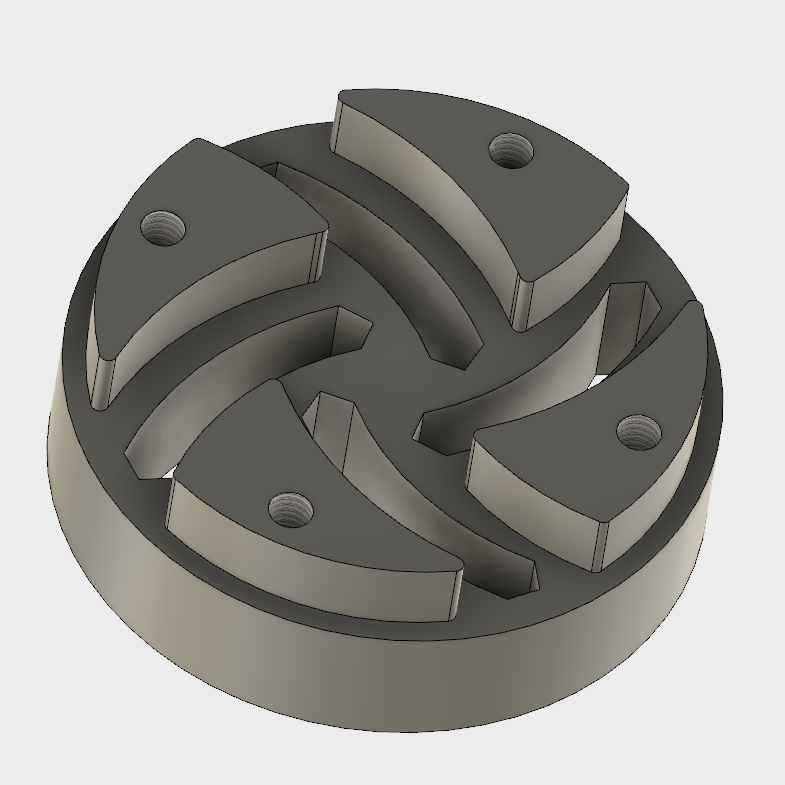 To hold the things we want to mill we are going to make a 4 jaw chuck. 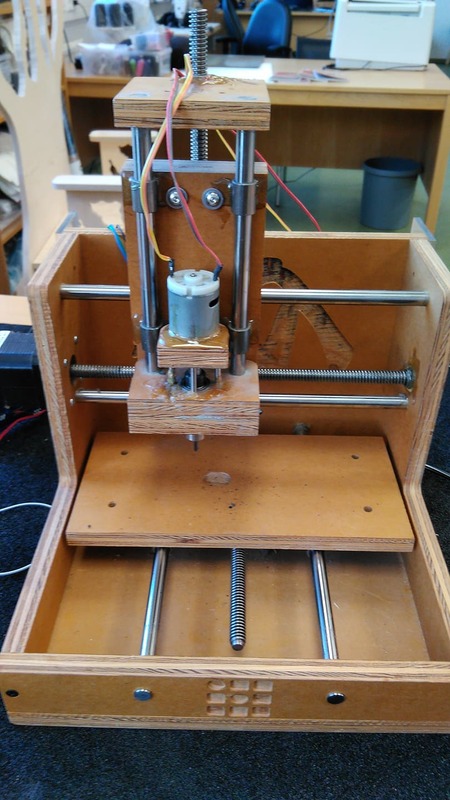 To understand the mechanisms of the chuck we found a model of it online and printed that out. 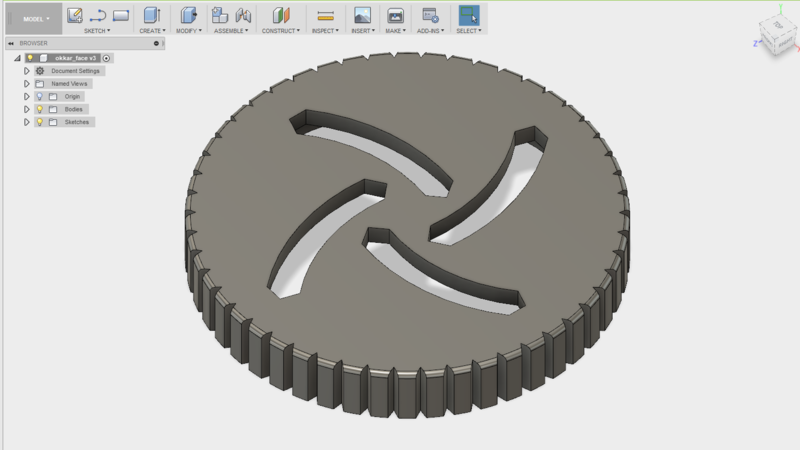 Then we started making our own self centering 4 jaw chuck in Fusion 360. The top and the middle part both have the same 4 jaw slot design but it is mirrored on one part (the curve of the slots is the same as the curve of the outsides edges of the part). When you put those two parts together you can align it so that the end of each slot on the middle part is located directly beneath the end of the slot on the top part. That is where the lugs go, and if you rotate it the lugs move to the center of the part which tighthens the grip on the part we're milling. The bottom part and the middle part fit together to make it easier to turn it. On the top of the bottom part there is a guide for the lugs. The outside of the bottom and the top part has a knurling. Here are some of the notes we made while designing the chuck. 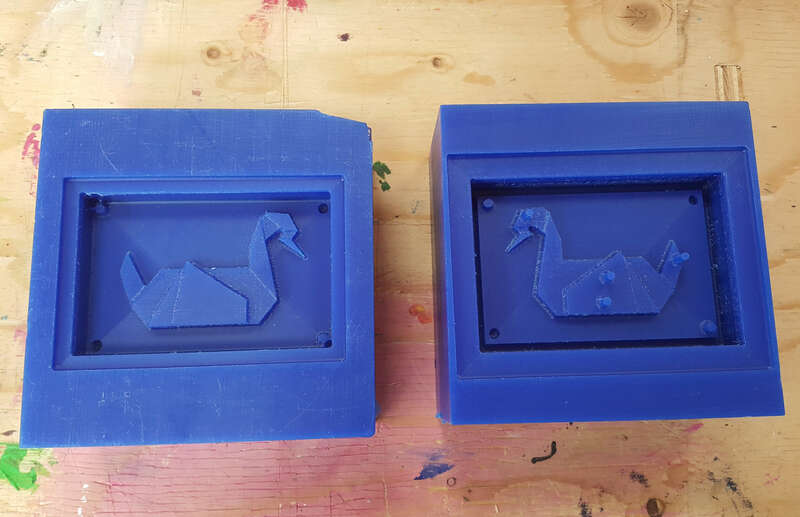 We had to do a bunch of prints of each part, both because we were changing the design between prints and also because we had to play around with the settings of the 3D Printer. When all the parts for the chuck were ready we assembled it and attached it to the motor with the coupler. To get the motor to turn we followed the instructions on The TinyG Wiki . 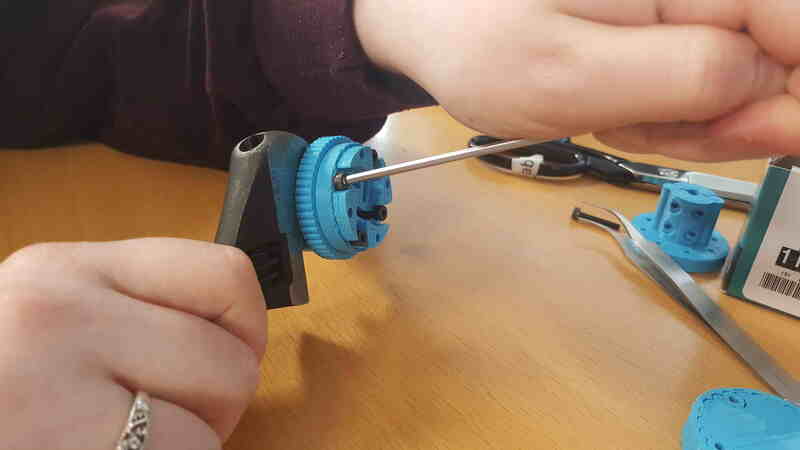 We started with connecting the motor to the TinyG making sure to have the wires that are connected to the same coil connected to the same winding pair (A1-A2 and B1-B2). You can often see what wires are pairs from the colours of the wires. Green connects to winding A1, Black to A2, Red to B1 and Blue to B2. But to make sure they are correctly connected or if the wires are different colours you can use a multimeter to see which ones are pairs. When we had connected the motor we connected it to a 12 volt power supply, negative to GND and postitive to +Vmot and to a computer with a USB B. 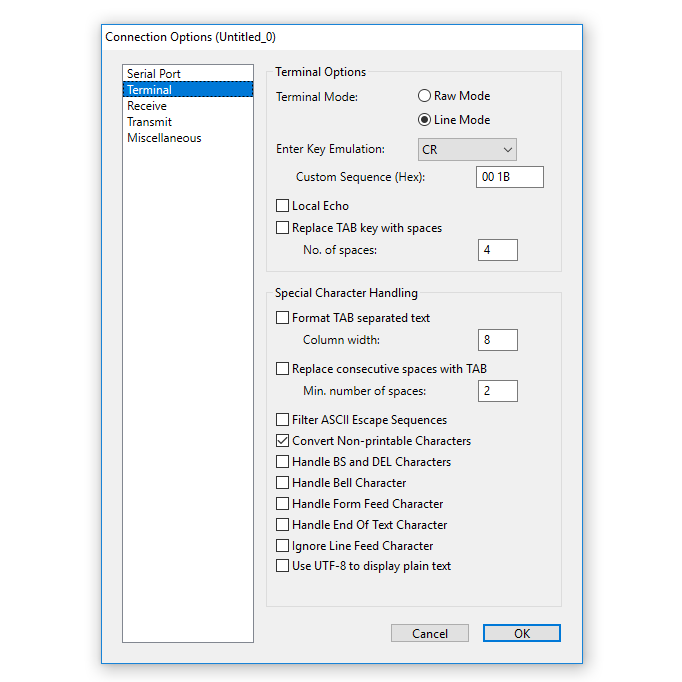 Then we downloaded the FTDI Drivers and Coolterm There are also instruction on how to use Coolterm on The TinyG Wiki but these are the settings for that. To see if we got any response from the TinyG we started by pressing the space bar, enter and then we wrote g1 f400 x50. 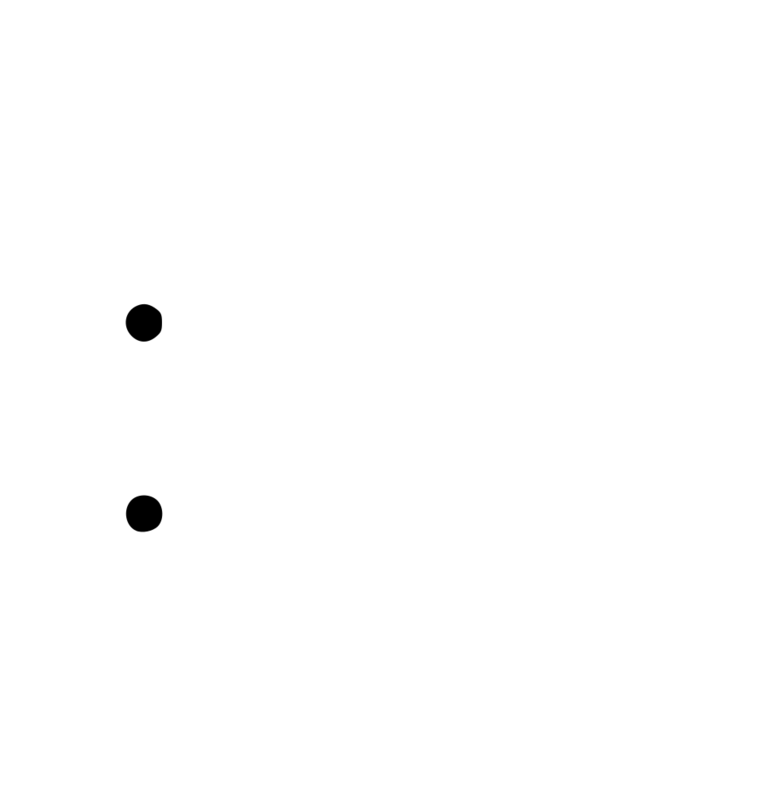 In that command g1 stands for the speed of the movement, f400 stands for the the speed of the feed rate (how fast the command is sent) and x50 for the axis (x,y,z,a, etc) and the position of the spindle on the axis. We tried changing the last part of the command to see if we could get the other axes to move. To get our new motor to move we just had to write a50 instead of x50. The tests we ran weren't really structured, we just read a little bit about Coolterm and started trying it out and for that reason we didn't save the test files. But if you want to run similar tests on your machine you can find information about Coolterm in The TinyG Wiki . The tests we did with Universal G code were not really structured either. We just found the middle and zeroed the machine there. Then we controlled the axes manually to figure out how far in each direction the mahcine could move. Then we made it move from the limit point on one side to the other on all the axes. 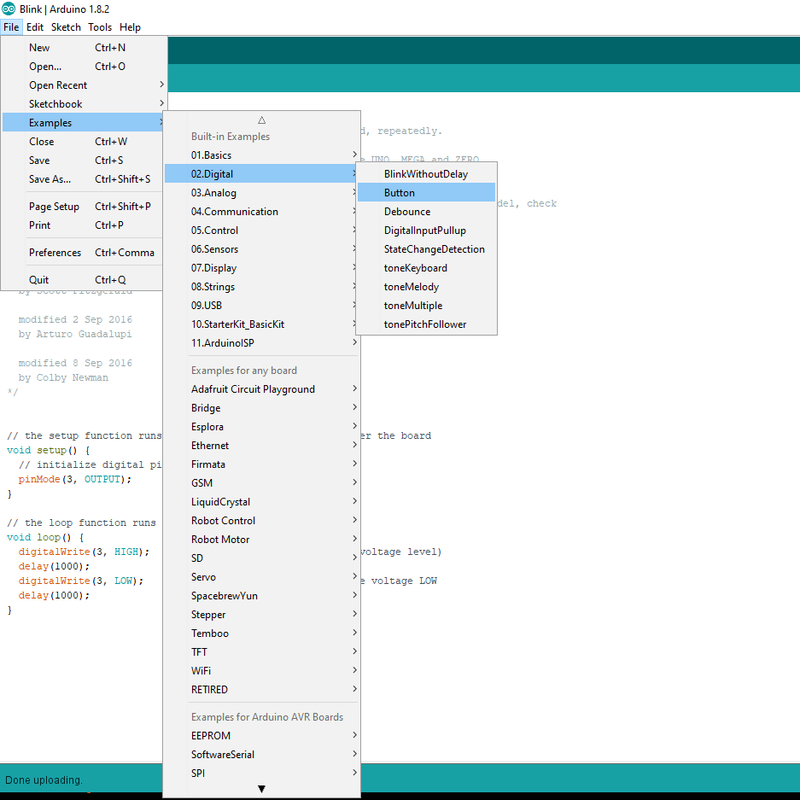 When we had gotten the Coolterm to work we wanted to use Chilipeppr. First we needed to connect to the serial port. 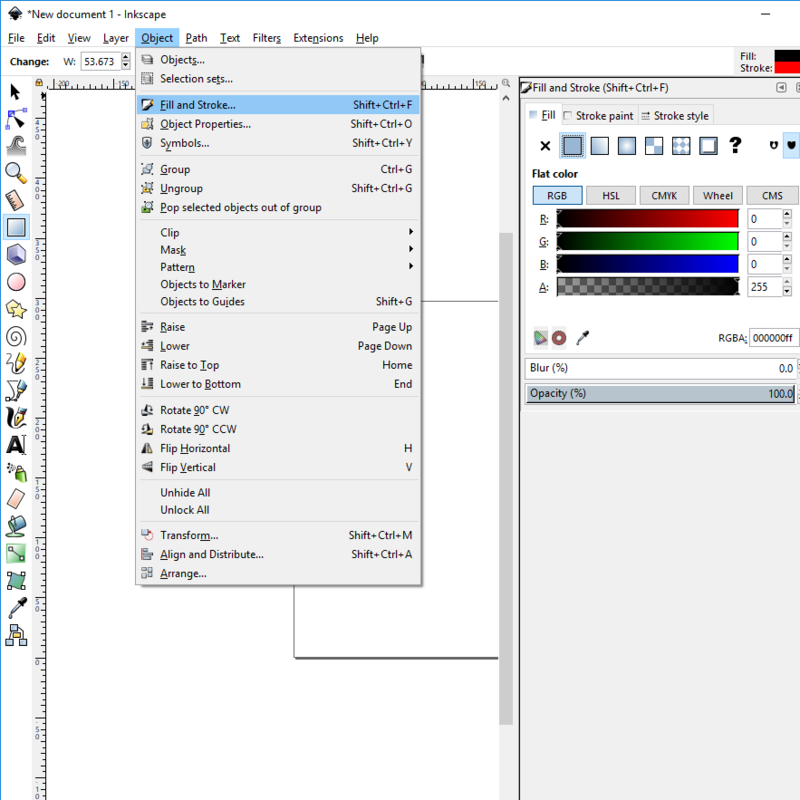 There are a few ways you can use Chilipeppr, you can control it manually with the Jog control buttons, import g code, png images, svg files and more. 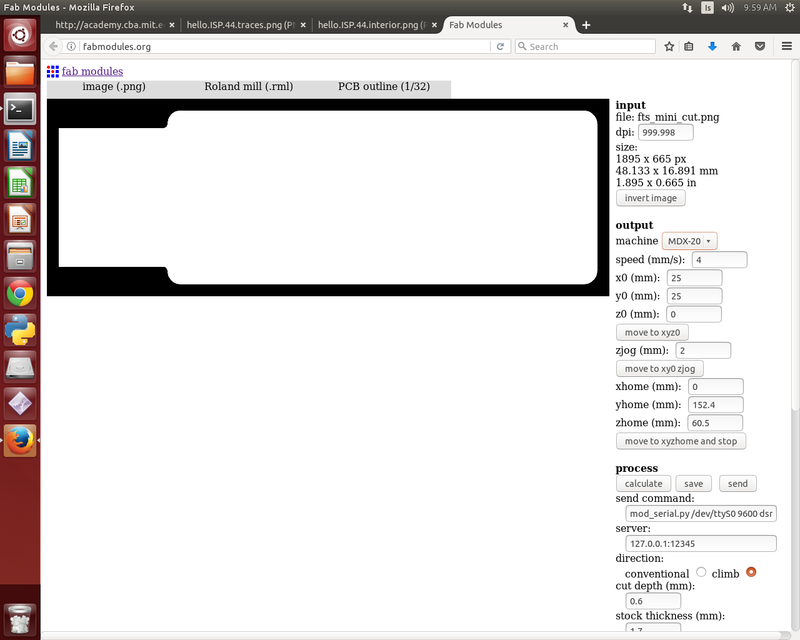 We tried to import png images and svg files and that worked fine. We could see the machine moving according to the file we imported. 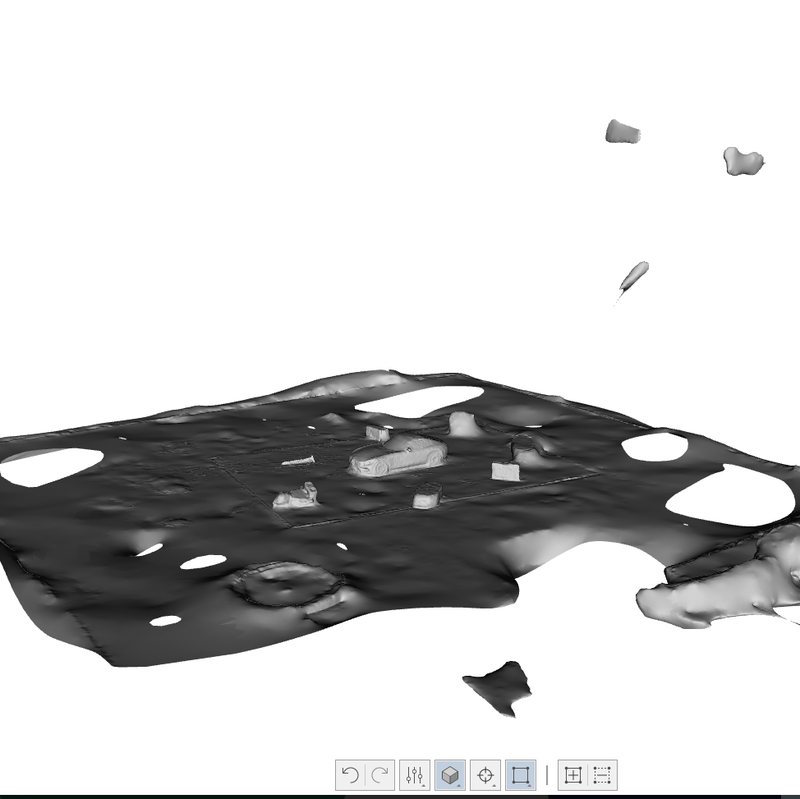 Carl and Bára then tried to create toolpaths in Fusion to import as gcode into Chilipeppr. They could create the toolpaths but had problems exporting it from Fusion. Overall I think this group assignment went really well. But to improve the milling machine it would be a good idea to make the chuck with some other technique than 3d printing so it would be stronger and able to hold the objects we want to mill more tightly. 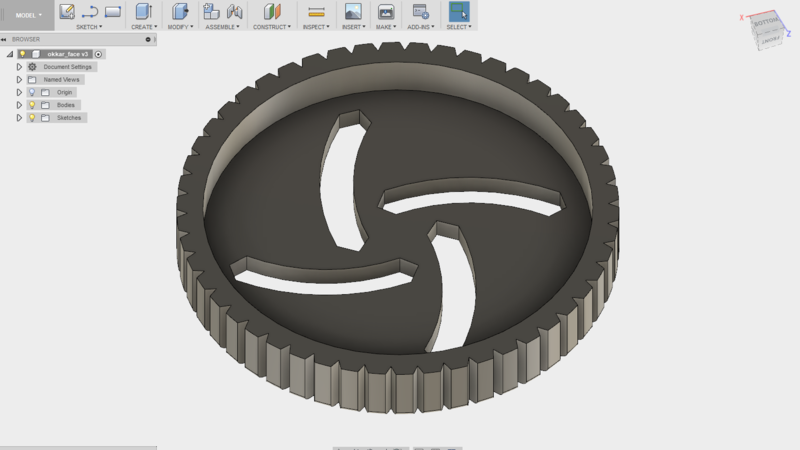 It would also be good to figure out how we can export gcode from fusion so that we could mill based on a 3d design from fusion. Limit switch board Eagle brd file. Limit switch schematic Eagle sch file. 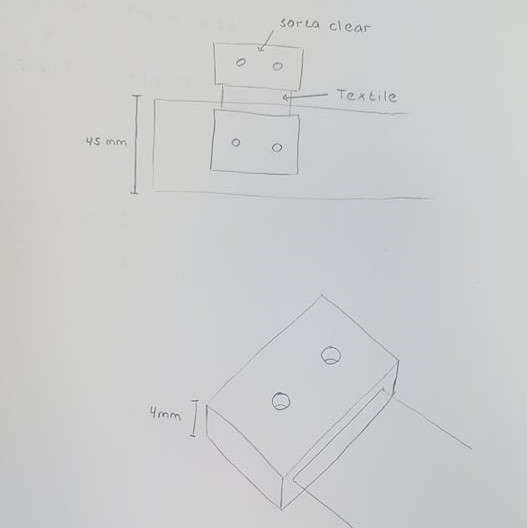 The assignment for this week was to design and produce something with a digital fabrication process (incorporating computer-aided design and manufacturing) not covered in another assignment, documenting the requirements that your assignment meets, and including everything necessary to reproduce it. Possibilities include (but are not limited to) composites, textiles, biotechnology, robotics, and cooking. I have never tried composites before so I wanted to try that. I don't know much about composites so I started by doing a little research on what materials can be used. I wanted to use carbon fiber but the only fiber composite material we have in our lab is glass fiber and I didn't want to use that because it can be quite harmful. Since I didn't want to use the glass fiber and we didn't have carbon fiber in our lab I decided to use natural linen (burlap and white linen) combined with the Super Sap CLR Epoxy. The Super Sap Hardener has three hardener speeds, CLF/FAST, CLS/SLOW and CLX/EXTRA FAST but we only have the CLF (FAST) Hardener in our lab. 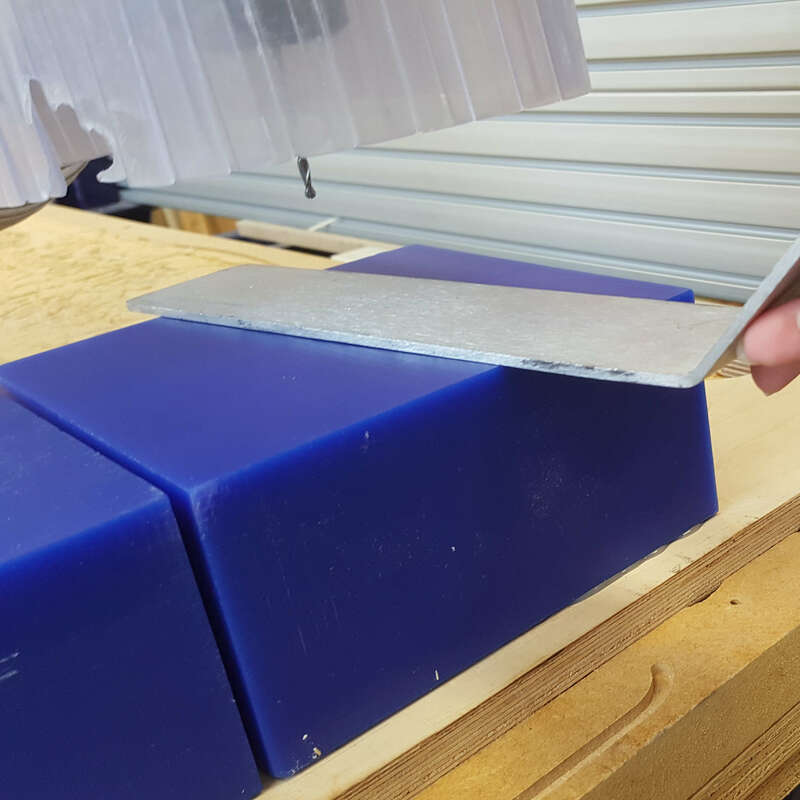 When I started reading the Techincal data sheet for the Epoxy I found out that it is actually a really good option because it is a lot better for the environment than many other composite materials. It is produced with green chemistry that eliminates harmful by-products such as chlorinated hydrocarbons. The production has a 50% minimum reduction in CO and greenhouse gas emissions. The power and water consumption has been reduced and so has agricultural land use. But Super Sap CLR Epoxy also has additional benefits other than environmental. It has improved mechanical performance and formulas catering a wide range of processes and applications. It is a water	clear,	UV	stabilized	epoxy	system	for	applications	that	require	a low	color,	low	yellowing	epoxy	resin,	such	as	for	surfboard	lamination	and	coating. 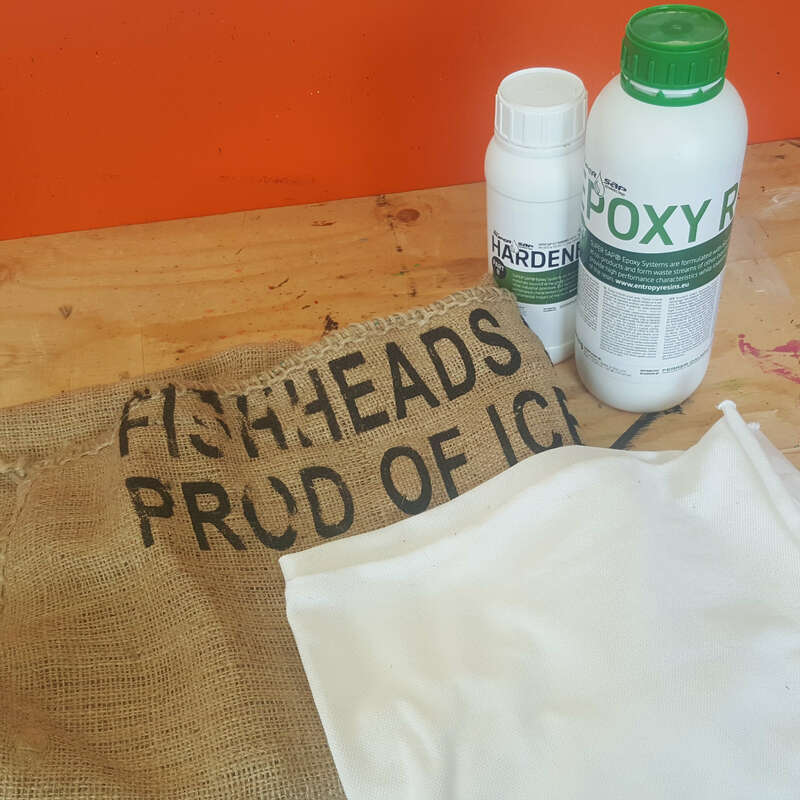 The viscosity of the epoxy is ideal and it has fast room temperature cures. When I read the Safety data sheet I found out that this epoxy resin can cause some harm if inhaled, swallowed or if it comes in contact with skin or eyes. However the consequences of inhalation, contact with skin or eyes or if swallowed aren't too bad. You just have to seek medical attention if symptoms develop or persist or if you feel unwell. Otherwise you just have to make sure too clean affected areas if it comes in contact with eyes or skin, maintain an unobstructed airway if inhaled and if swallowed rinse mouth, drink plenty of water and do not induce vomiting. But if you are careful and wear the correct protective gear, eg. gloves, clothing and eye and face protection it should be relatively safe. 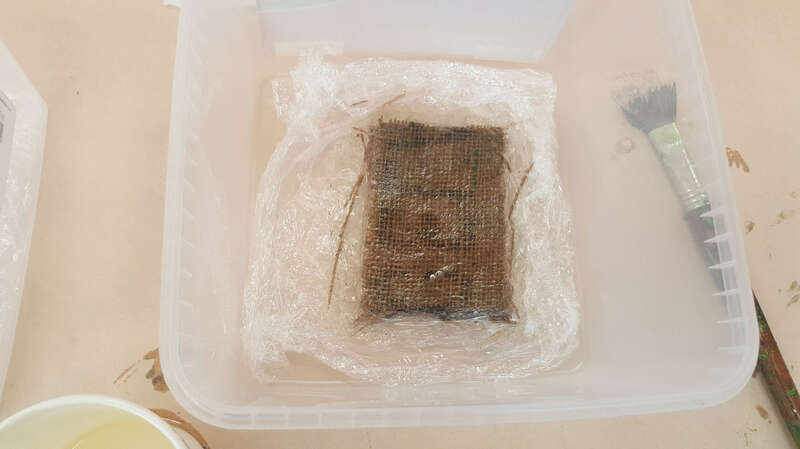 I decided to make a simple square tests to try out the two crossed fiber materials we have in the lab, burlap and a thinner, more densely woven material. I made three tests, one for each material and another one where layers of the burlap and the other material alternate (just because I had a little bit of extra resin left). Before mixing up the resin mixture I made sure the set up was ready to make the process easier and less messy. I took some release film / plastic wrap and put it at the bottom of a small plastic container and had an extra film ready to put on top. 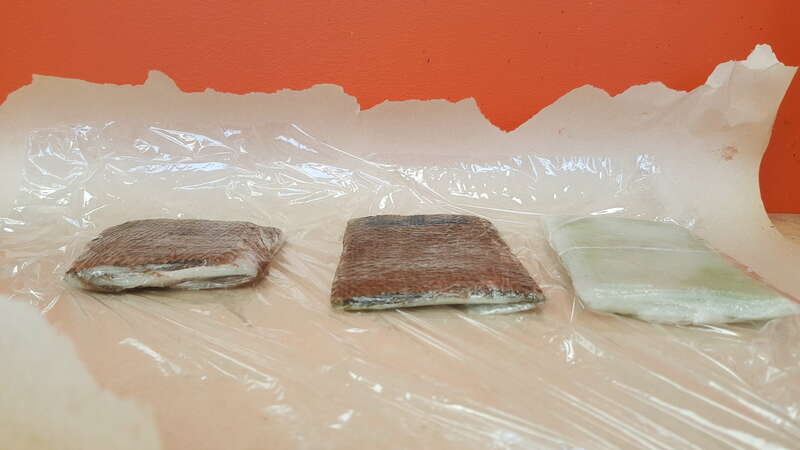 Then I mixed up the epoxy resin in the ration 2:1 2 parts of the resin and 1 of the hardener and started layering. I used a few methods but I found it easiest to pour a little bit of resin on the fabric and spread it out with a paintbrush. 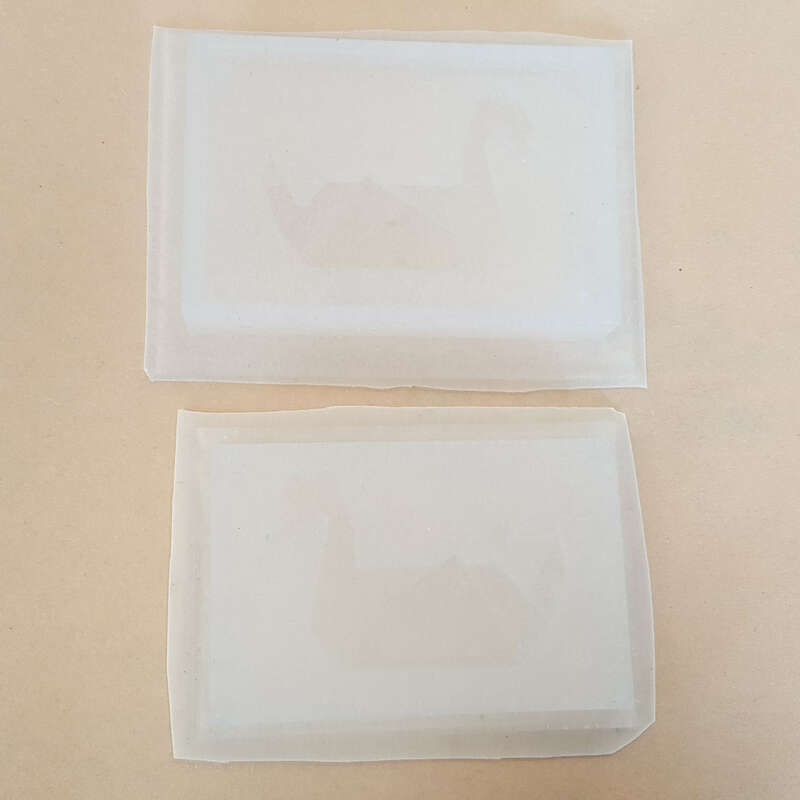 To compress the tests I was going to use the vacuum but we only had one vacuum bag and I wanted to use that for the actual mold so I just took a flat heavy object and pressed it with that. I needed a lot more resin to soak the white fabric than the burlap because it is much more tightly woven and the resin doesn't go through it as easily. For that reason I thought the burlap would turn out better but that wasn't the case. Both the test were really good and hard at first but as the time passed the one with the burlap got softer. Another problem I had was that I couldn't get the release film of the composite. I think the reason for that might have been that it got a bit crumpled up and since it was wet with resin it stuck to the test. I decided to use the white fabric since that test had turned out better and I also liked how it looked more. 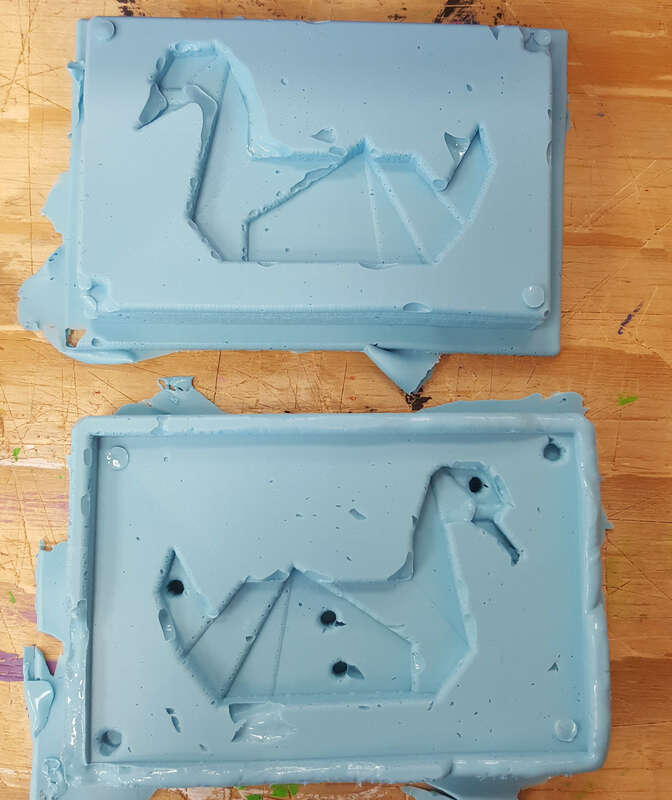 I wanted to use the same mold I used for the molding and casting project but I had to make a few changes to the model like taking out the air holes. 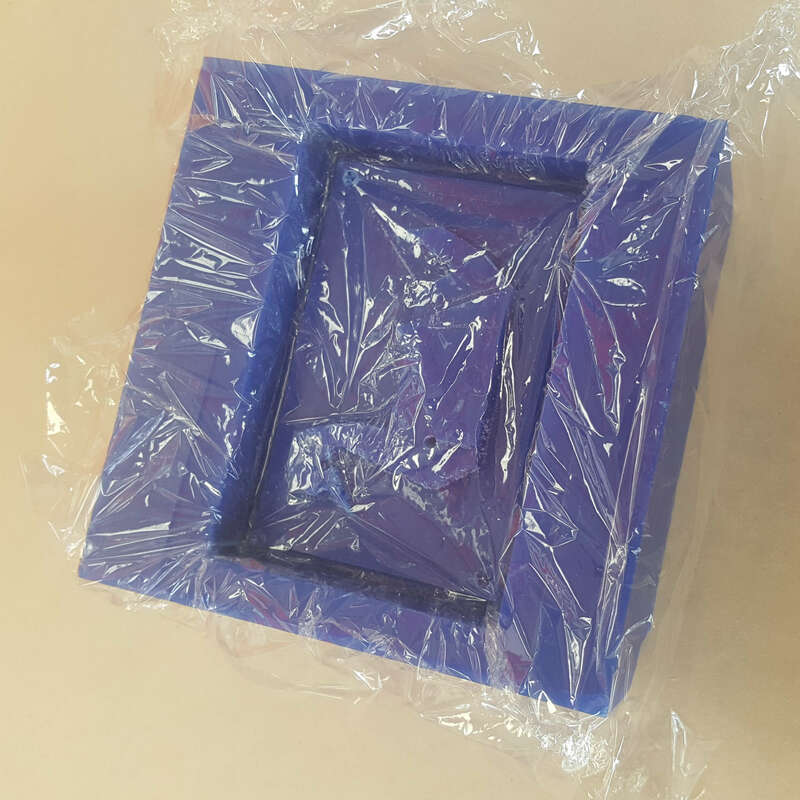 When I was cutting the molding and casting was mold our shopbot lost the z location and went straight into the material creating a hole in the middle of the mold. That made the mold unusable for molding and casting but it was perfect to use with the composite assignment. I did the same thing I did with the test and setup everything I needed before mixing the resin so I would have as much time as possible to work with it. I cut up some square pieces of the fabric and made little 45 degree cuts at the corners to make it easier to make the corners sharp. When the mold was ready I laid a release film/plastic wrap on top of it making sure it had as few creases as possible to try to make it easier to remove the composite. Then I mixed the resin mixture put one piece of fabric down poured some resin on it and spread it out with a paintbrush. I repeated the process two times but when I had put down three layers the resin was getting sticky. I wanted to put down more layers but the resin had become really hard to work with so I just decided to leave it at three layers. Then I finished it by putting a plastic film on the top. To compress the composite I now wanted to use the vacuum bag but I found out that someone had taken the vacuum cleaner and it was no longer in the lab. 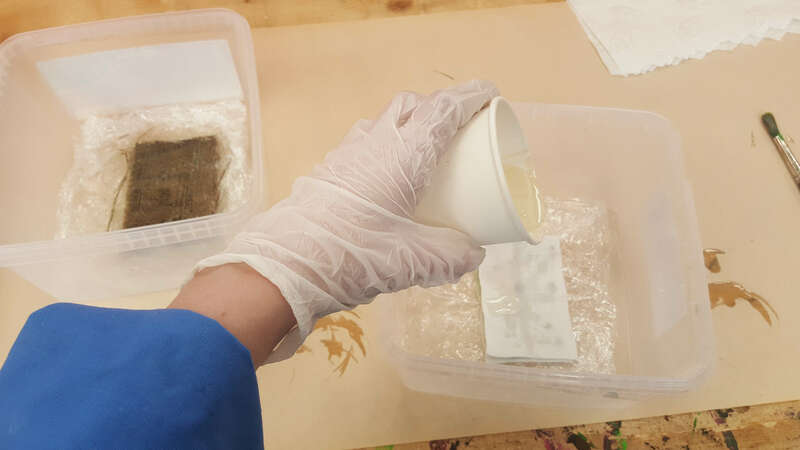 I was running out of time because the resin had started hardening so I decided to just press it down as much as I could with my hands and then use hydrostatic compression. 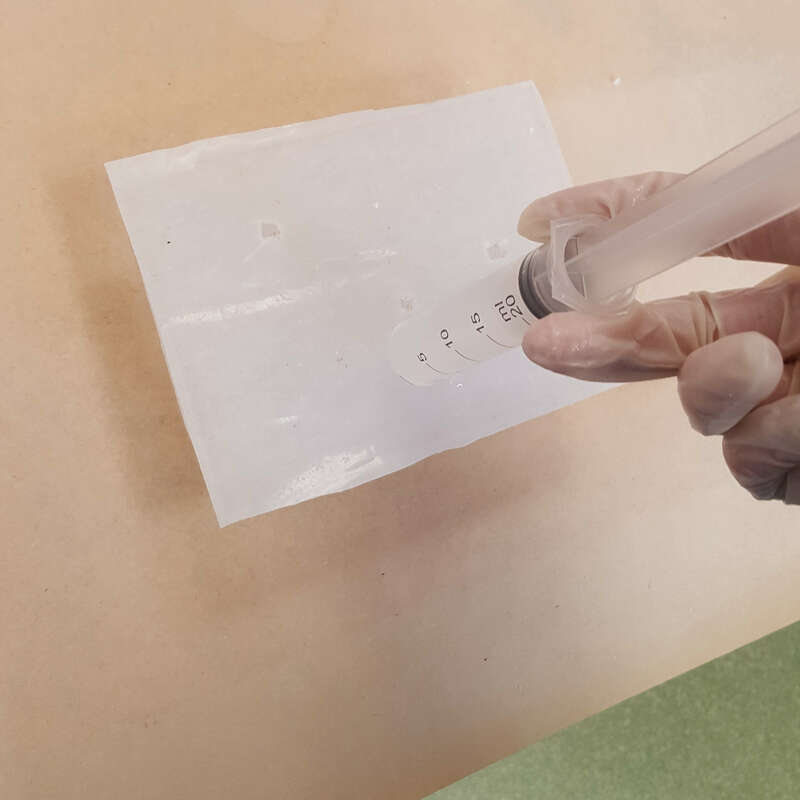 Hydostatic compression is to use water in a plastic bag to compress the composite. I wasn't very optimistic with the outcome of the composite but it came out surprisingly well. It was really hard and you could see the shape of the bird clearly. But in retrospect I should have applied a release agent to the mold before the layup process. The assignment for the 19th week was to propose a final project that integrates the range of units covered, answering the questions below. 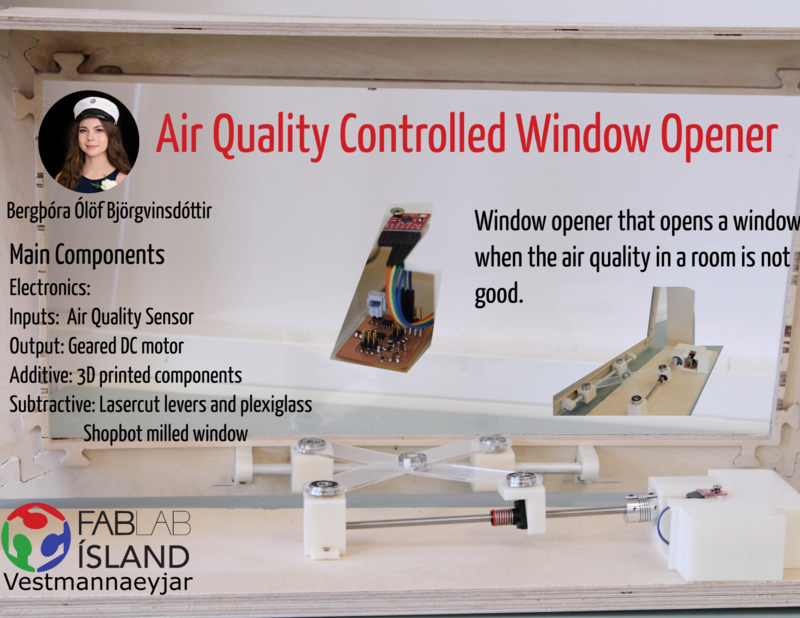 My final project is a window opener that will open a window when the temperature in a room is above a certain point or if the air quality is not good. 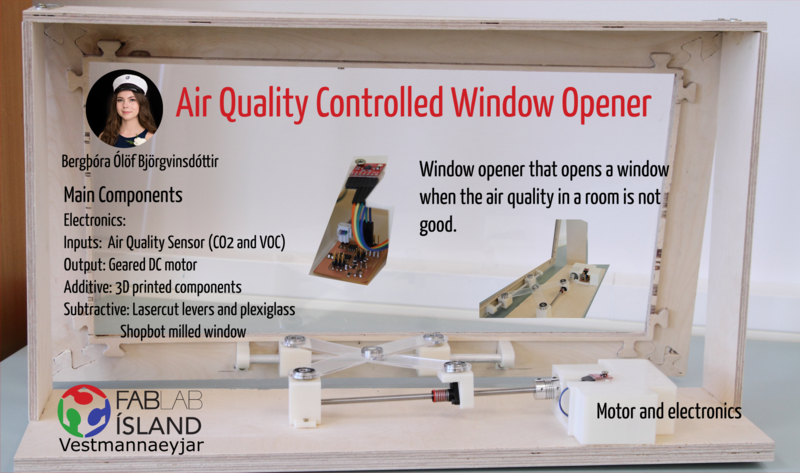 To measure the air quality and the temperature I will use sensors that will communicate with a board that tells motors to open the window. 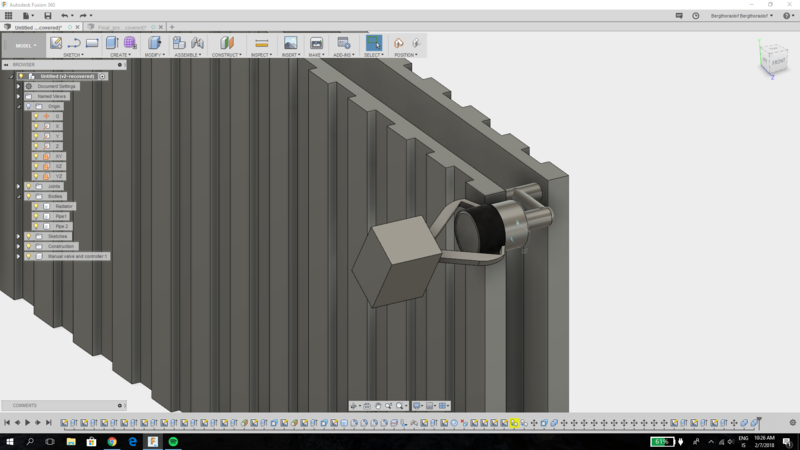 I will mostly focus on creating a window opener that can be fastened on most customary windows since that is more user friendly than making a whole window. But if there is time I am going to make a proper window myself to demonstrate how the window opener works. I have found window openers and temperature control systems but I haven't found anything that combines those two things. Usually in those temperature control systems the heat is lowered by using fans or electric ventilation systems. But I am just going to use the wind outside (I live in Iceland so there is enough of it) which will save electricity. Here is an example of a temperature control system for homes. This one is a zoned temperature control system which means means that the temperature can be different for each room. There for it is similar to mine since the window opener can be installed in multiple rooms. 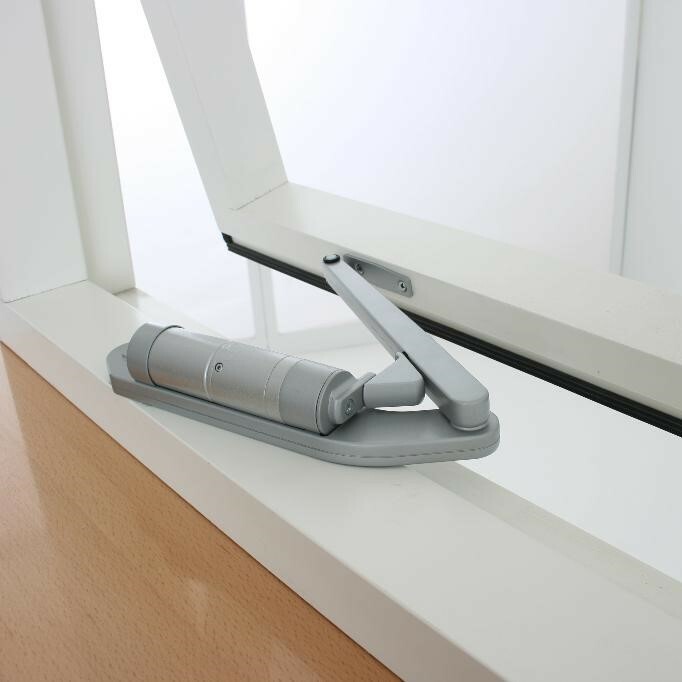 I found a few examples of window openers but the type I am leaning towards making is like the one on the image below. 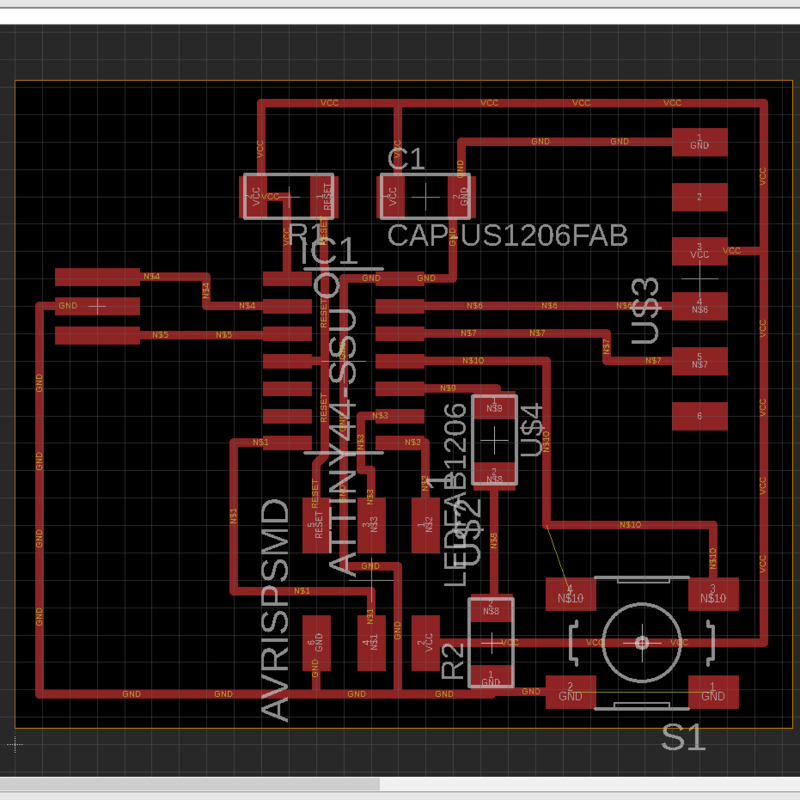 I will design almost all the circuit boards I will be using apart from the one that has the air quality sensor. 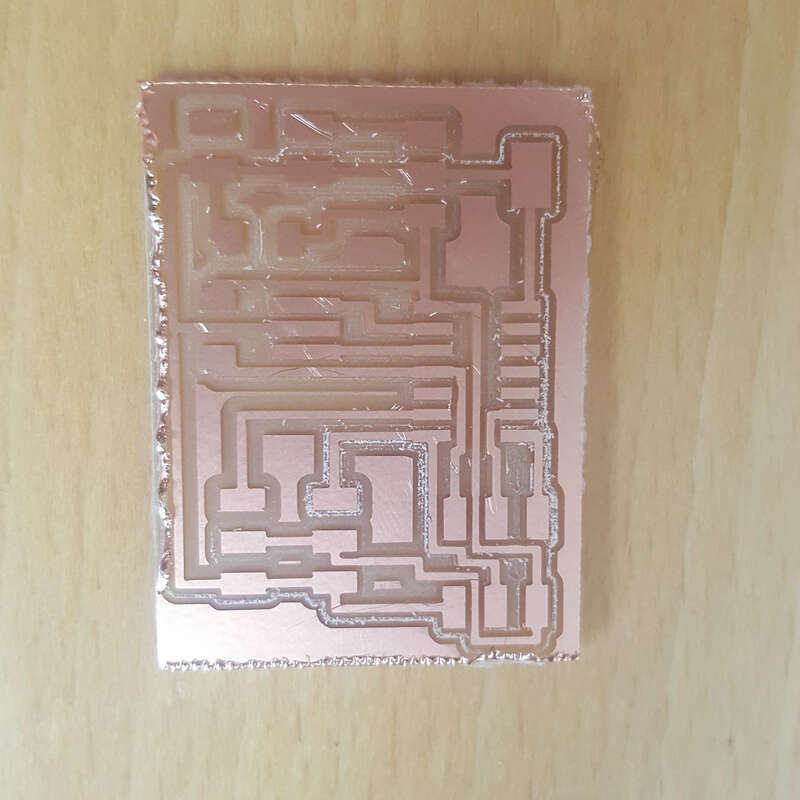 I will be making a board that can communicate with the sensor board and either create another one to communicate with the motors or use the same one. 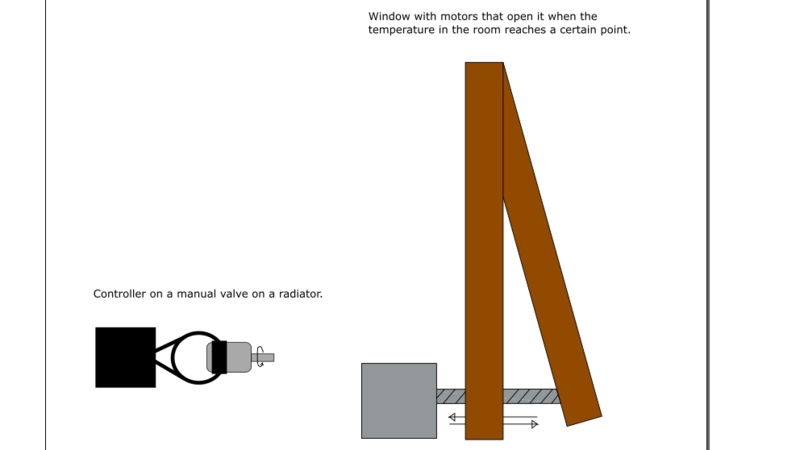 I will also design the mechanism with the motors that opens the window. I already have a few ideas but I haven't decided on how I am going to make it yet. 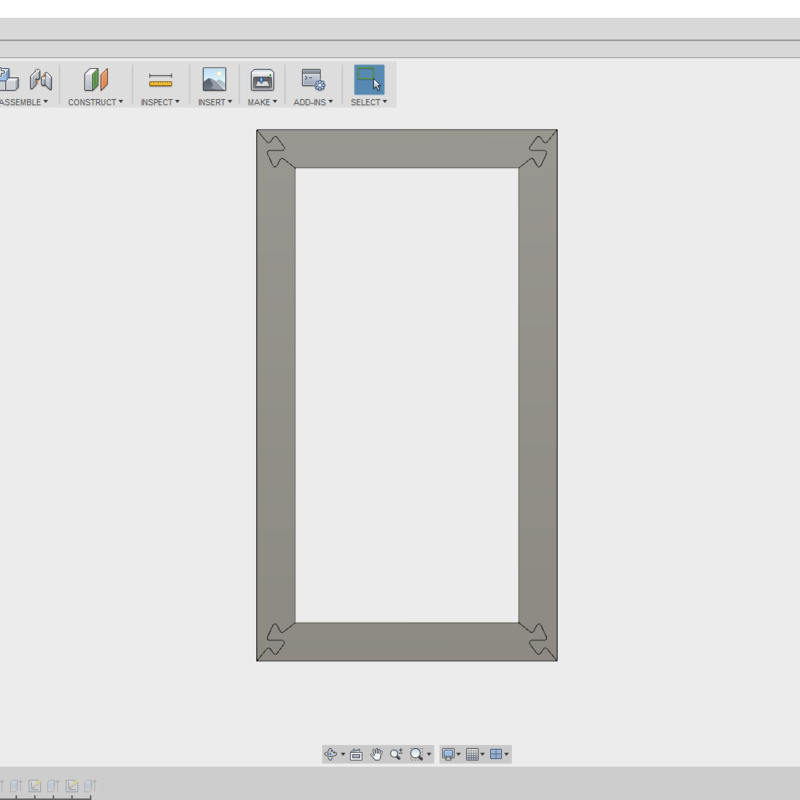 I have designed a window frame that I may use in the final project if I have time to make some changes to it. 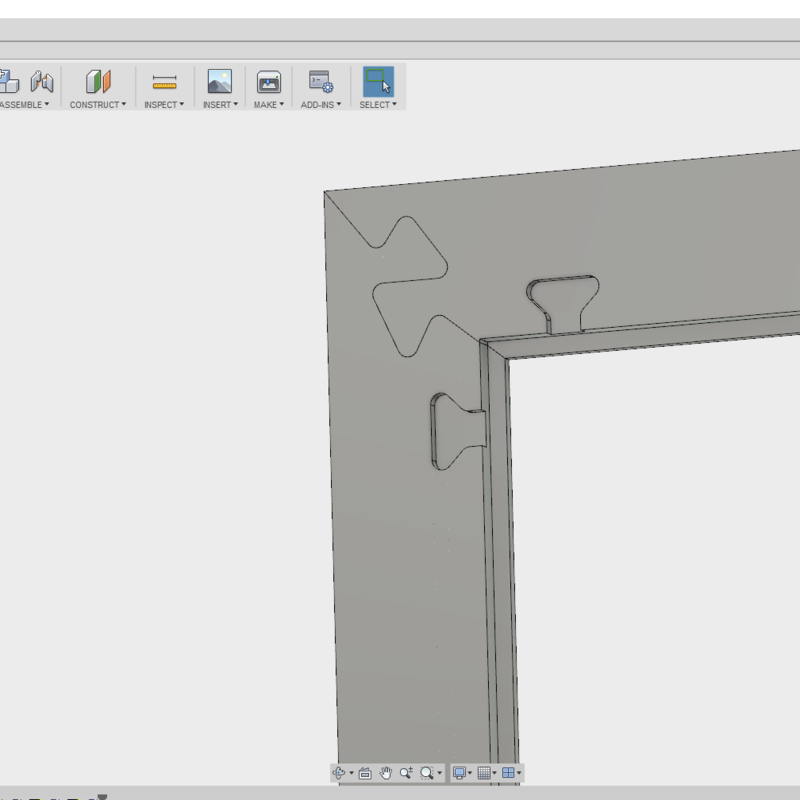 I want to change the design of the window frame a little bit because I wasn't quite satisfied with the outcome of it when I made it in the Computer-Controlled Machining week. I created the window frame out of plywood. Then I will use motors, circuit boards (and the components for that), 3D Printing and more. I will get most of the materials from the fablab for exapmle the wood, 3D printer filament, motors, circuit boards and more. But I will have to buy a few things like the air quality sensor (from sparkfun) and hinges (from the department store). Jumper Wires: A pack of 40 costs $3.95 and I need ca 10 so it'll cost $0,99. 9 mm thick wood: I found a 122x250:9mm Birch Plywood on husasmidjan.is $67,21. I would fit approximately 3 window designs on that plate and therefore the cost would be $22,41. Plexi glass: One clear plexi glass sheet costs $14,13 in Iceland. I would fit 9 designs on one (300x600mm)sheet and the final cost would be $1,57. PLA filament: I have estimated that I have used about 0,3kg of filament that costs $60 dollars a roll. Printing the 3D prints would cost $18. Bearings: They can be quite expensive so instead of buying them I used ones from fidget spinners since they are cheaper. I needed 5 bearings so I bought 2 fidget spinners for $4 each which equals $8. Circuit that communicates with the motor and the sensor. 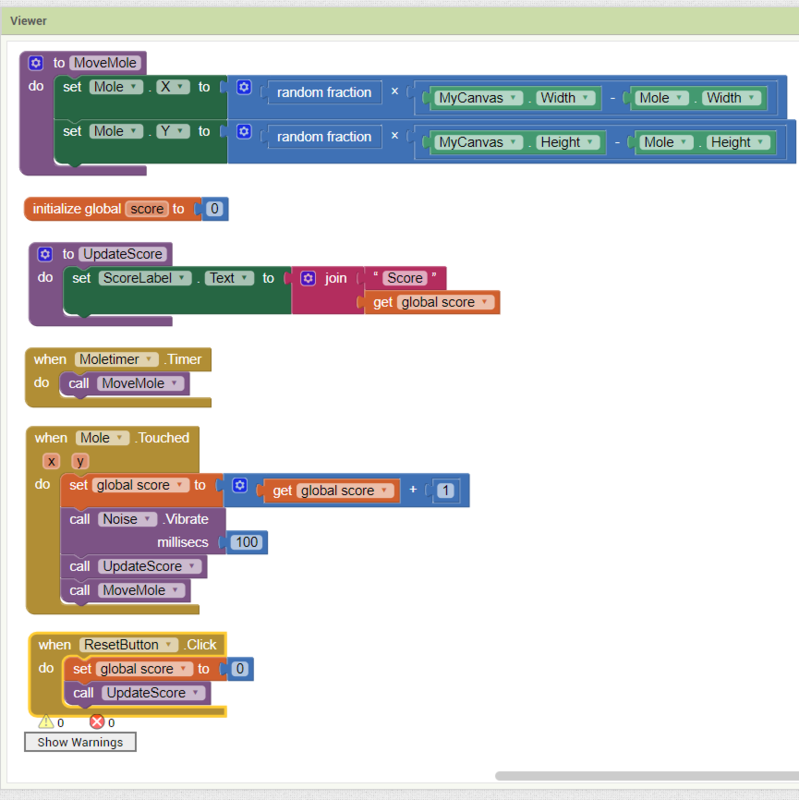 Code so that the motor will react to input from the sensor. Mehcanical part that opens the window. Window frame around the window I have made so that I will be able to provide prove of concept in the presentation. 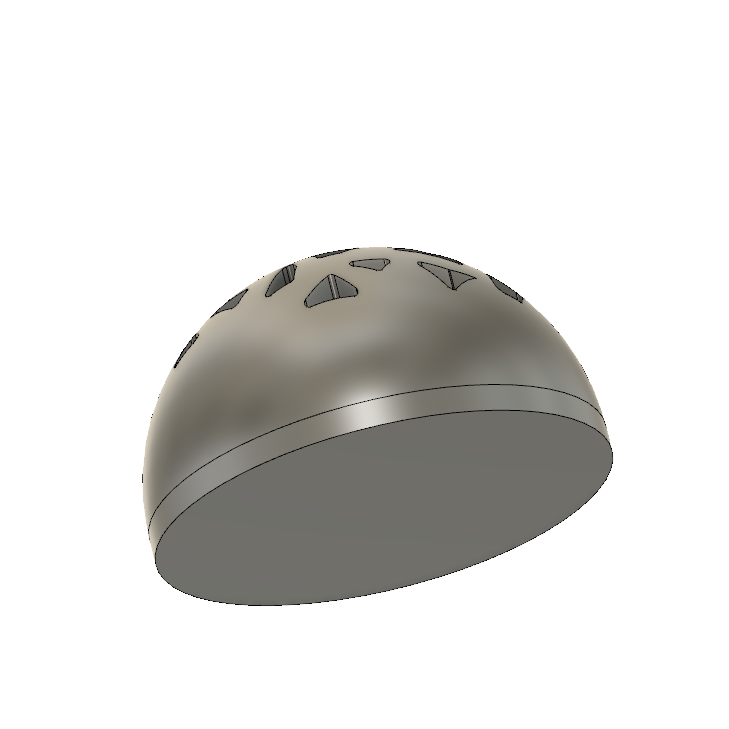 I will design a majority of the things in 3D in Fusion 360. But I will most likely incorporate the 2D design when I am designing the system integration and packaging. 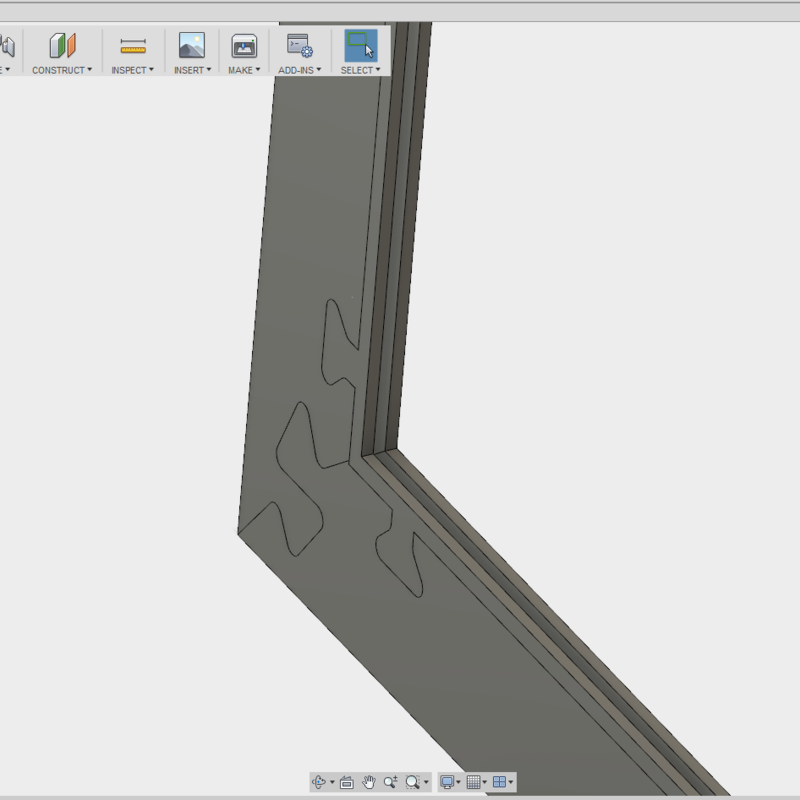 The additive fabrication process I am going to use is 3D printing, which I am going to use in the window opener. 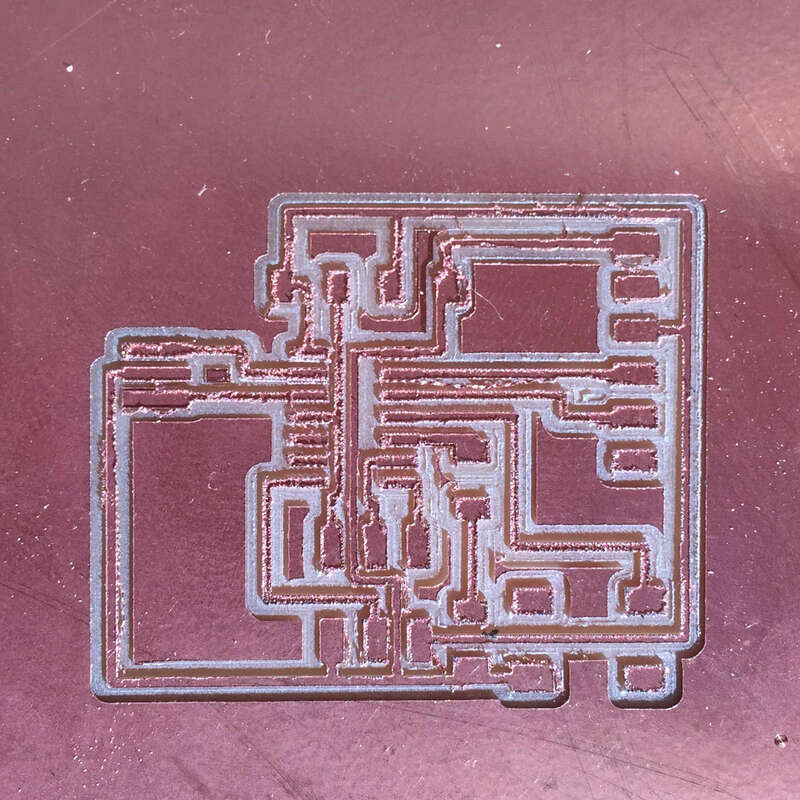 The subtractive fabrication process I am using is lasercutting and milling, both in the modela milling machine milling circuit boards and in the shopbot milling machine. 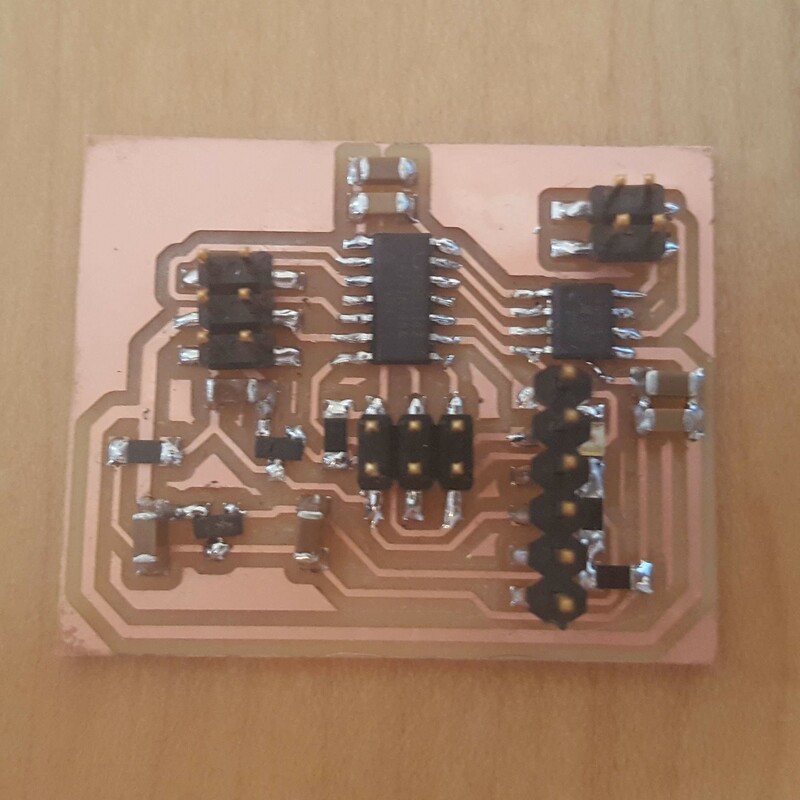 I will use electronics design, electronics production, microcontroller interfacing and programming when I make the circuit boards and program them to communicate with each other and control the motors. I need to figure out if it is better to divide the electronics into multiple circuits where each one only has one purpose or if it is better to have one main circuit that communicates with the one controlling the motors and the sensors. For a final project to be valid it has to incorporate 2D and 3D design, additive and subtractive fabrication processes, electronics design and production, microcontroller interfacing and programming, system integration and packaging. Does the project meet all the requirements above? Is the mehcanical part strong enough to open and close a window? Is the circuit able to read the sensor and send a signal to the motor to either open or close the window? 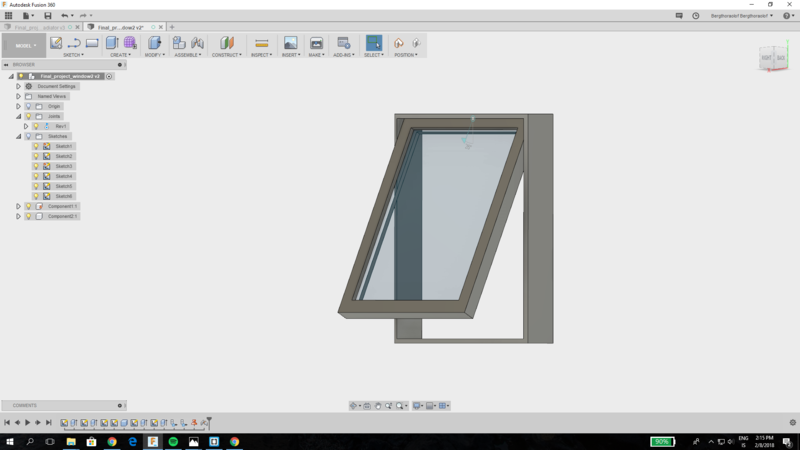 Will it fit on most window designs? Is the system integration good enough? Will it be a long lasting project? How is the final outcome of the project? The assignment for the 20th week was to develop a plan for dissemination of our final project by preparing a summary slide and a video clip. In this weeks lecture Neil talked about different ways we could protect our work. He talked about patents and many other kinds of licenses. For my final project I don't think a patent would be a good idea. Almost anyone who has access to a fablab would be able to make my final project since nearly every component I used is in the fablab inventory. It wouldn't be possible to prevent people from doing so and there also wouldn't be a reason to because I wan't people to be able build up from my work. What I think would be a better idea is to use Creative Commons (CC). The Creative Commons license is a public copyright license that allows sharing and adapting the copyrighted material. Sharing stands for copying and redistributing the material in any medium or format. Adapting stands for remixing, transforming, and building upon the material for any purpose, even commercially. 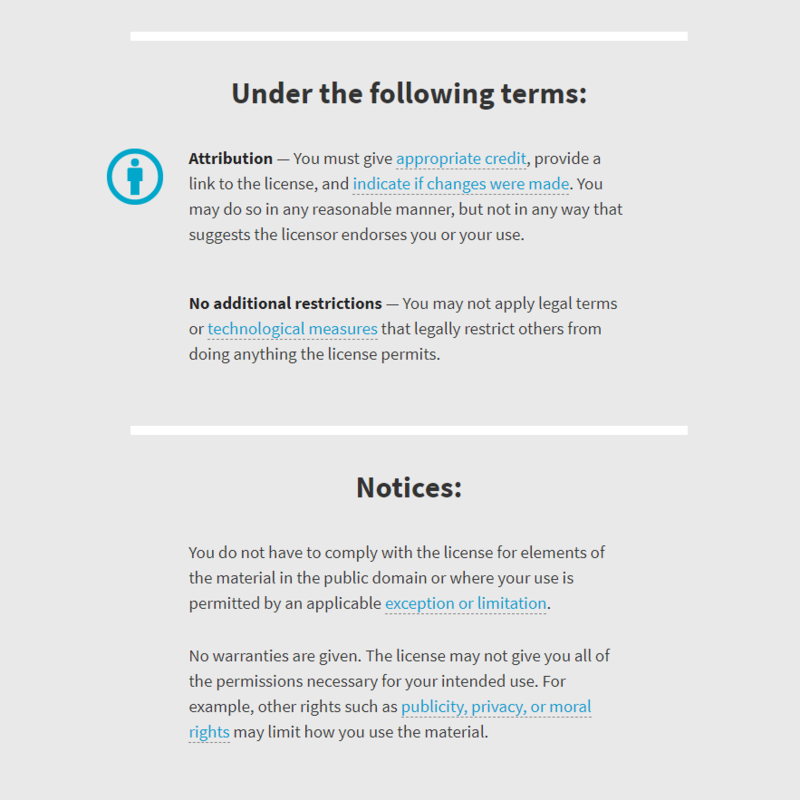 However there are some terms you'll have to follow when sharing or adapting work licensed with creative commons. You can see those terms and notices here below. 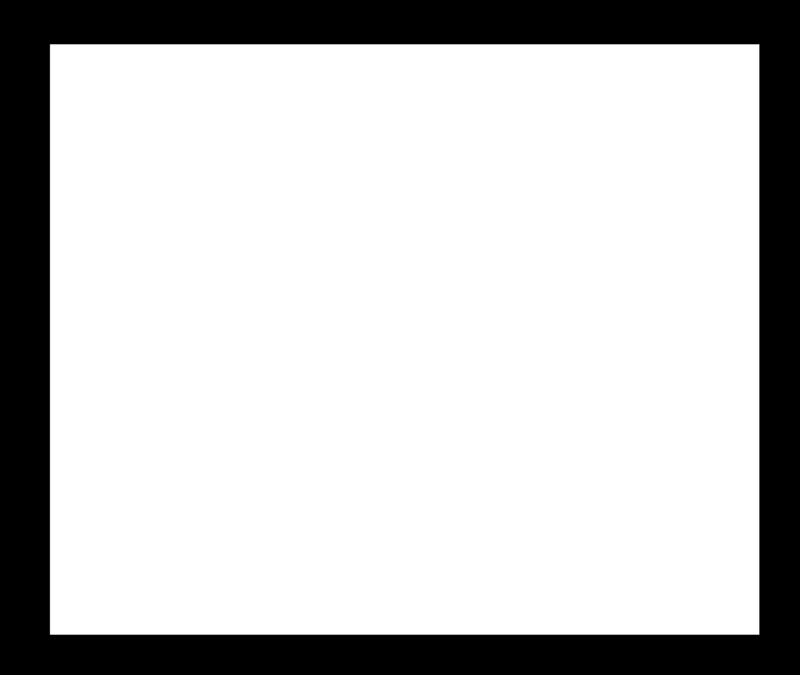 When material is licensed with creative commons this simbol, text and link is displayed. To find out more about Creative Commons you can click on the link above or if you want to use the license for your own material you can do that here. I could continue working on my final project after Fab Academy is finished but I don't think I will. But if anyone is interested in collaborating with me or using my work they are welcome to do so under the terms of Creative Commons. The Creative Commons license will not give me any profit when my work is used since the material is free to use but I will be credited for anything based on my work. If I wanted to start production of my final project the first thing I would do before trying to get funding is to get people with different set of skills to collaborate in making the project as user friendly as possible. But to keep on developing the project and to be able to promote it I would most likely need funding. Since I don't have the resources to start to manufacture my final project I would need to get some sort of funding. There are a lot of ways to get funding but the first one that comes to mind is talking to the innovation center of Iceland. They often work with startup companies and advice them on what would be the most sensible and profitable way to keep on developing the product or company. They also sometimes help people to find grants. I have found some examples of grants you can get in Iceland for example tækniþróunarsjóður which roughly translates to technology development fund. They offer grants to projects or companies that support the development of technology. There are also some international grants I could apply for but I think it would be best to start the funding in Iceland. If I were to get funding and start selling my final project I would most likely only use online advertising to promote it. One form of online advertising is on various social media platforms and I would probably use those the most since that is one of the most used platforms to advertise all sorts of things. I would also create a proper website that would contain all the information about the project. I would try to get other companies to work with me, preferably someone working in technology development aswell. I would for example show an advertisement from them on my site in return for me having an advertisement on their site. 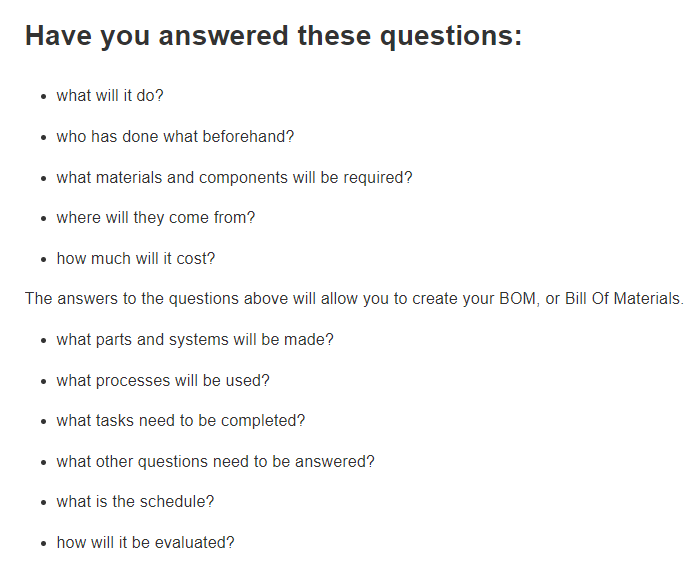 The assignment for the 21st week was to complete our final project and tracking our progress by answering the questions below. Made the final project board and tried programming it to communicate with the motor and sensor. 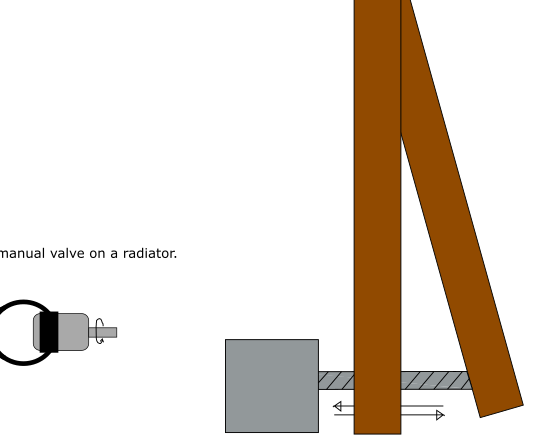 Started designing the mechanism for the window opener. Made the window to show the window opener in action. Putting it all together and improving the documentation. What has worked and what hasn't? Everything up until now has worked except for the air quality sensor which I am having trouble programming. 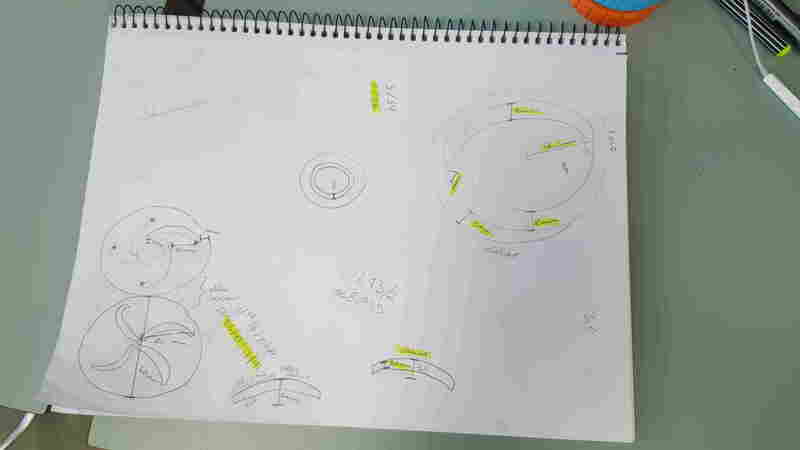 How I am going to design the mechanism. How I can resolve the problems with the sensor. I will use all the time left until the final project presentation to work on my final project. 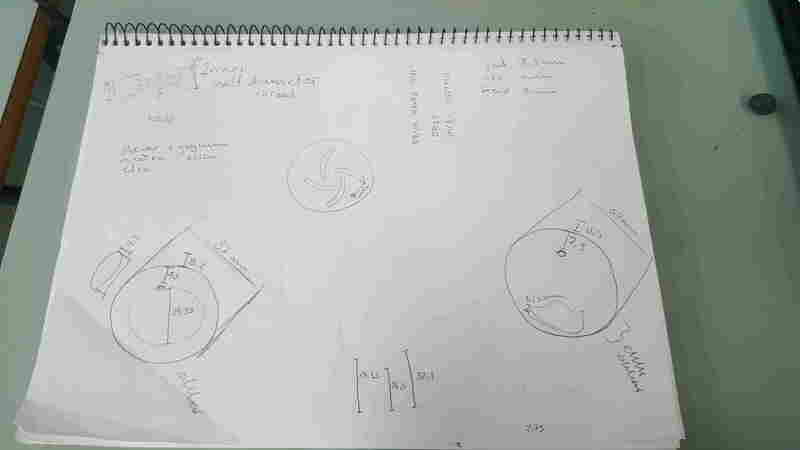 First I will design the mechanism and then I will figure out the programming for the sensor. I have learned so much while making my final project and while doing all the other assignments. Before Fab Academy I didn't know anything about electronics or programming and I had never even made a circuit board before. I had only used the lasercutter, 3D printer, vynilcutter and the shopbot so everything else was totally new to me. I think all the information I have gained while doing Fab Academy will be really useful for me in the future. The assignment for the 22nd and the last week was to document a final project that integrates the range of units covered, and to present our final project, weekly assignments, and documentation. This weeks assignment is documented on my Final project Page .